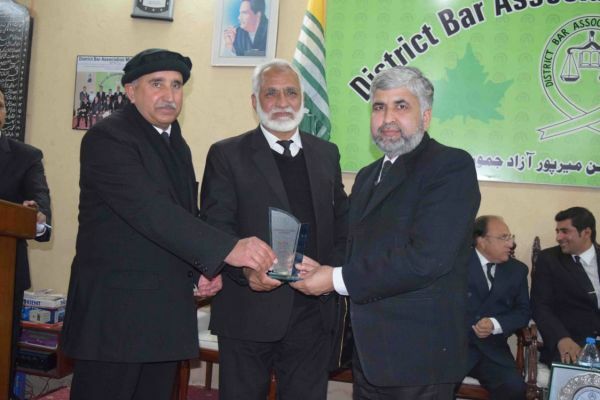 The Honorable Chief Justice of Azad Jammu & Kashmir Mr Justice Ch. 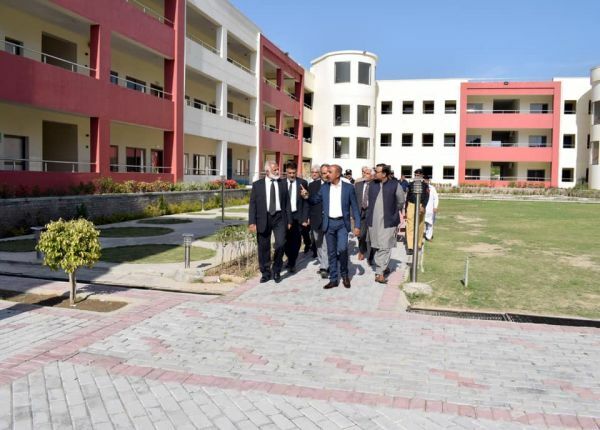 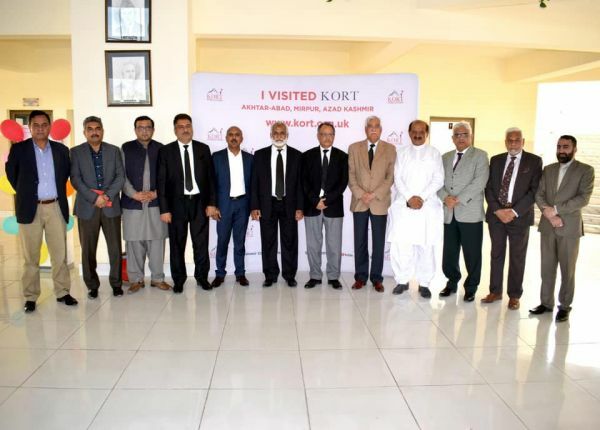 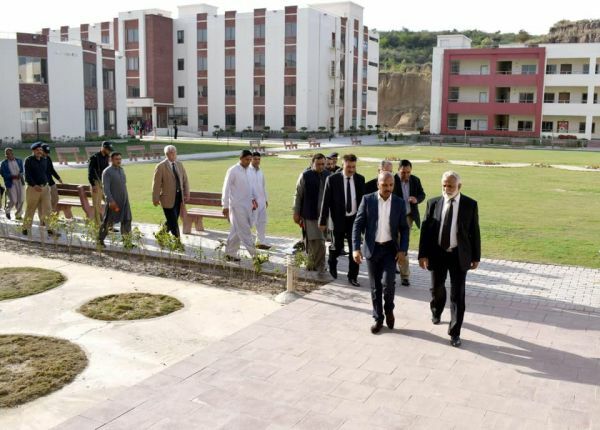 Muhammad Ibrahim Zia visited Kashmir Orphan Relief Trust (KORT) Educational Complex Akhtarabad Mirpur on 26-03-2019. 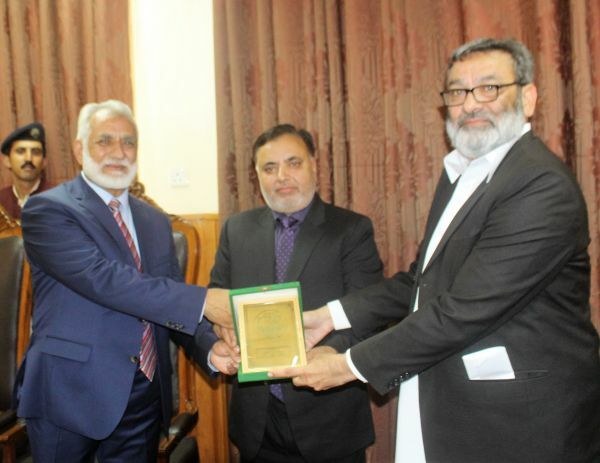 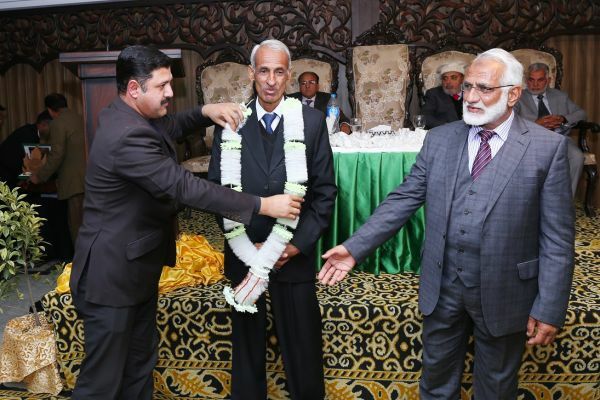 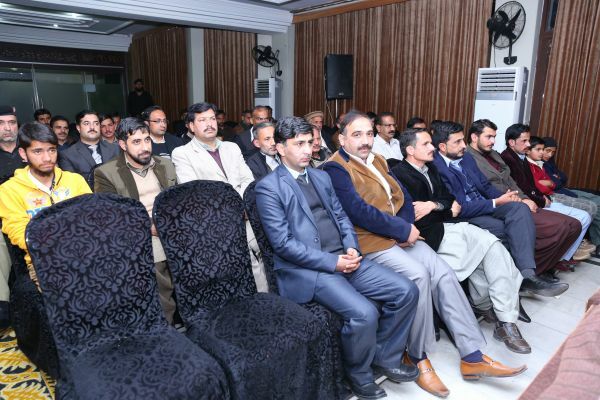 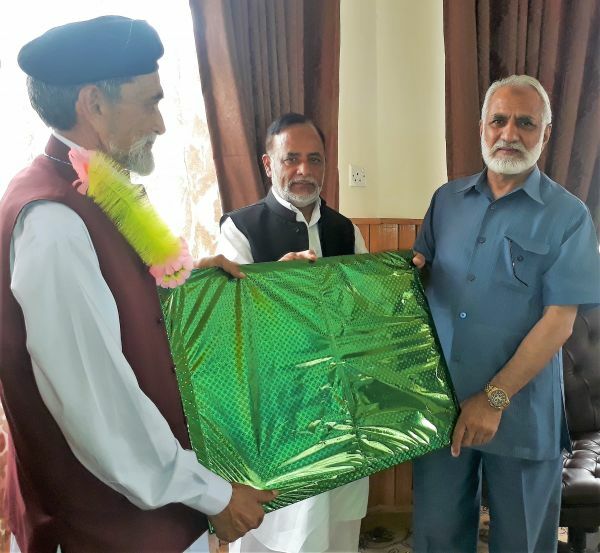 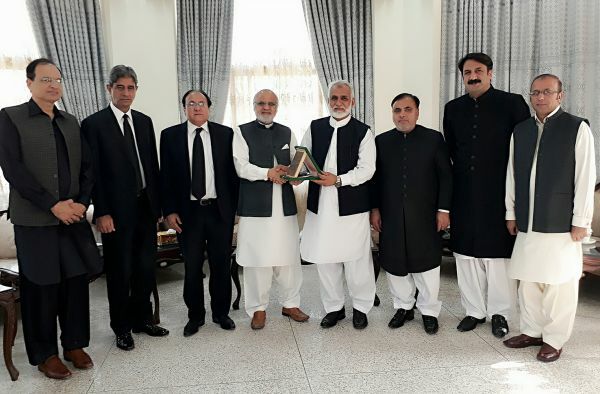 A farewell party was hosted in honour of outgoing Registrar Supreme Court of Azad Jammu & Kashmir Sardar Mohammad Rahim Khan. 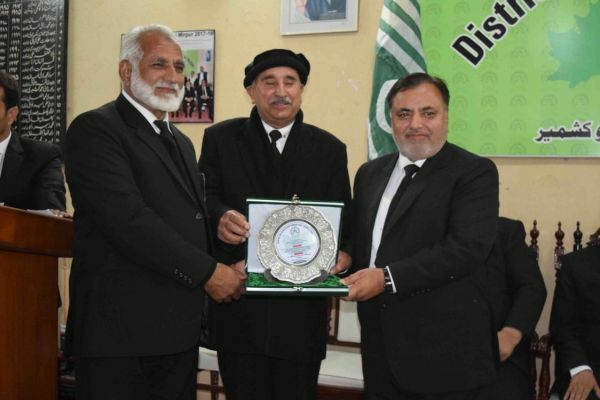 The Honorable Chief Justice of Azad Jammu & Kashmir Mr Justice Ch. 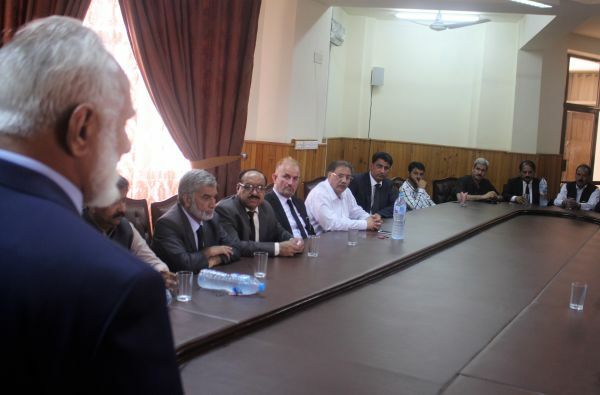 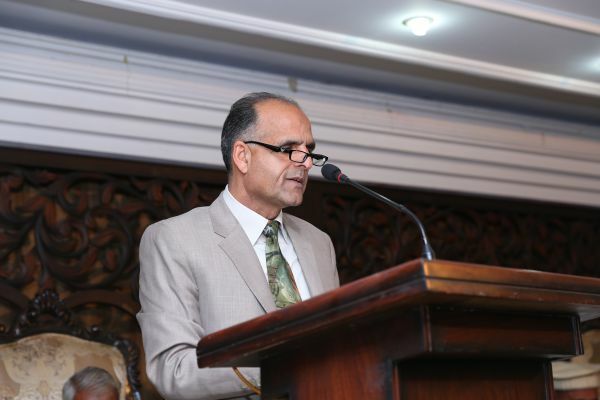 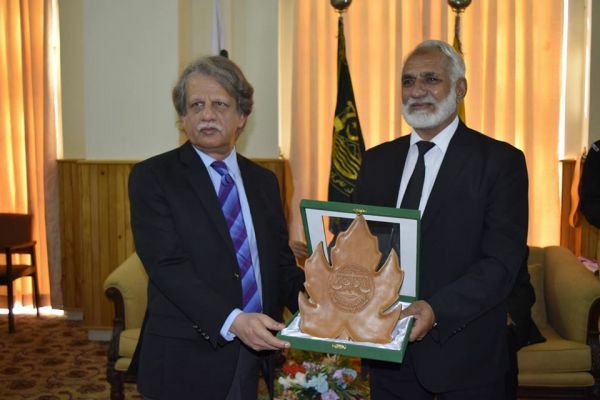 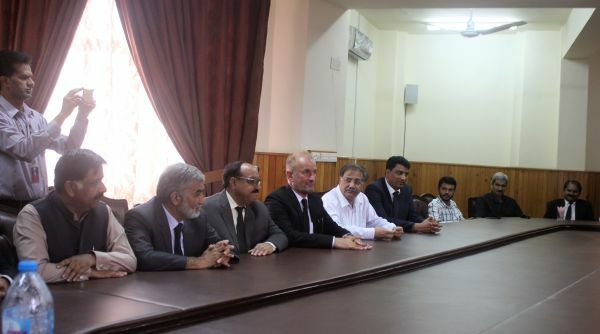 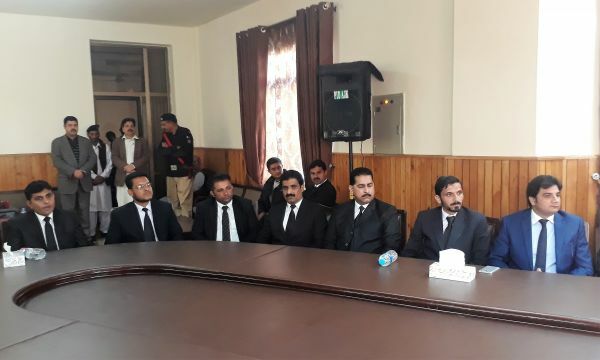 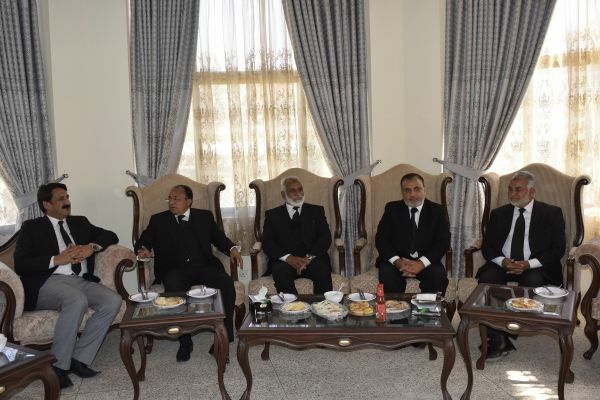 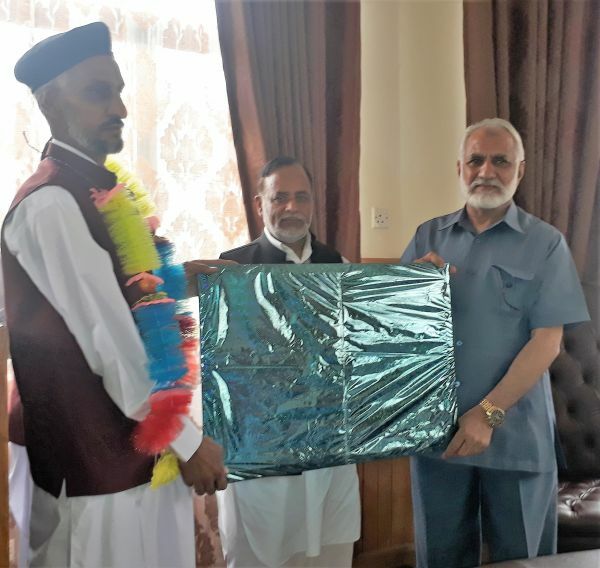 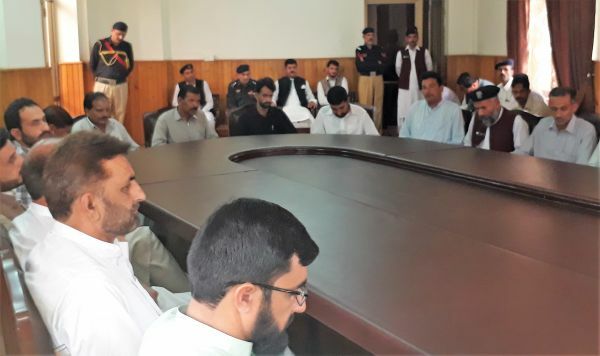 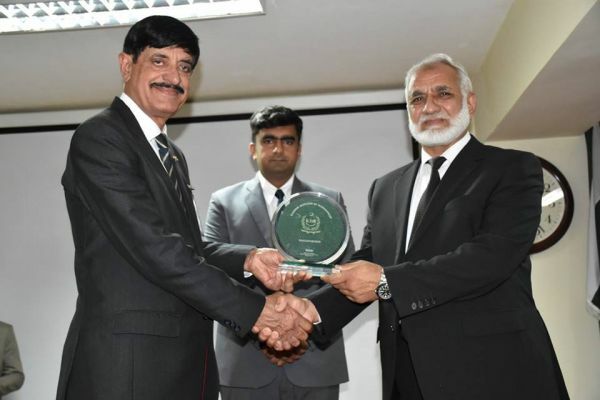 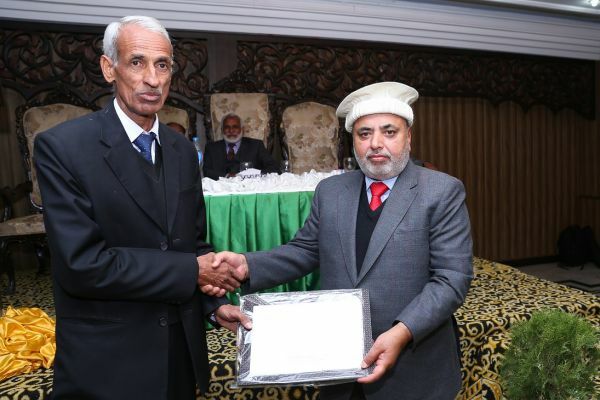 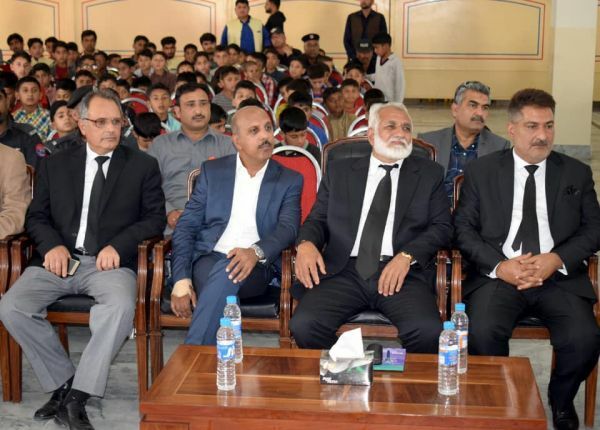 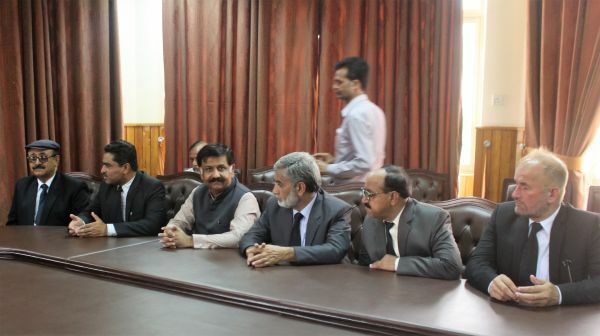 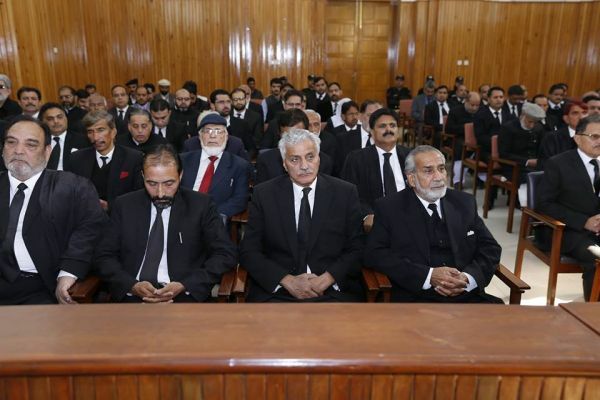 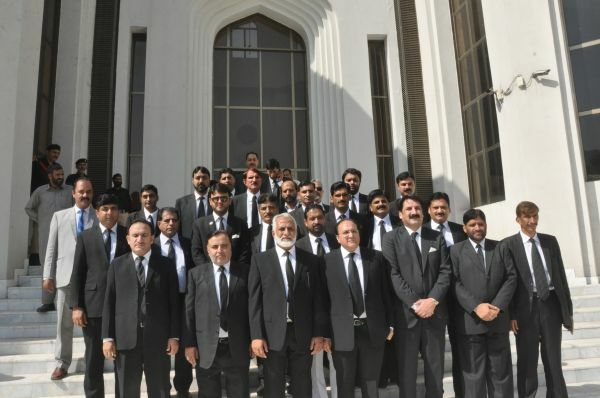 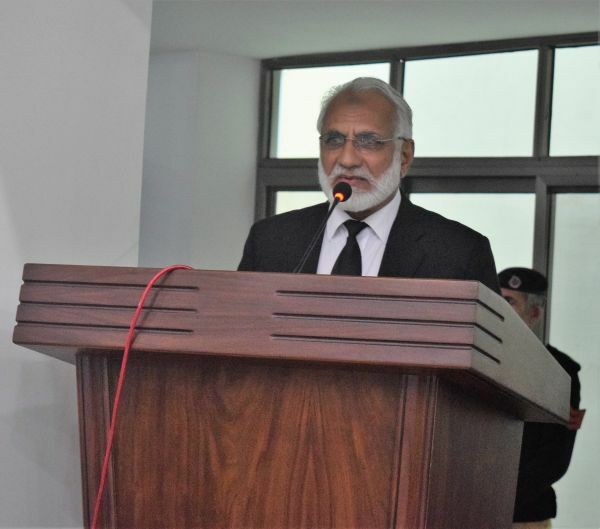 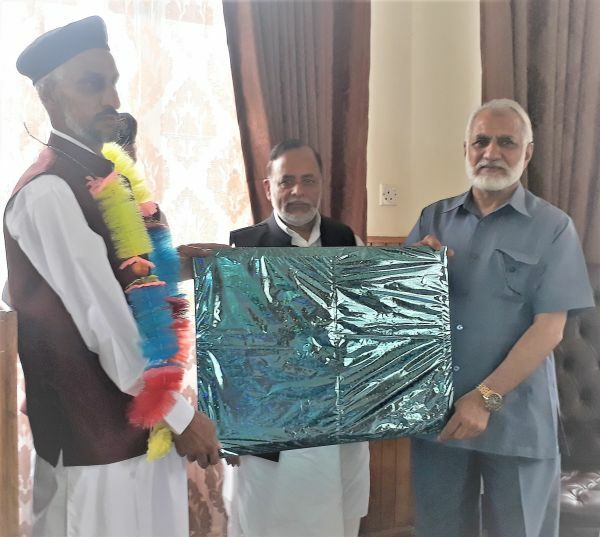 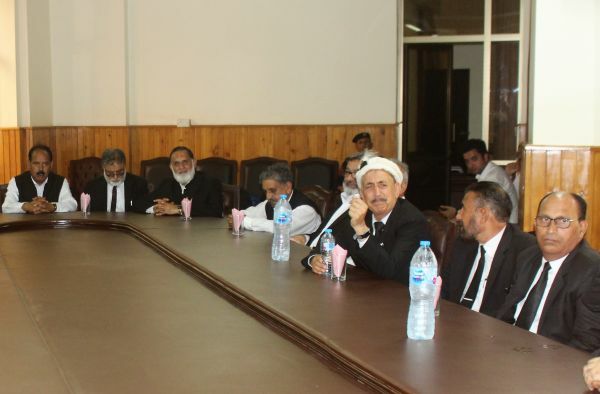 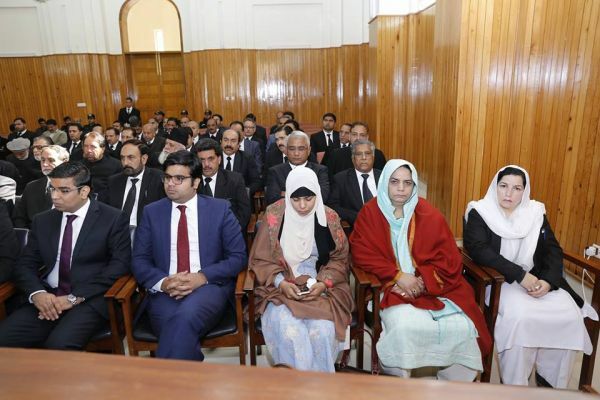 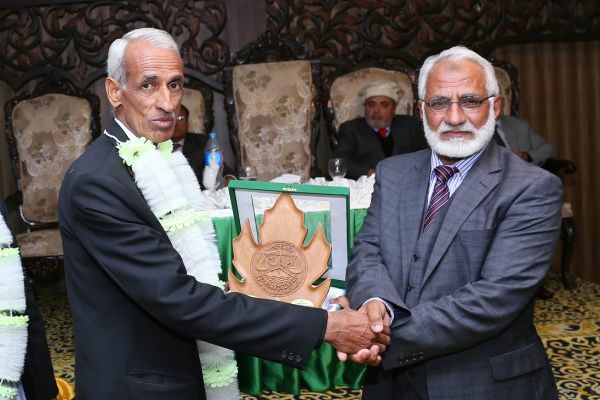 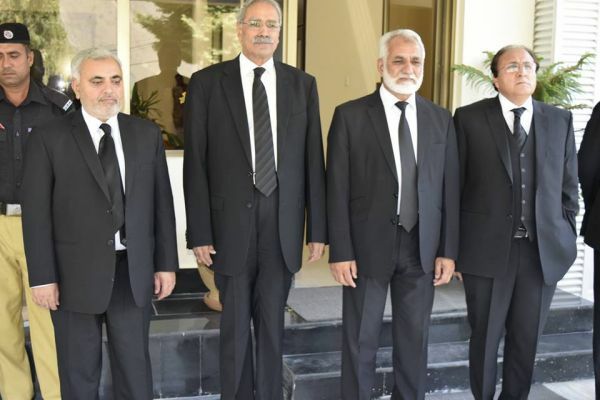 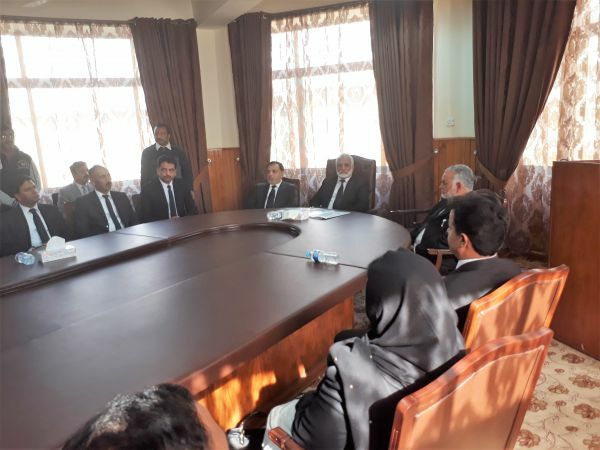 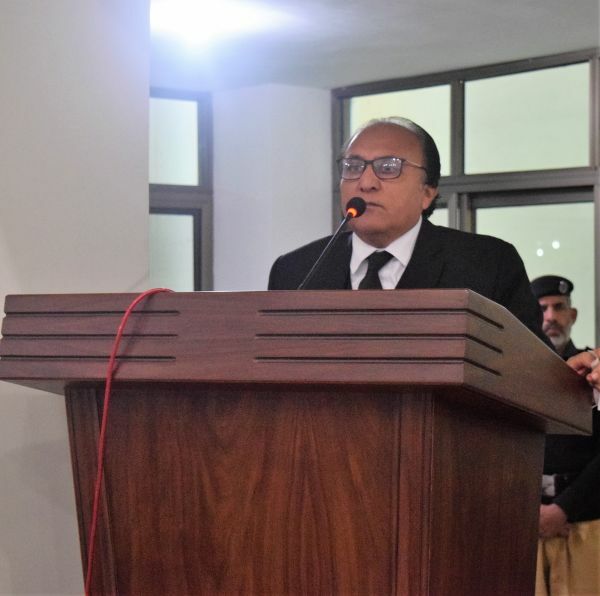 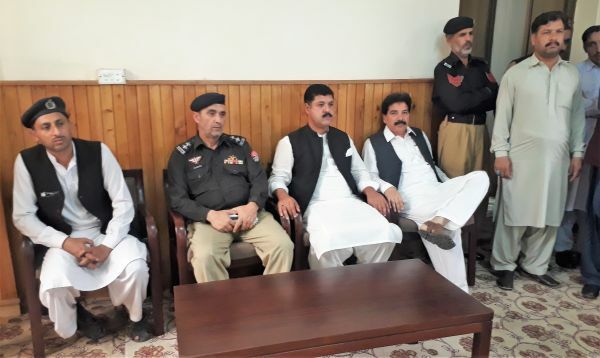 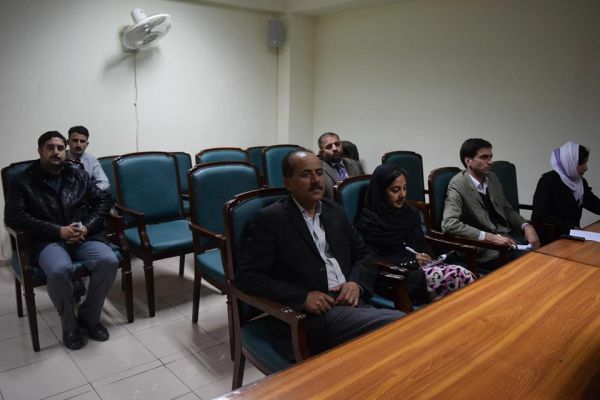 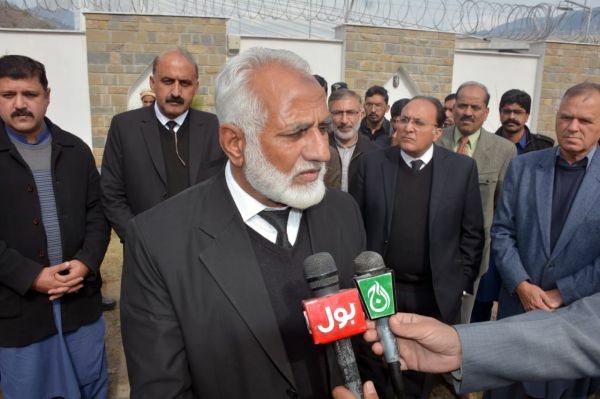 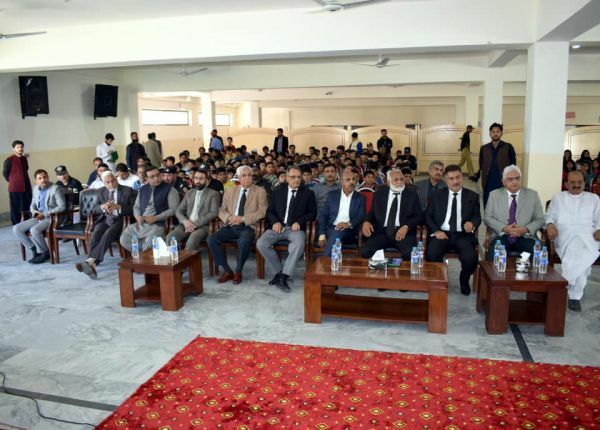 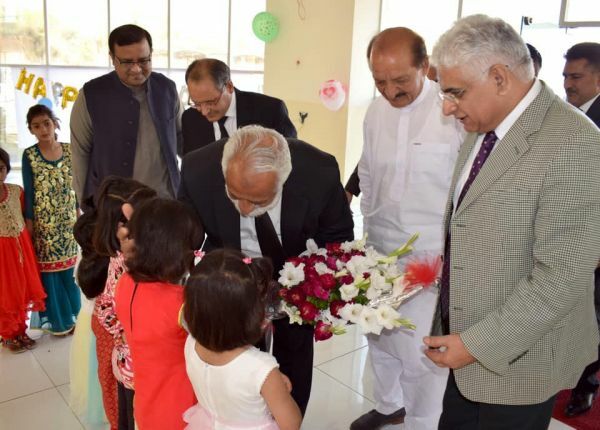 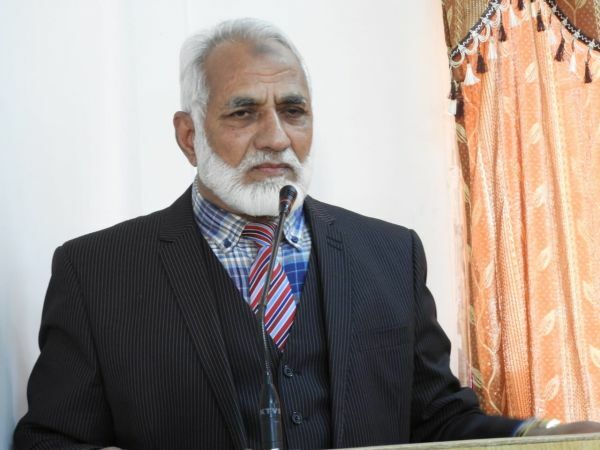 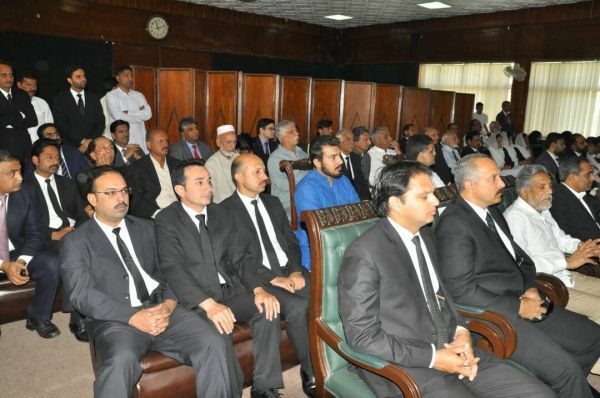 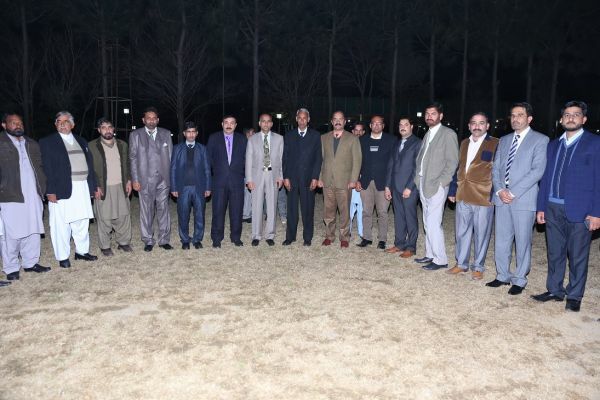 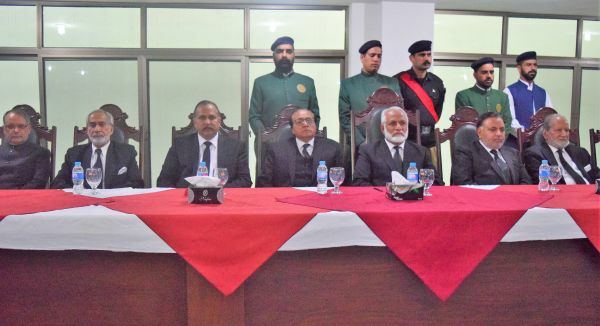 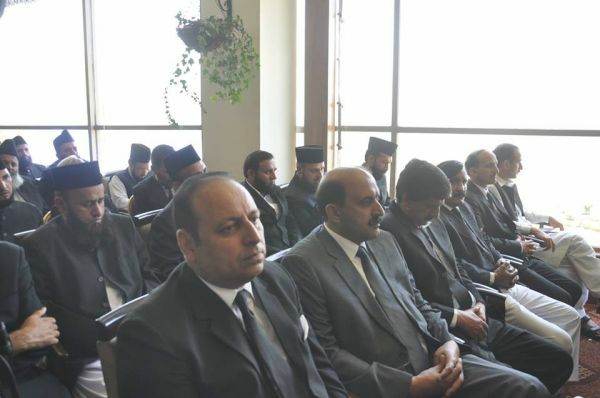 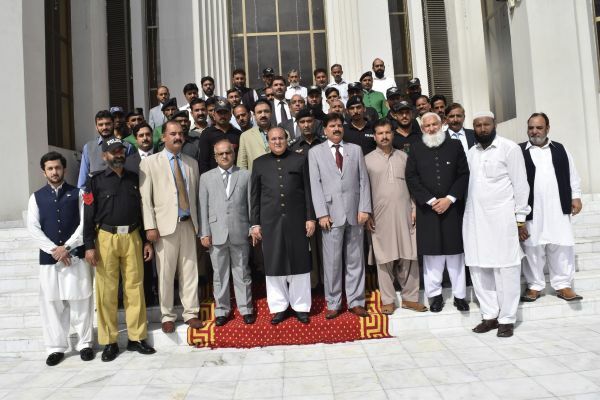 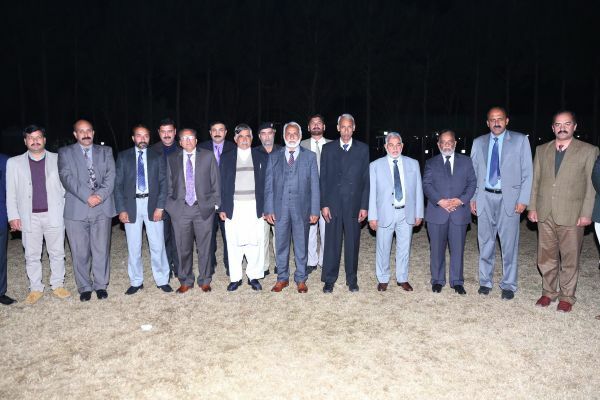 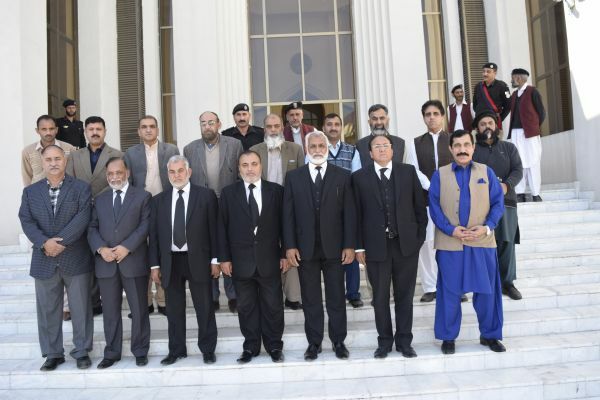 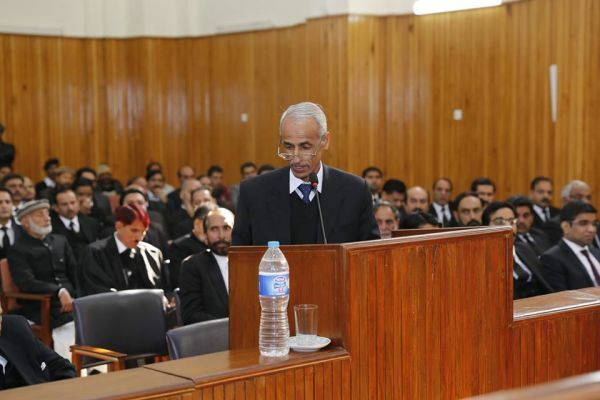 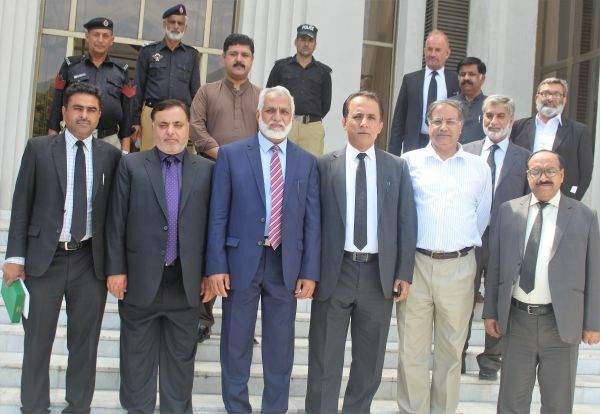 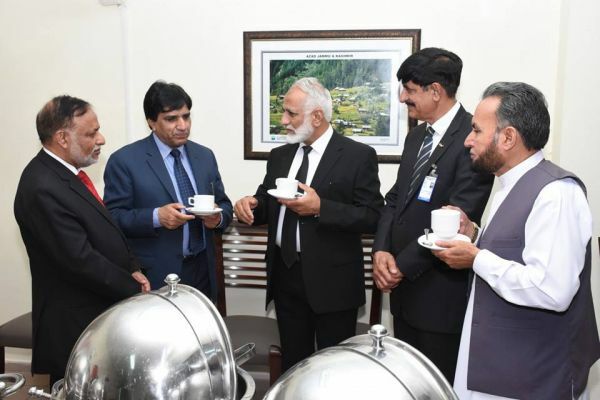 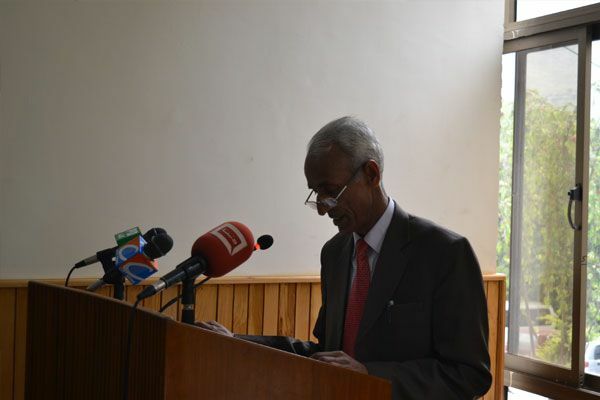 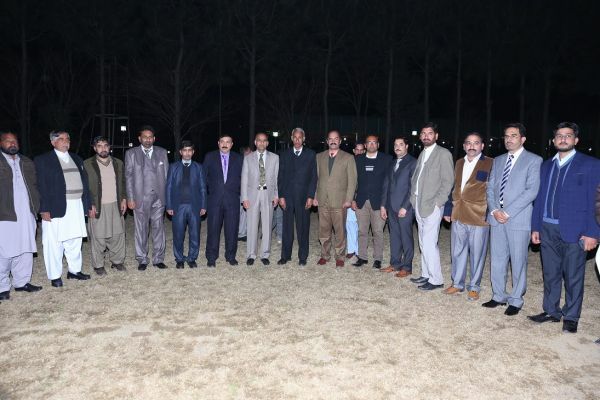 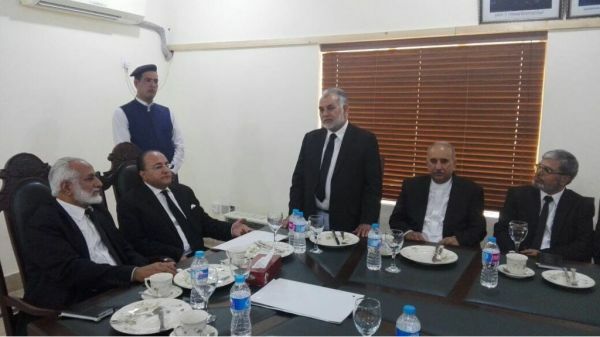 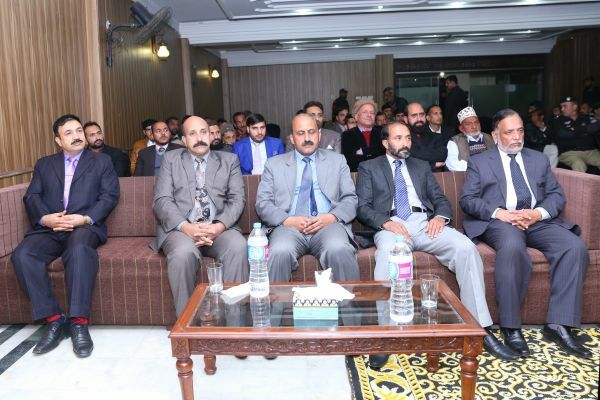 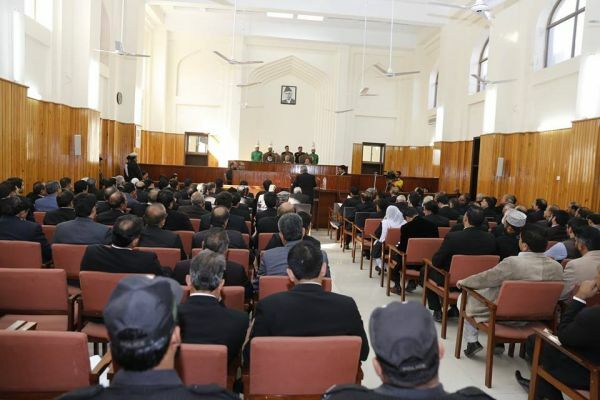 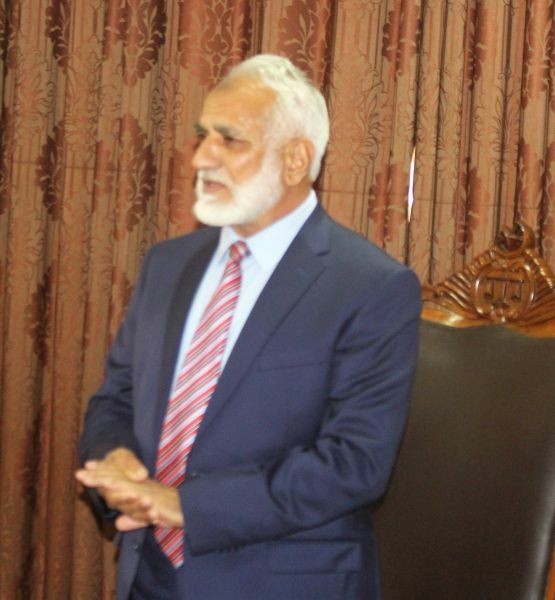 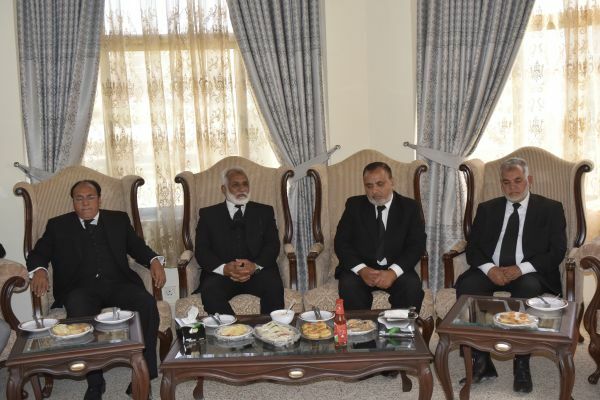 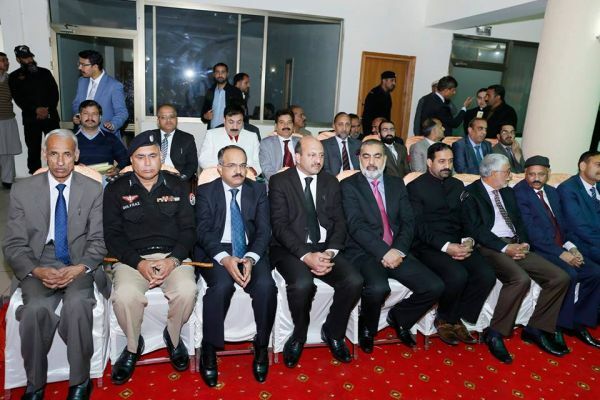 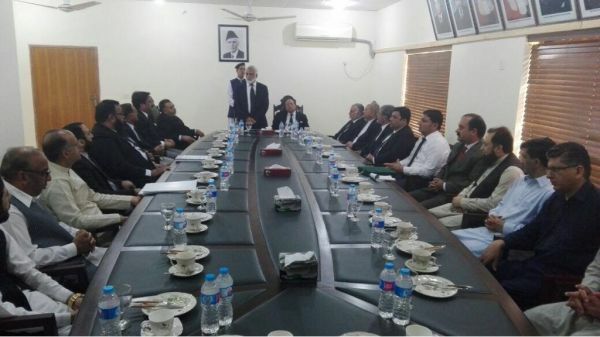 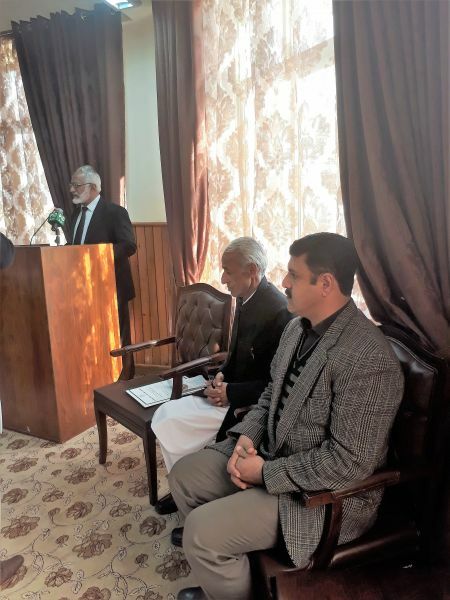 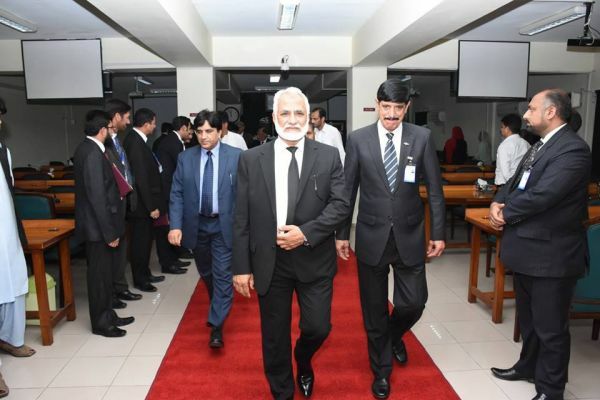 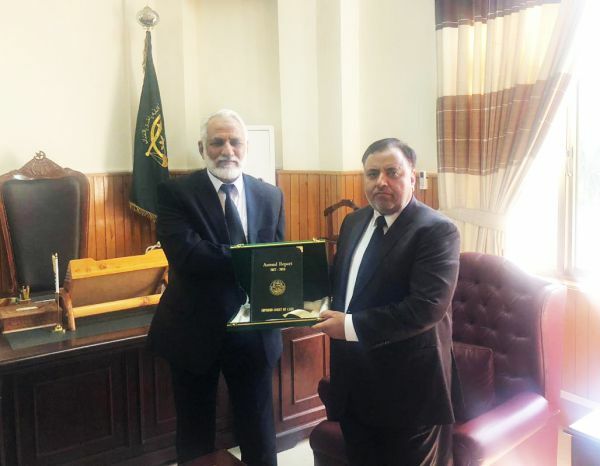 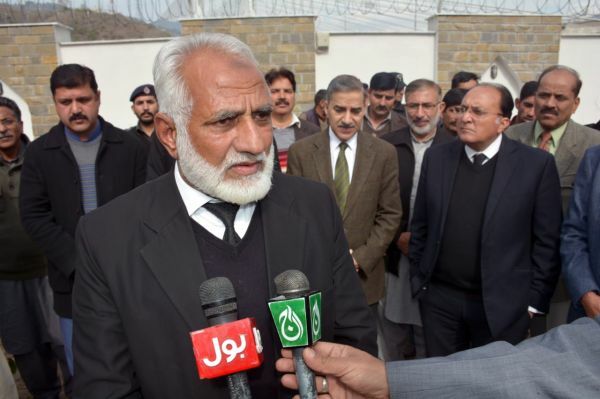 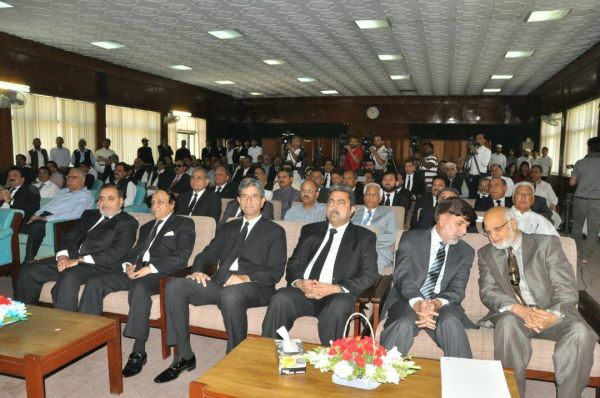 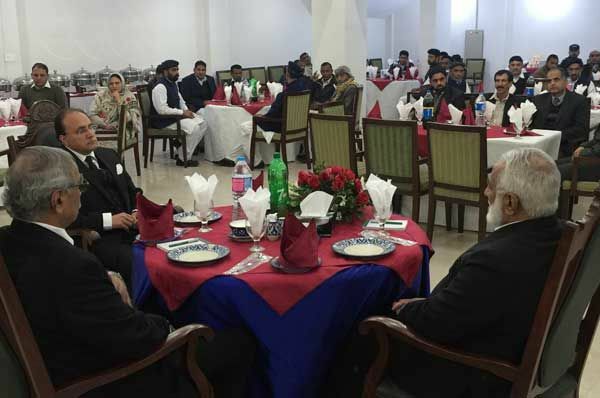 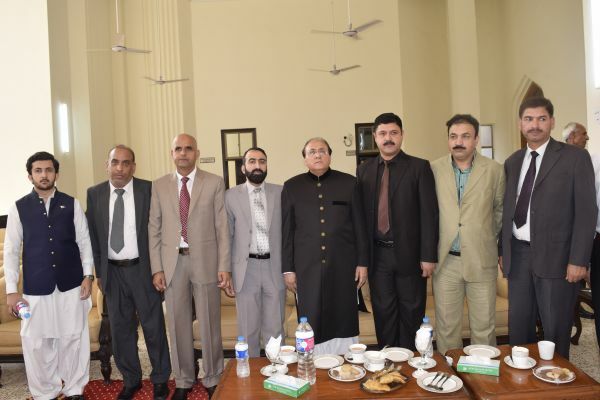 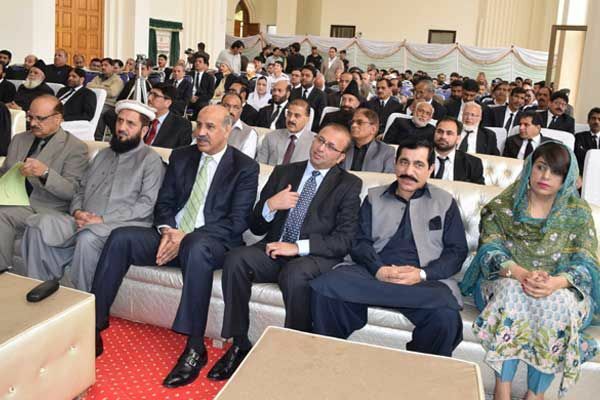 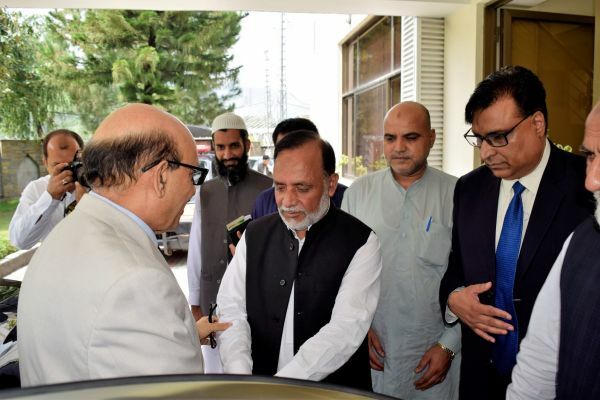 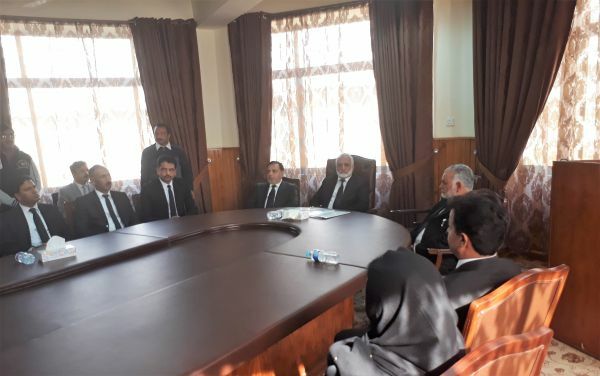 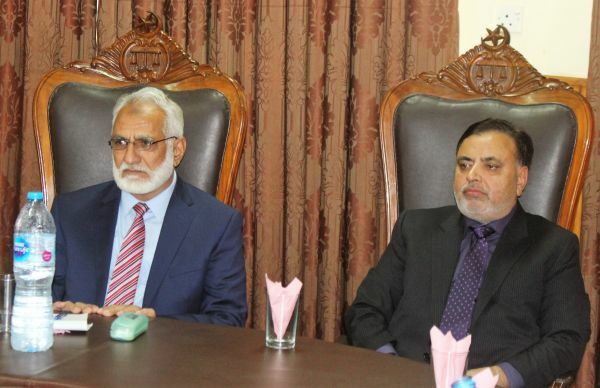 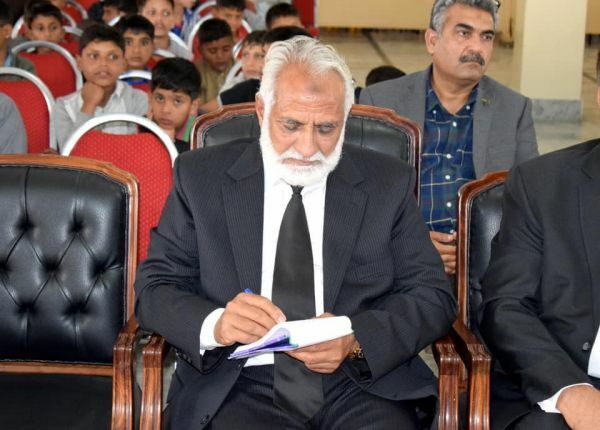 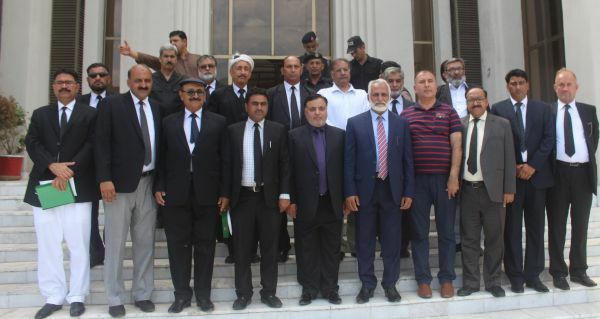 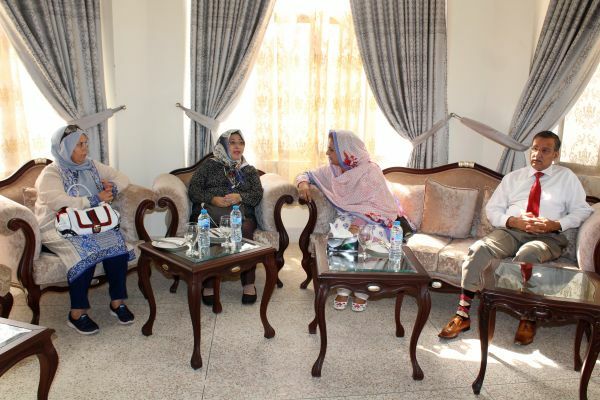 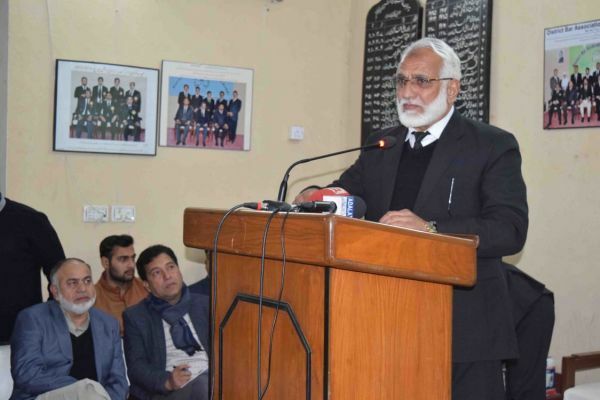 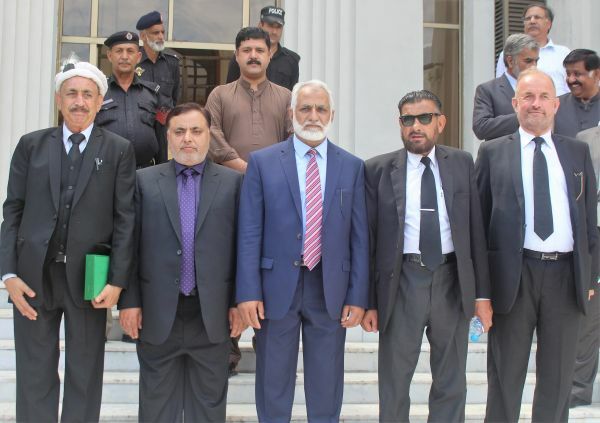 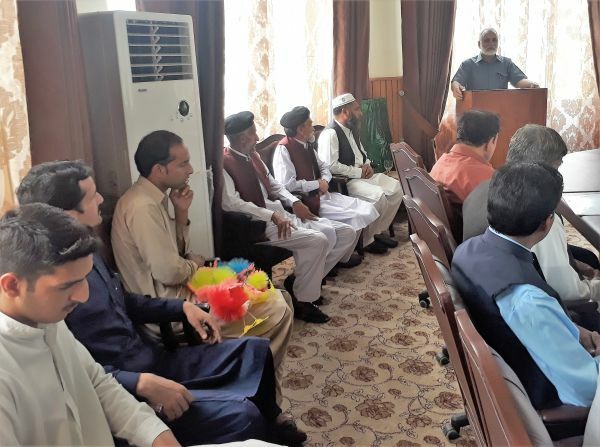 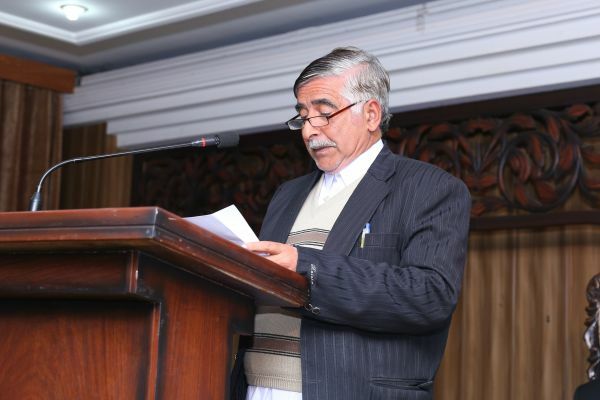 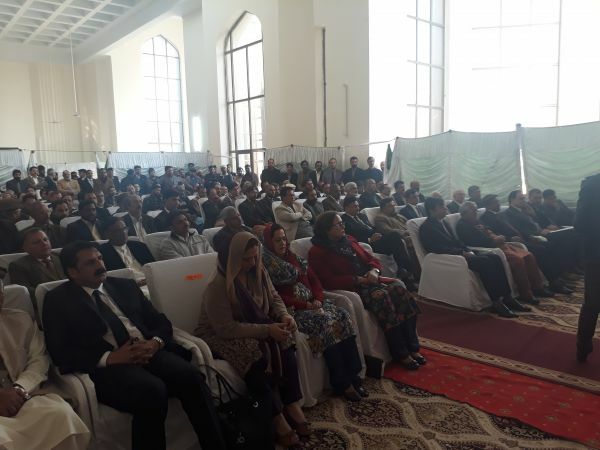 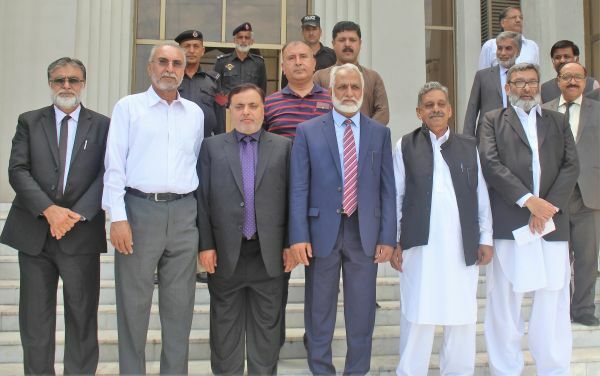 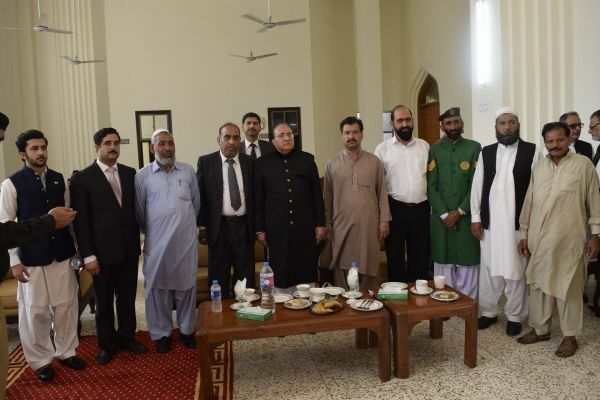 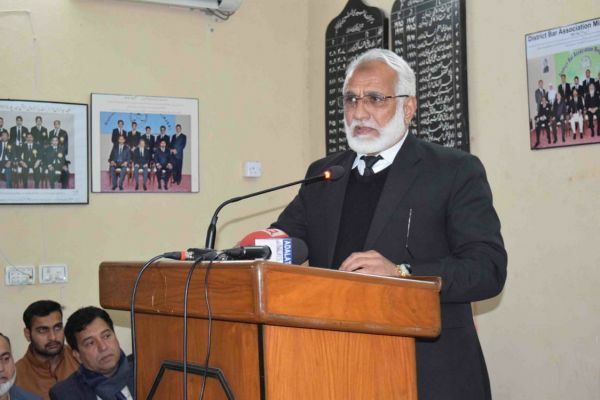 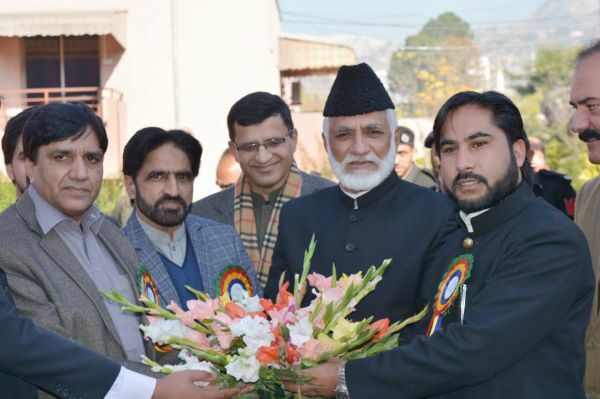 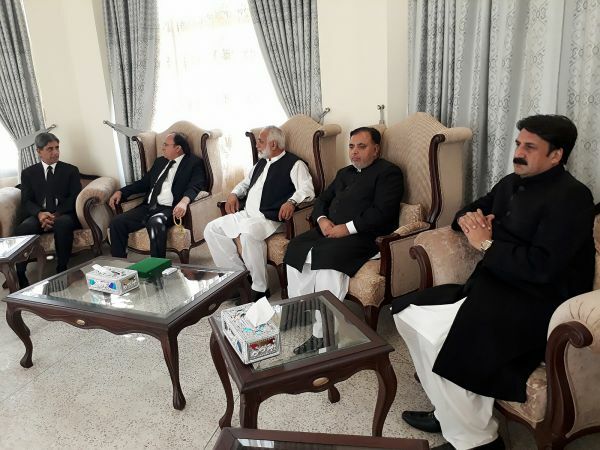 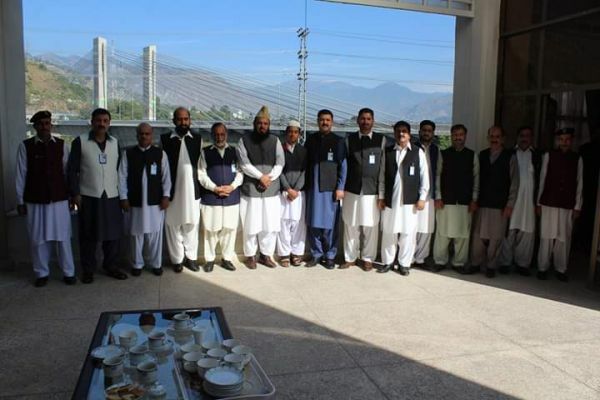 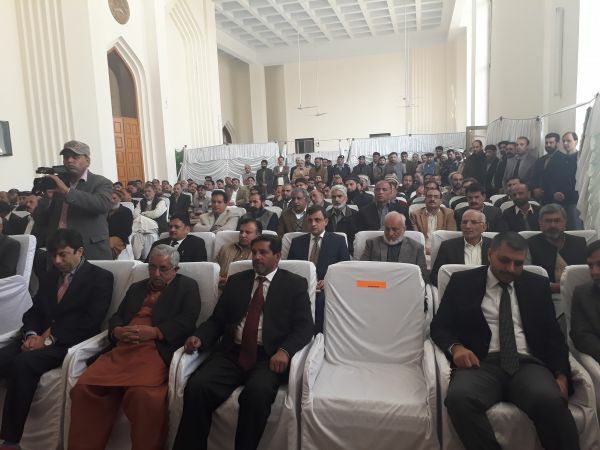 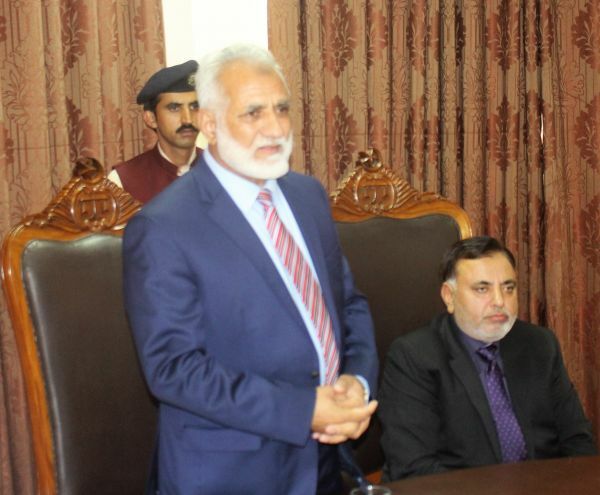 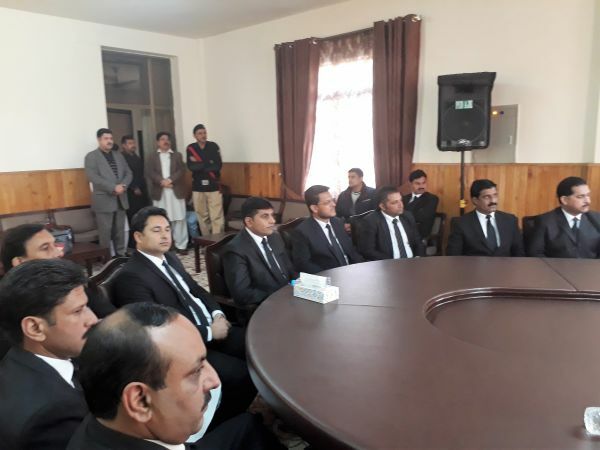 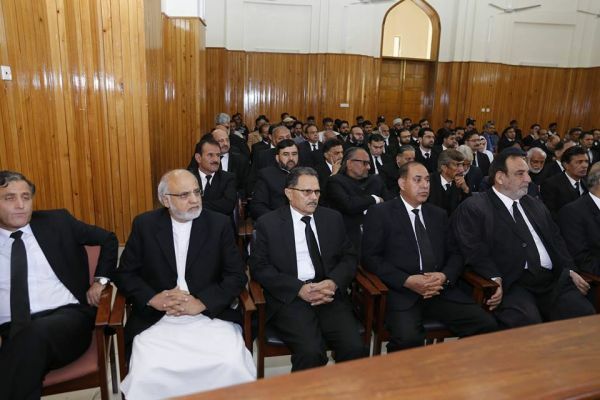 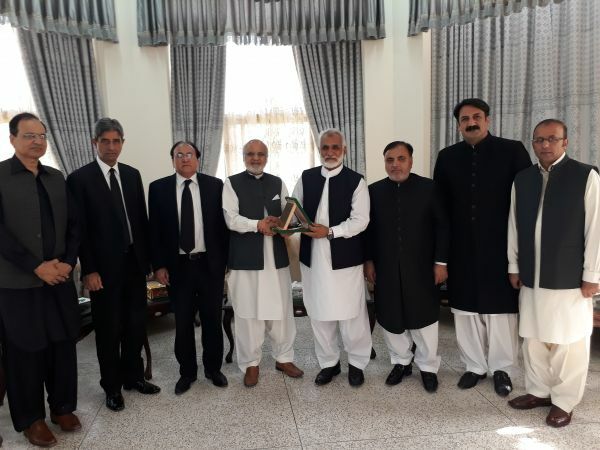 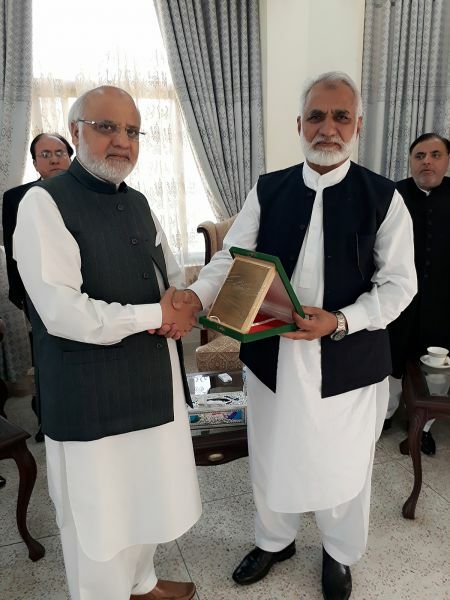 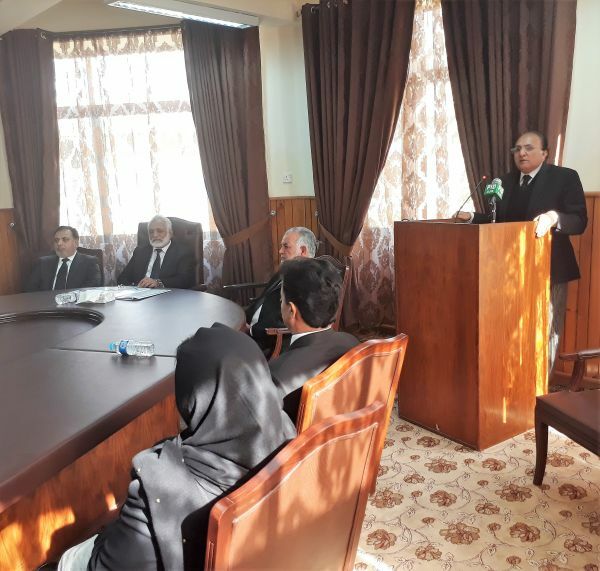 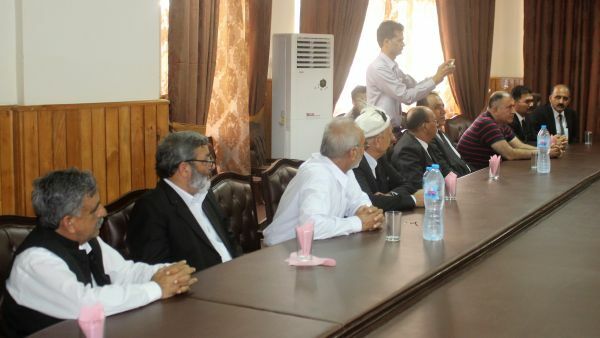 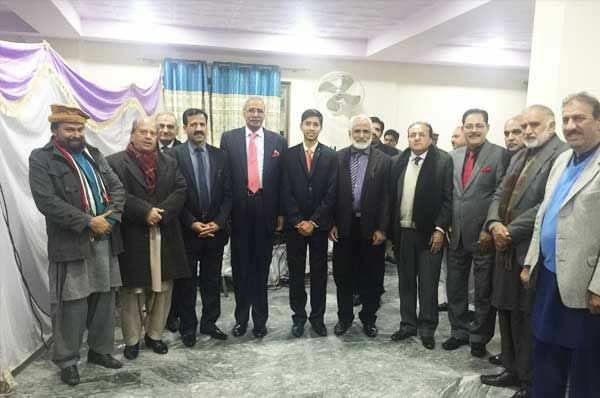 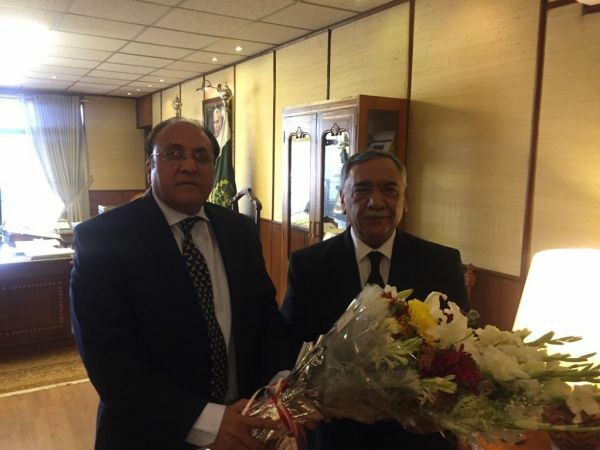 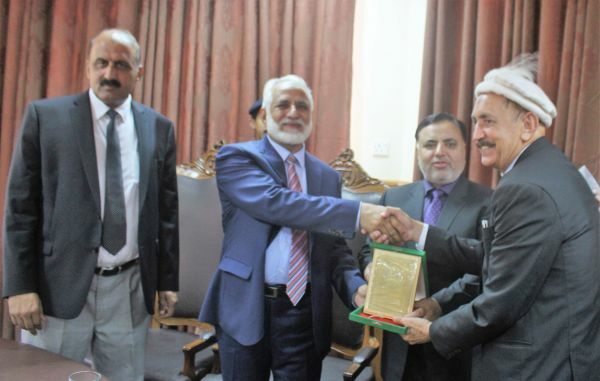 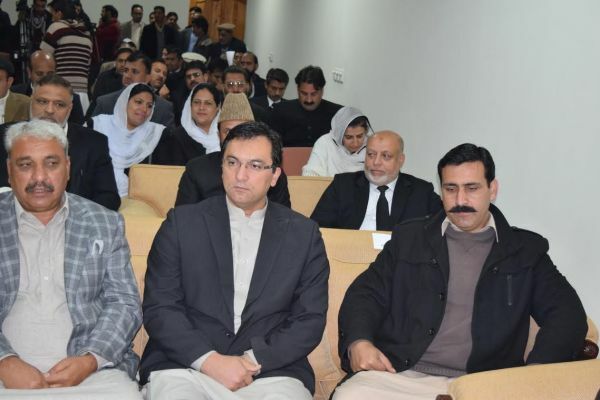 Muhammad Ibrahim Zia ,Honorable Judge of the Supreme Court,Officers & Officials of the Court hosted the farewell party on 15th March 2019 at Supreme Court building Muzaffarabad. 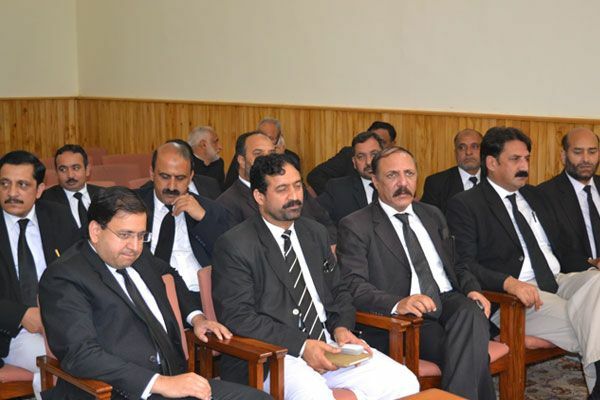 Honorable Chief Justice of Azad Jammu & Kashmir Mr Justice Ch. 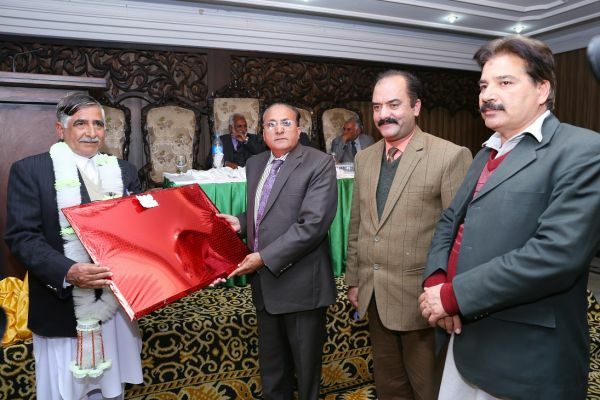 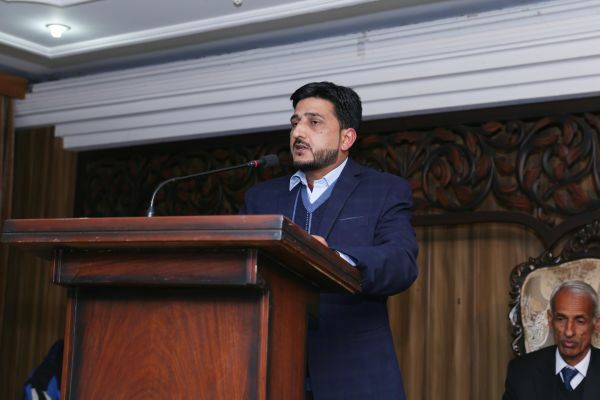 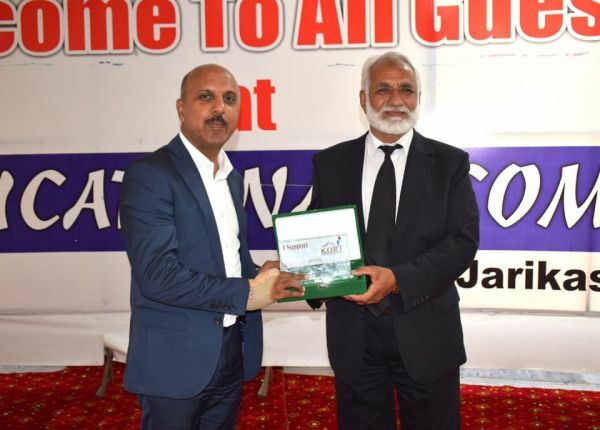 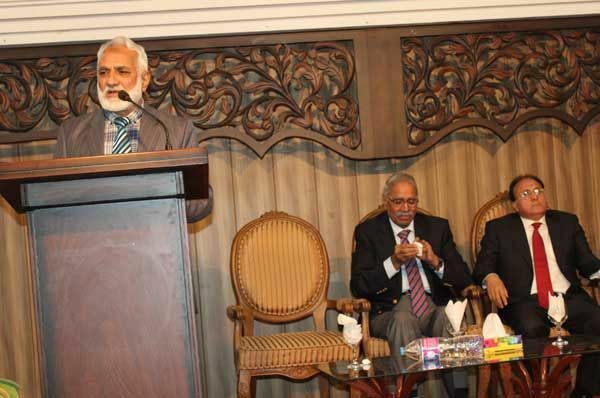 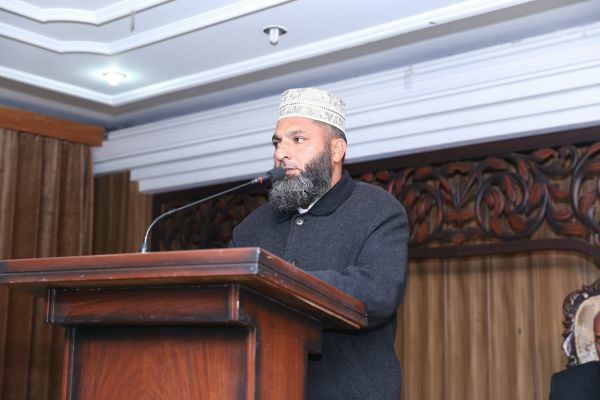 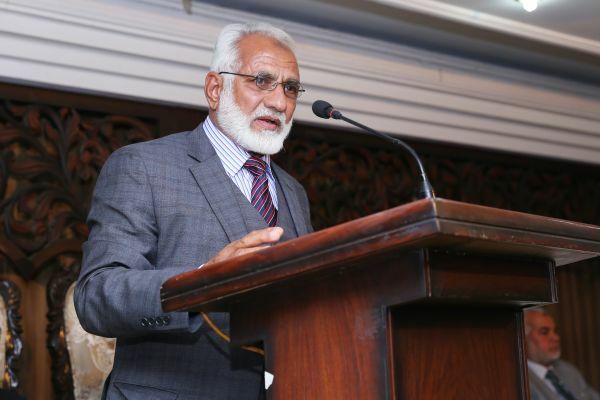 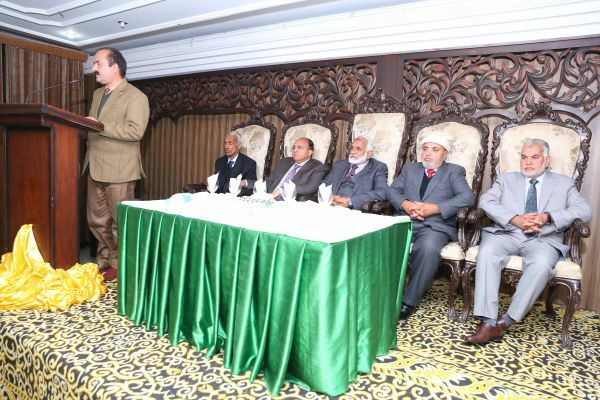 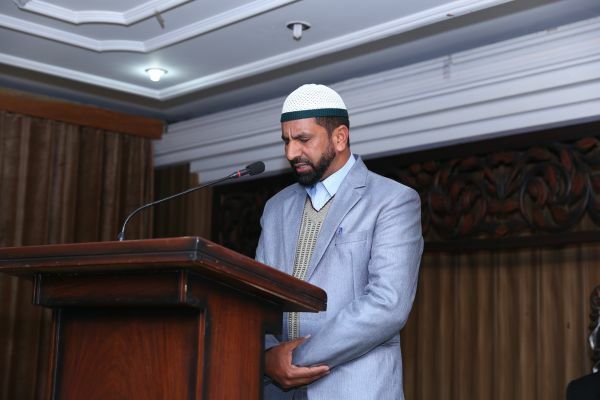 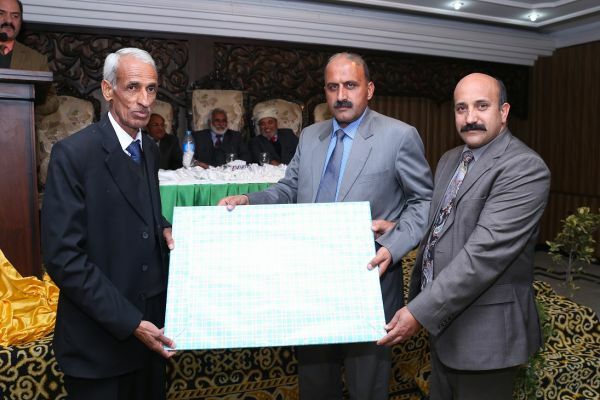 Muhammad Ibrahim Zia while addressing to seminar on ICONIC PRISONERS IN KASHMIR at Ramada Hotel Islamabad and giving shields to the participants of the seminar. 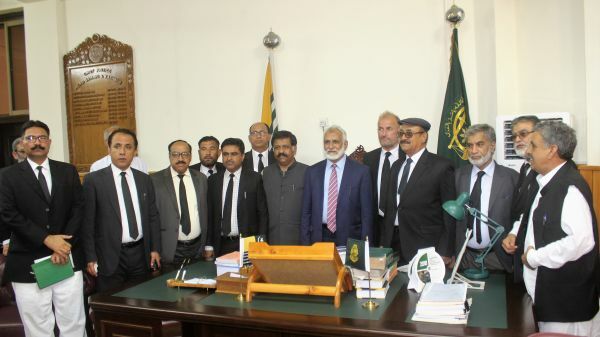 Honorable Prime Minister of Azad Jammu & Kashmir Raja Muhammad Farooq Haider Khan while visiting Supreme Court of Azad Jammu & Kashmir on 12-02-2019. 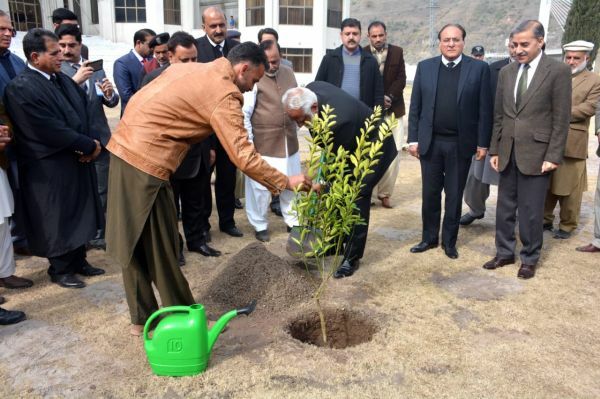 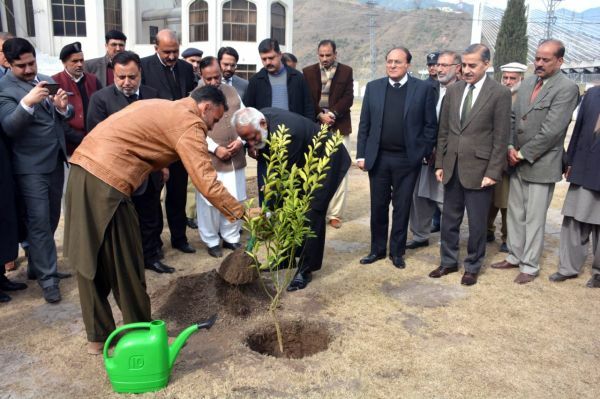 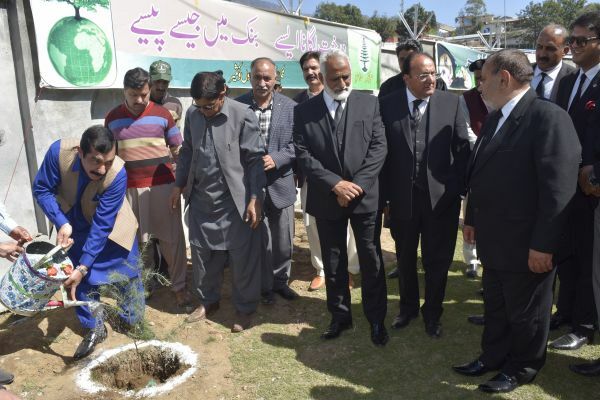 As a gesture of forestation program by Agriculture Department of the State of Azad Jammu & Kashmir Mr. Justice Ch. 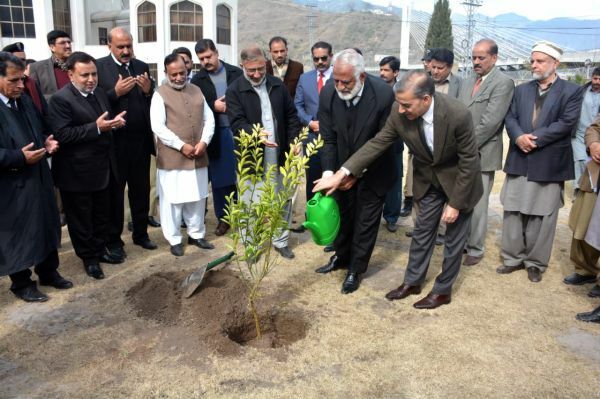 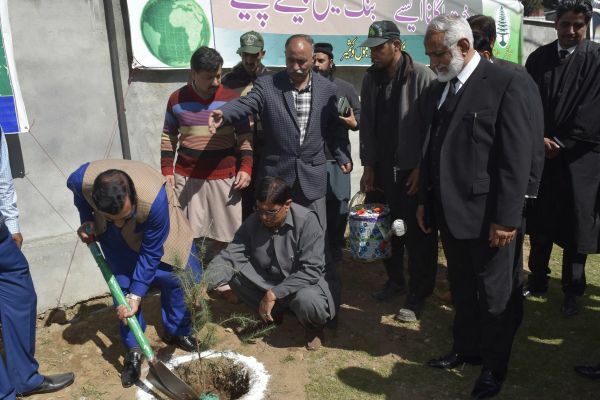 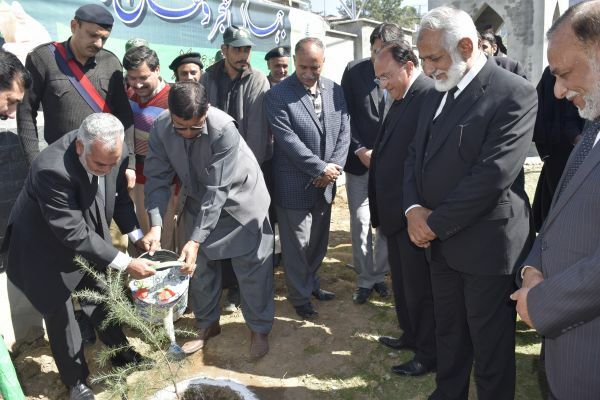 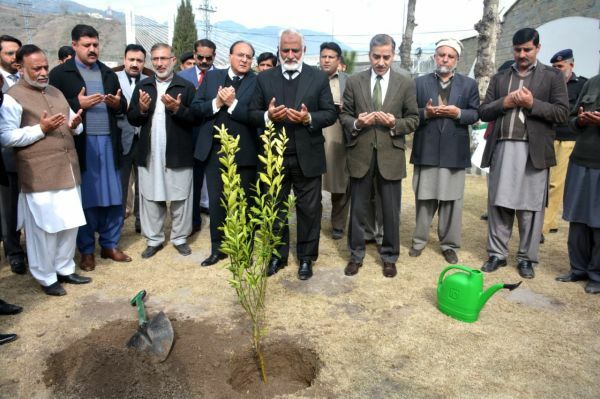 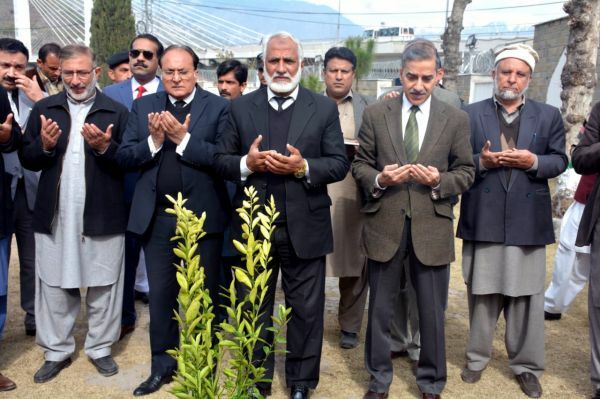 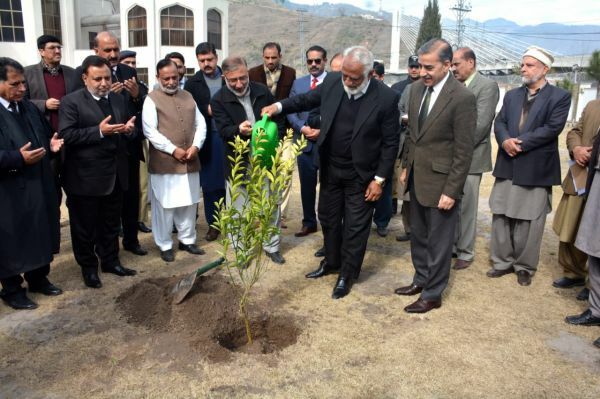 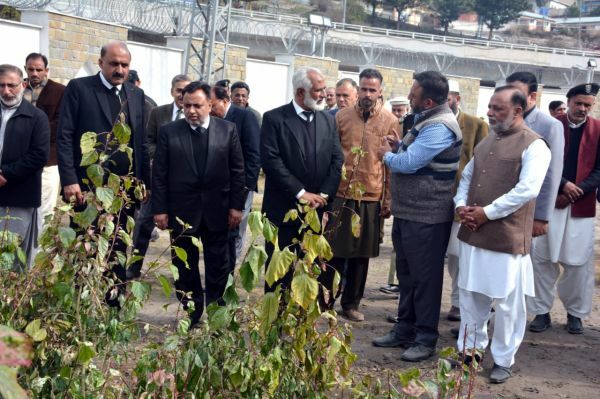 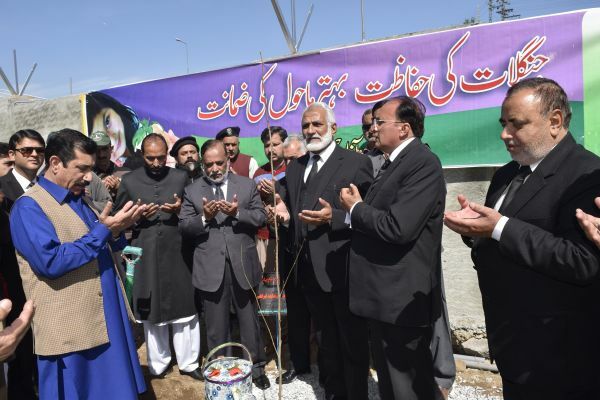 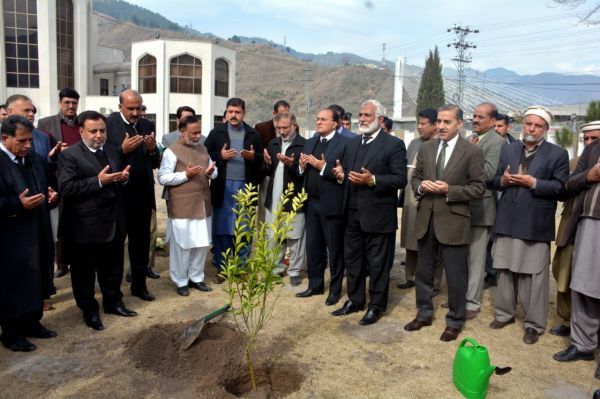 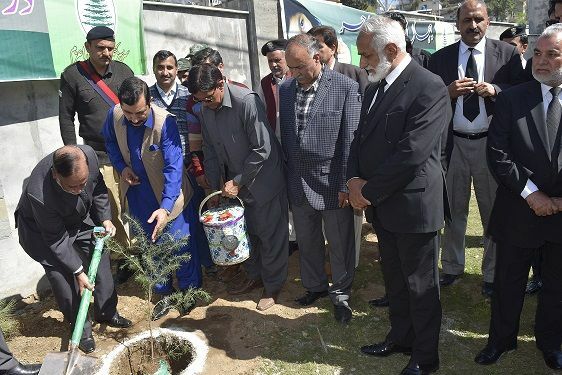 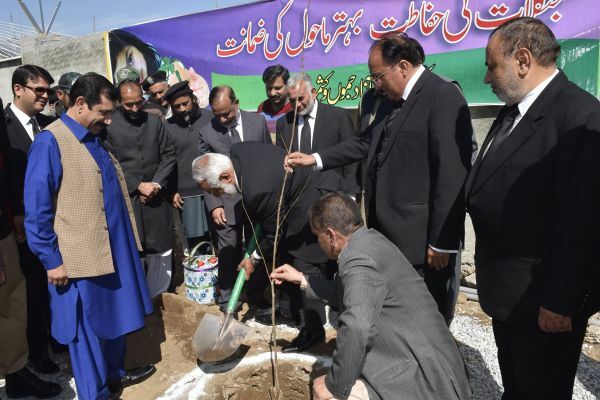 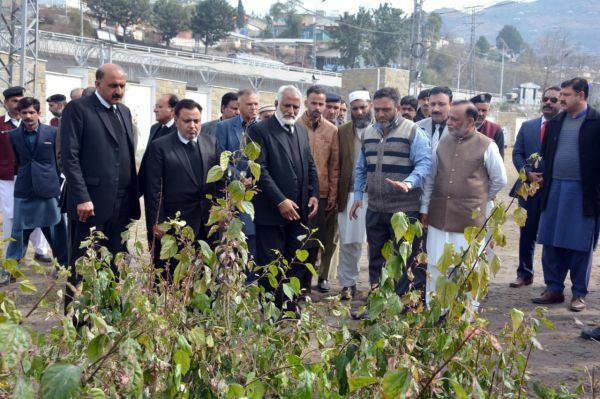 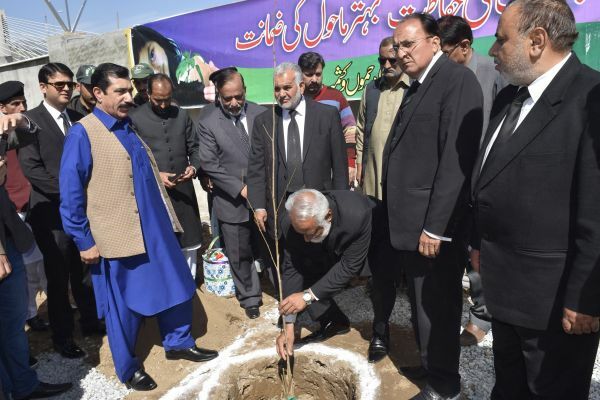 Muhammad Ibrahim Zia the Hon’ble Chief Justice of AJ&K, Hon’ble Judges of AJ&K Supreme Court planted trees in the premises of Supreme Court Muzaffarabad on 11th Feb 2019. 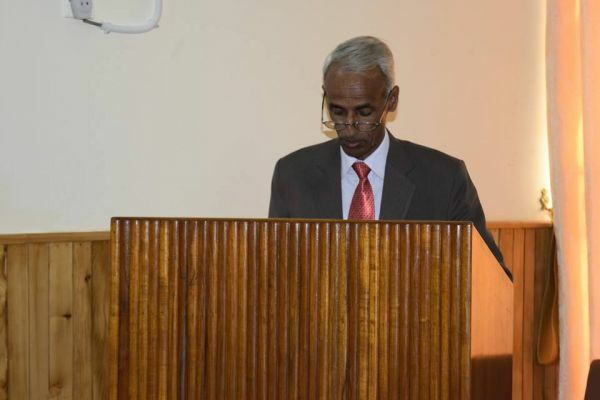 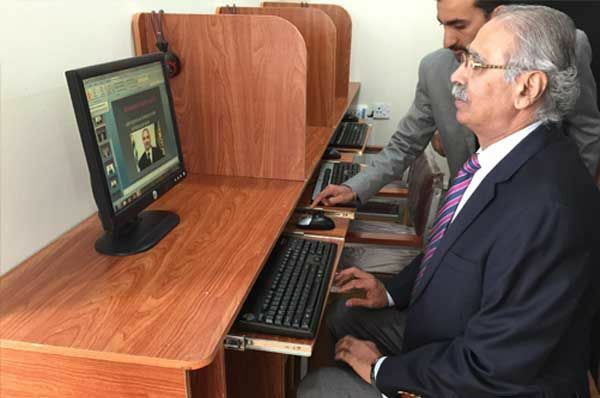 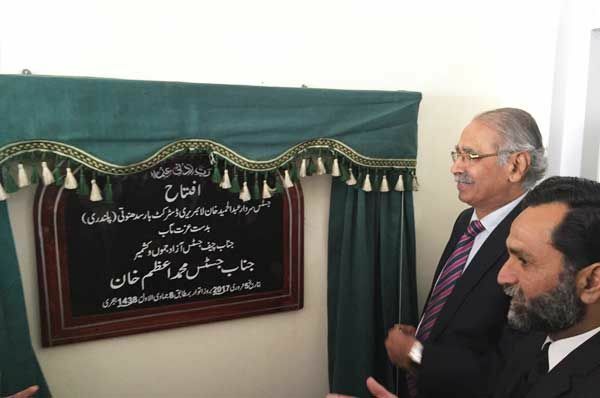 Honorable Chief Justice Mr. Justice Ch. 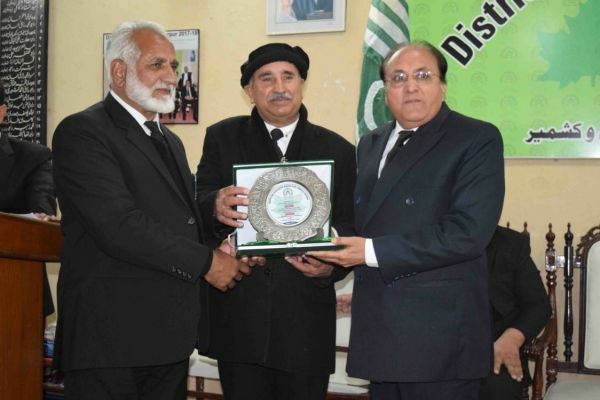 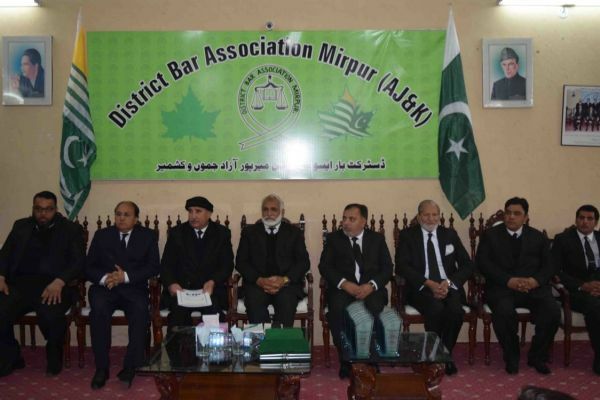 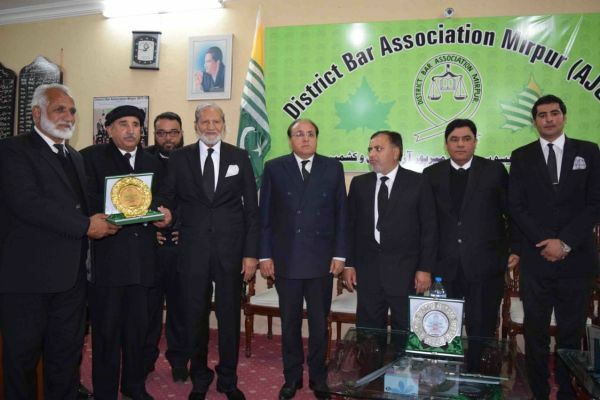 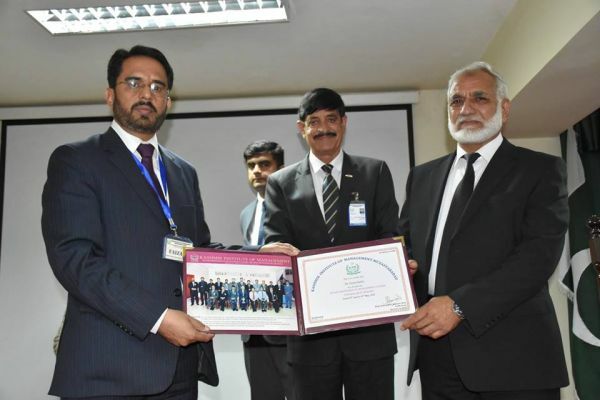 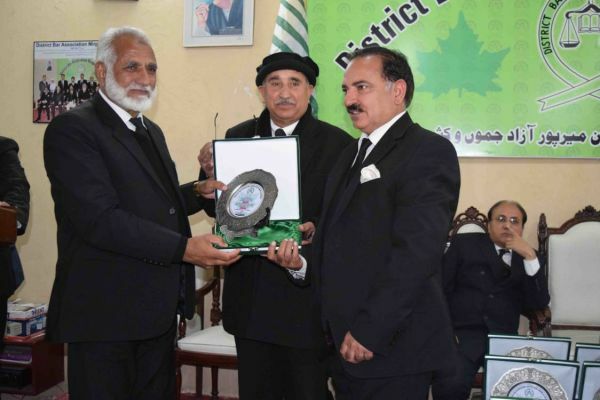 Muhammad Ibrahim Zia, Honorable Senior Judges Mr. Justice Raja Saeed Akram Khan and Mr. Justice Ghulam Mustafa Mughal receiving awards for historical law reforms and judicial infrastructure in a ceremony organized by District Bar Association Mirpur Azad Kashmir on 30-01-2019. 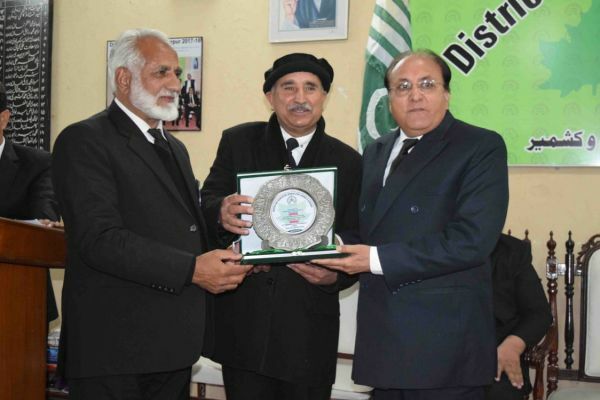 Honorable Chief Justice of Azad Jammu & Kashmir Mr Justice Ch. 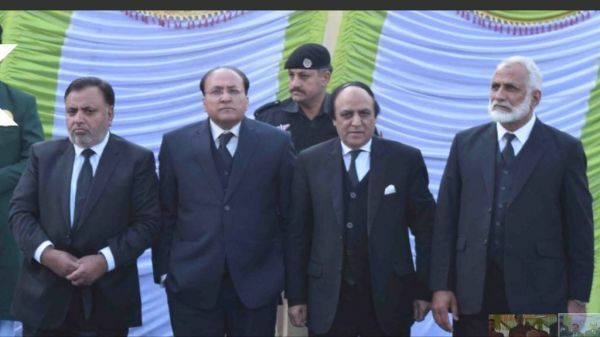 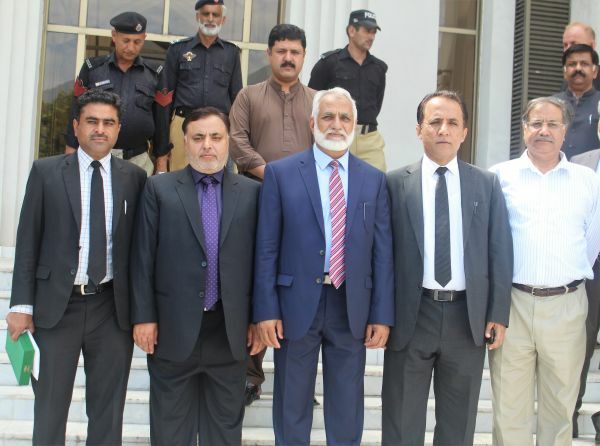 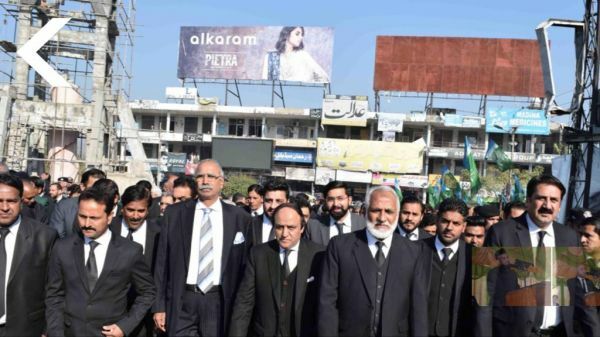 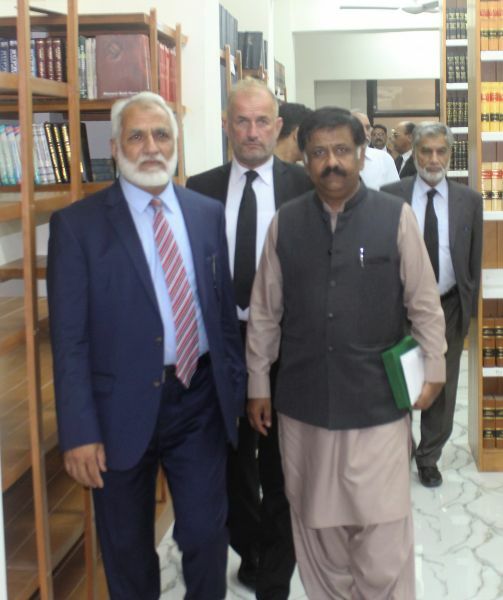 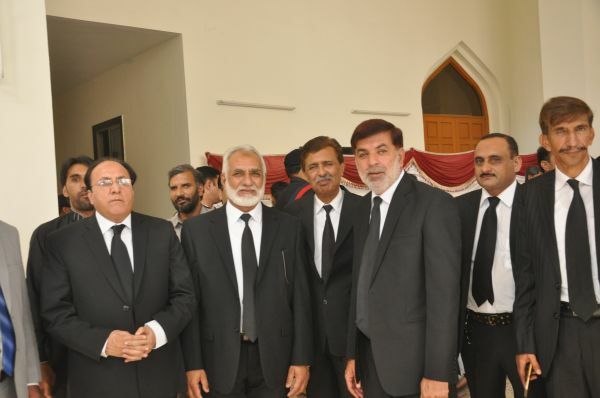 Muhammad Ibrahim Zia and Senior Judge Mr. Justice Raja Saeed Akram Khan while visting Gujrat, Sialkot,Okara & Multan. 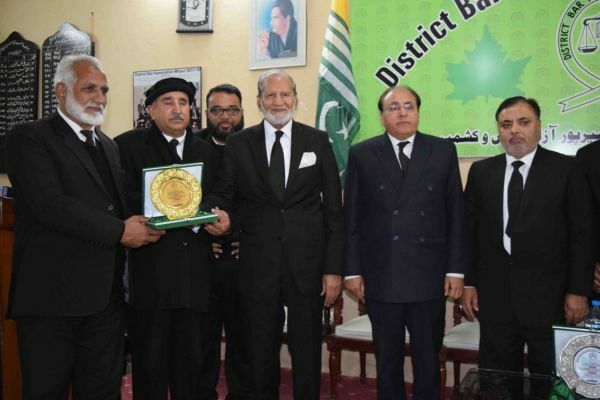 Honorable Chief Justice of Azad Jammu & Kashmir Mr Justice Ch. 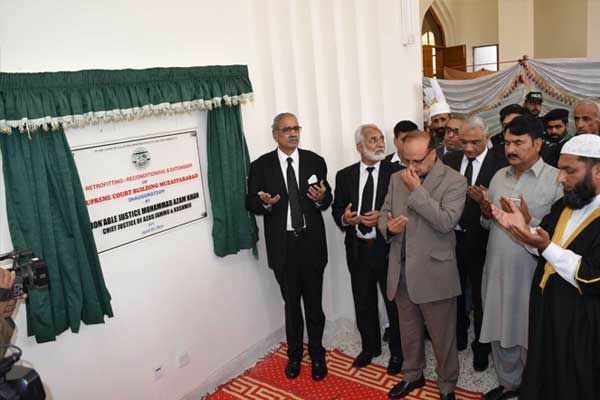 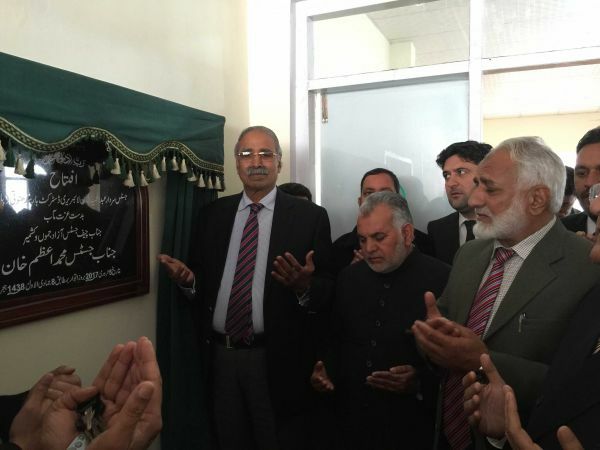 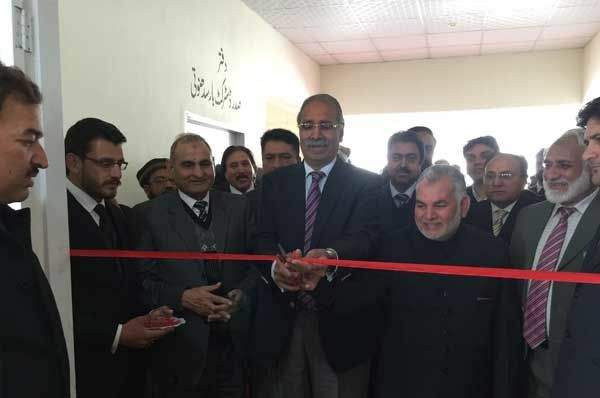 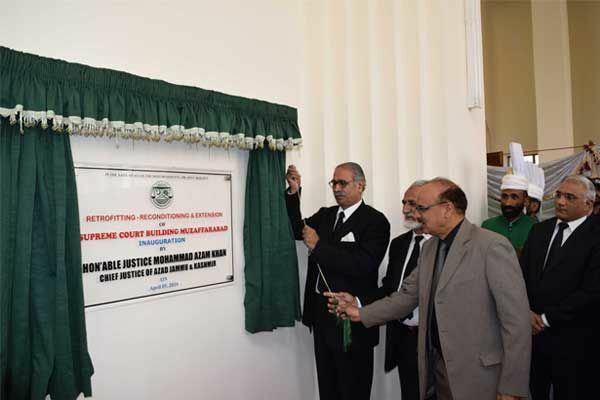 Muhammad Ibrahim Zia and Honorable Mr. Justice M. Tabasum Altaf Alvi Chief Justice of High Court jointly inaugurating the newly constructed building of High Court Circuit Bench Mirpur on 19-12-2018. 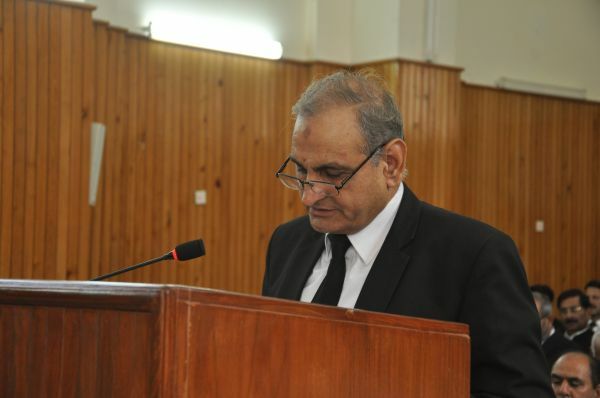 The Honorable Chief Justice of Azad Jammu & Kashmir Mr. Justice Ch. 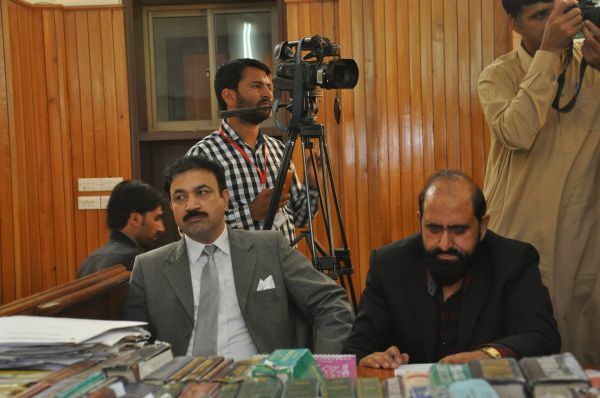 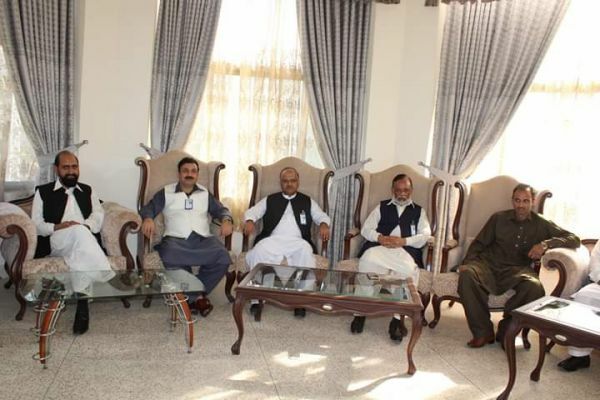 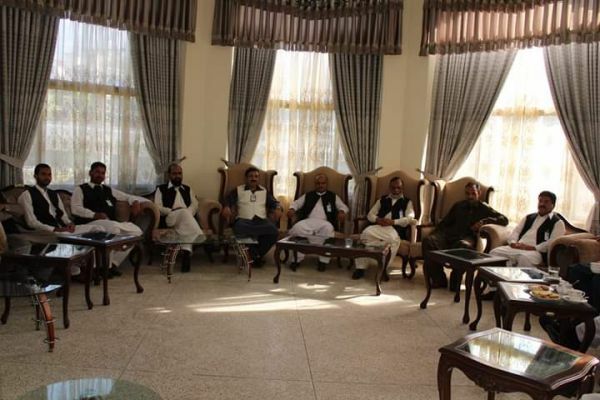 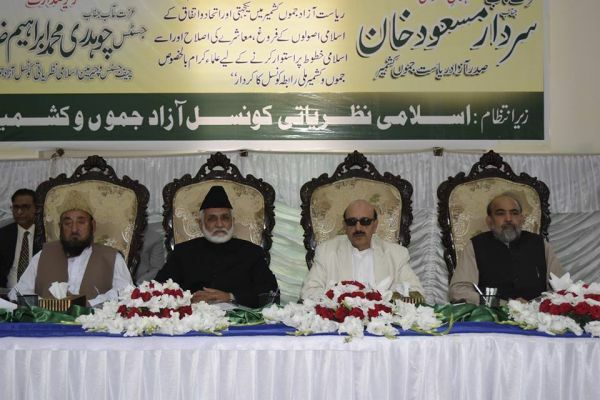 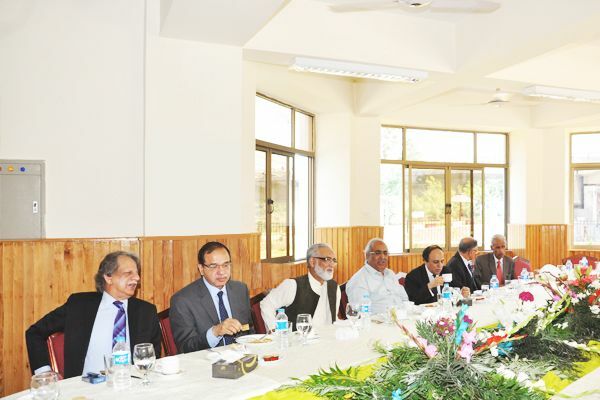 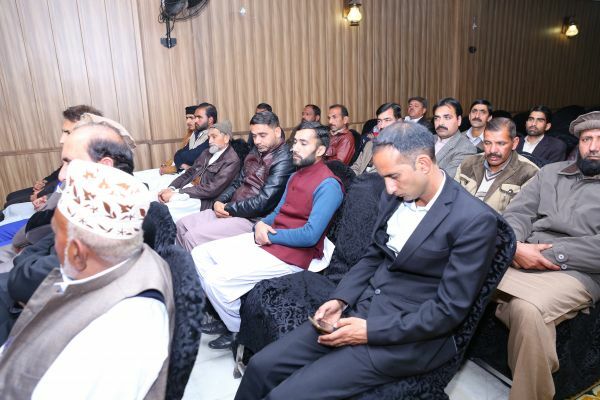 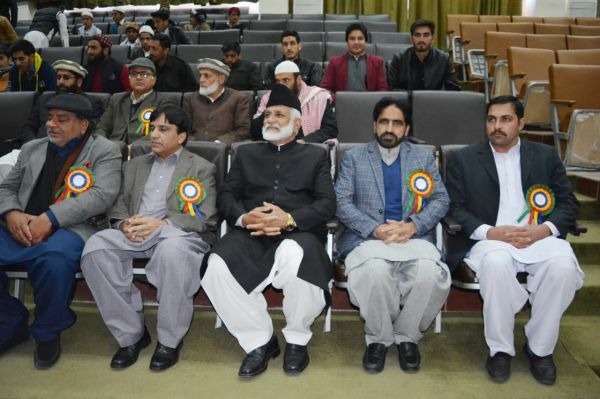 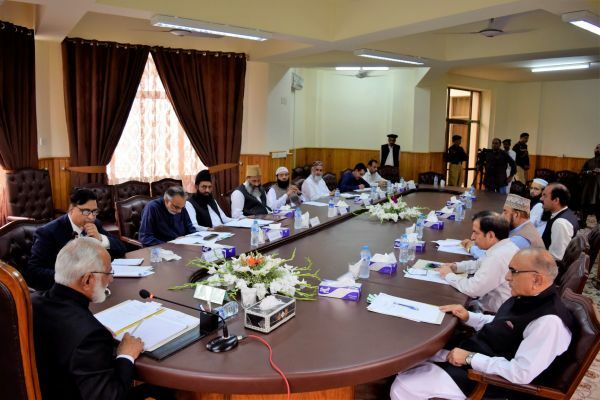 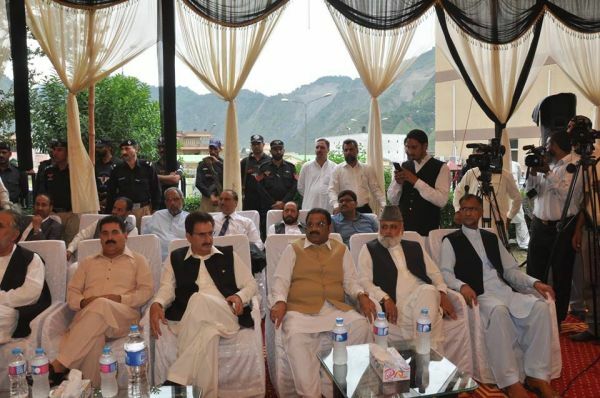 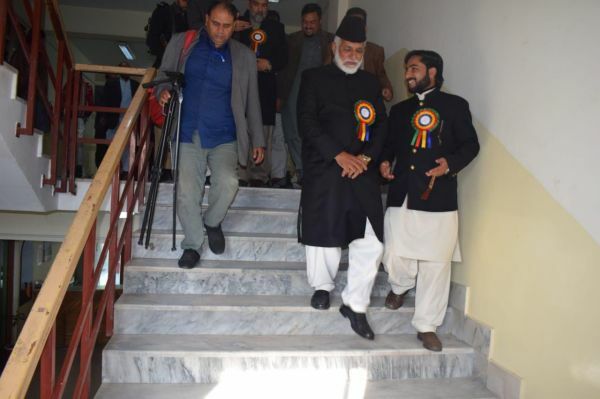 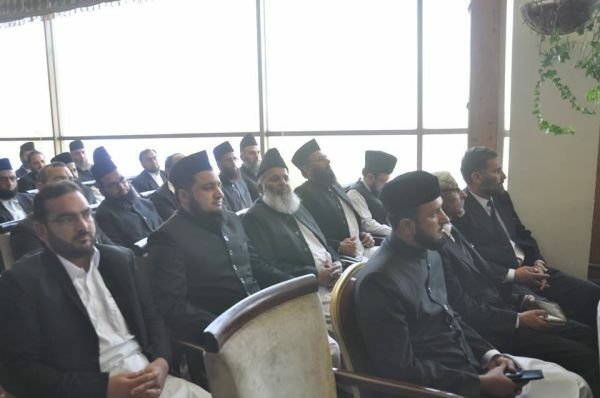 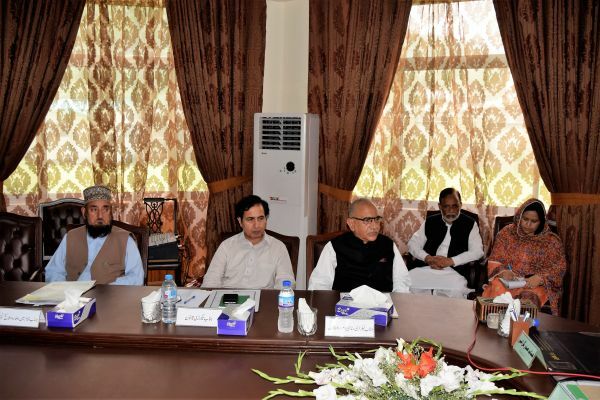 Muhammad Ibrahim Zia chaired the Seerat conference organized by literary Council AJK at Muzaffarabad Azad Kashmir. 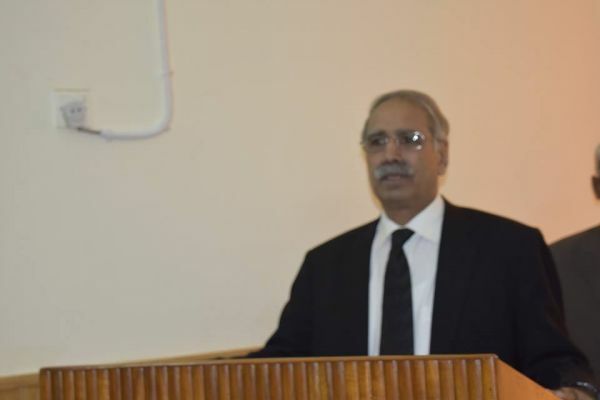 The Honorable Chief Justice of Azad Jammu & Kashmir Mr. Justice Ch. 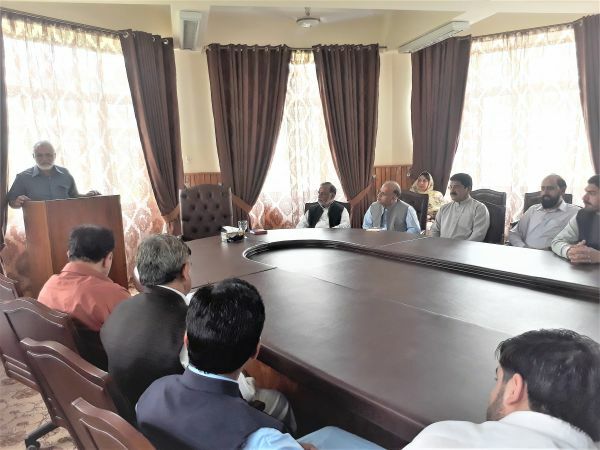 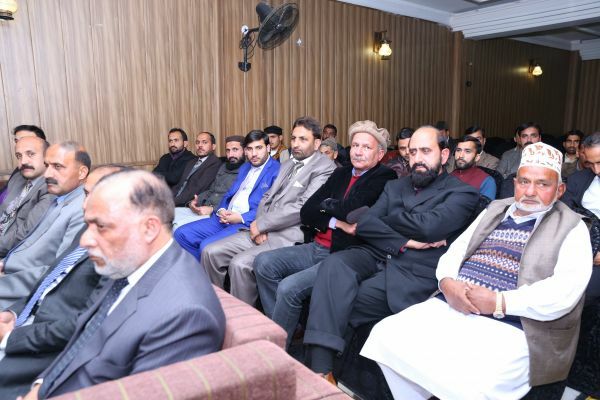 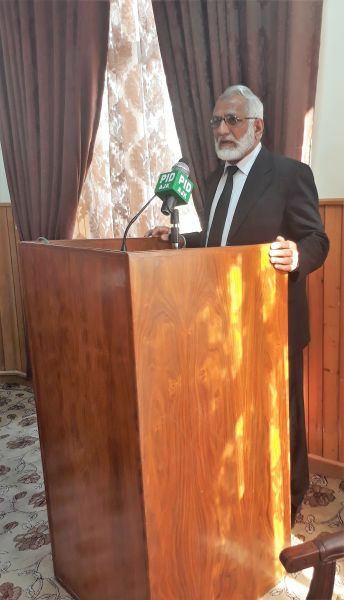 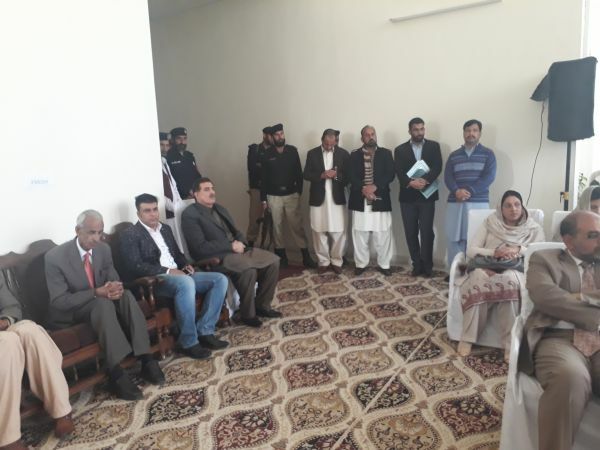 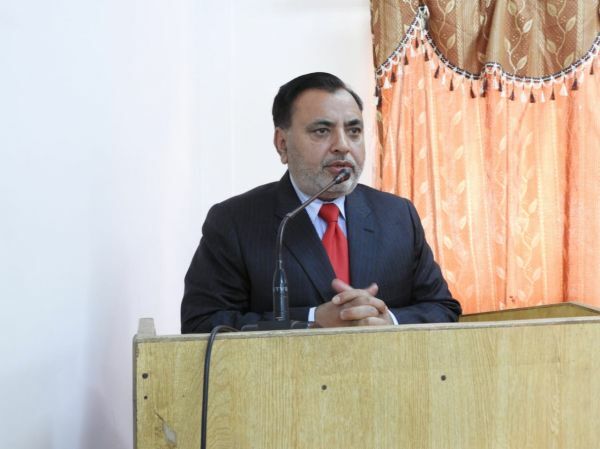 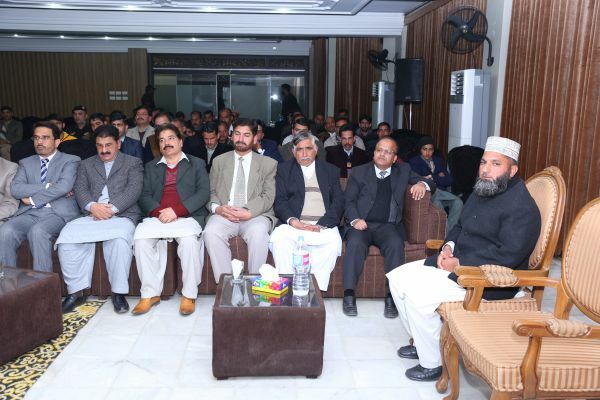 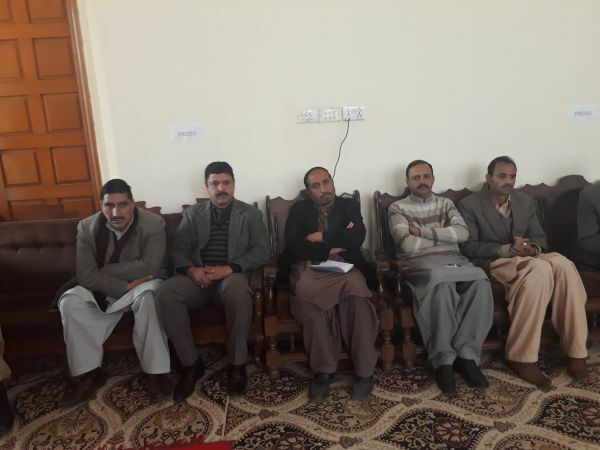 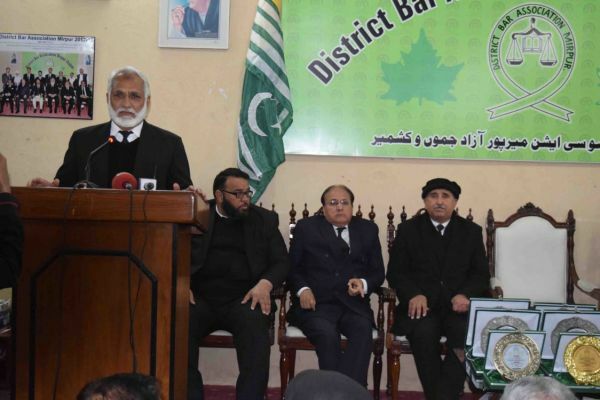 Muhammad Ibrahim Zia while addressing District Bar Neelum on 8th December 2018. 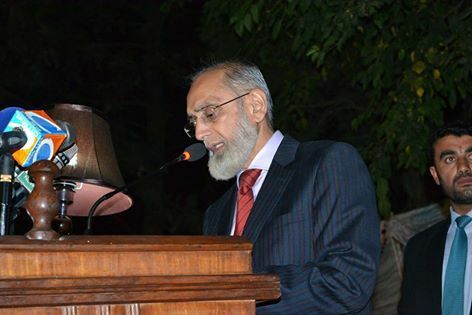 The Honorable Chief Justice of Azad Jammu & Kashmir Mr. Justice Ch. 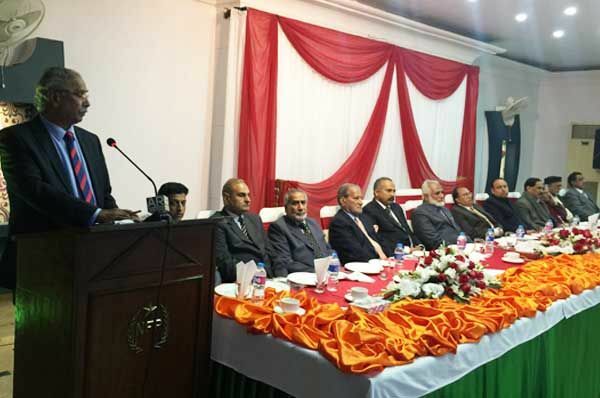 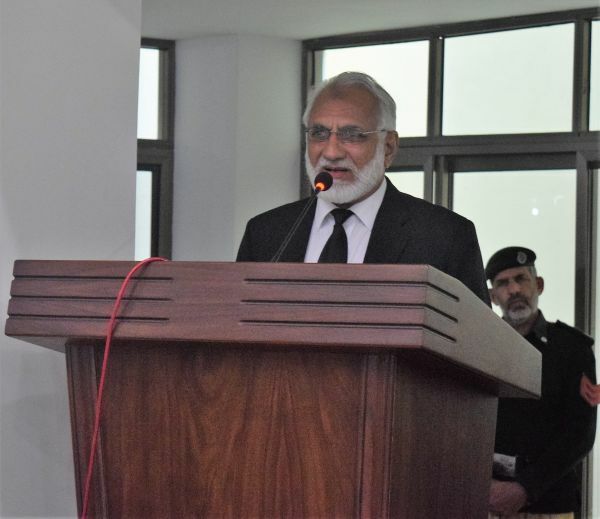 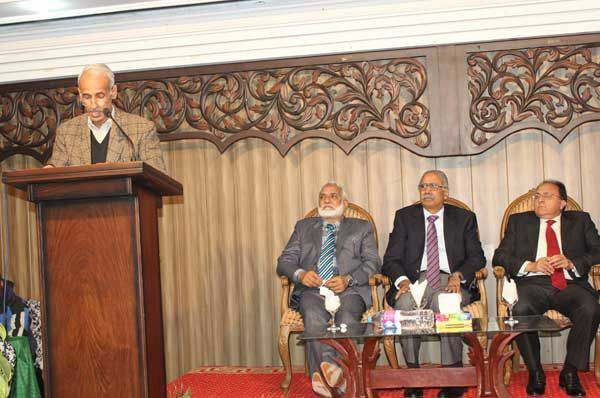 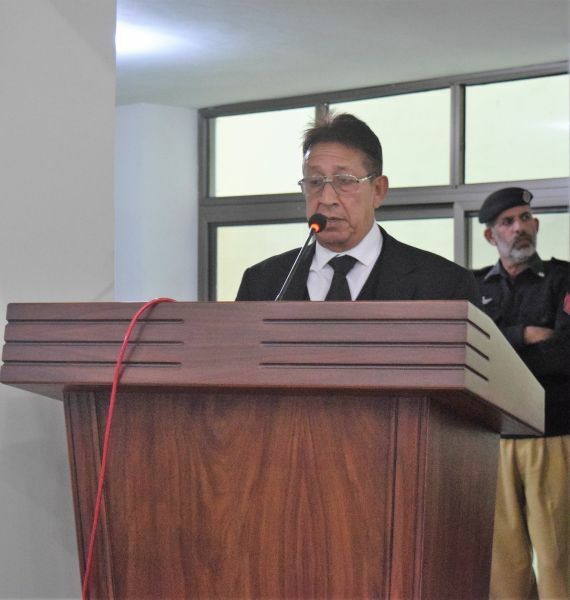 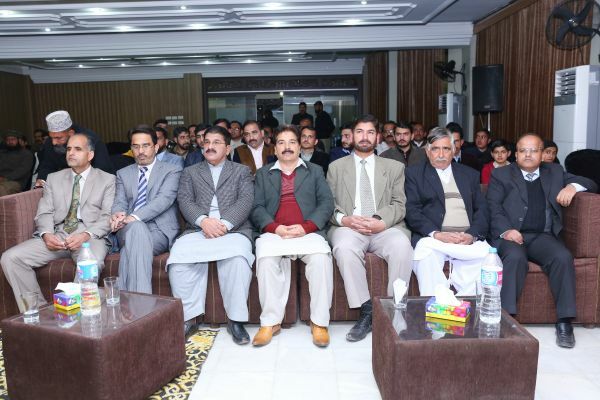 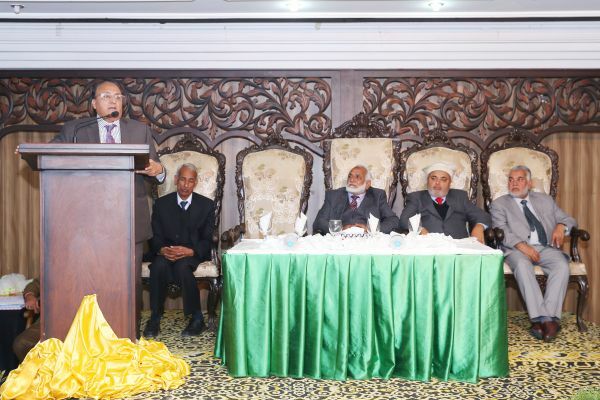 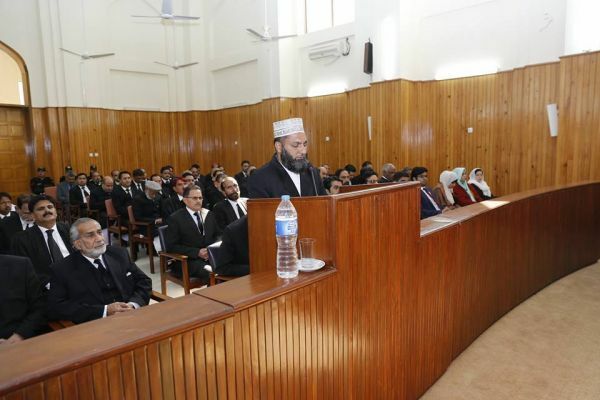 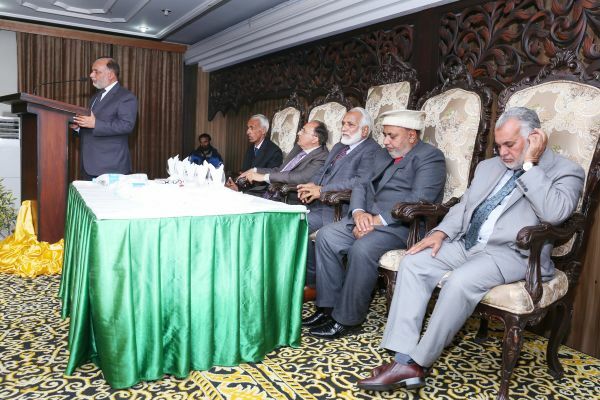 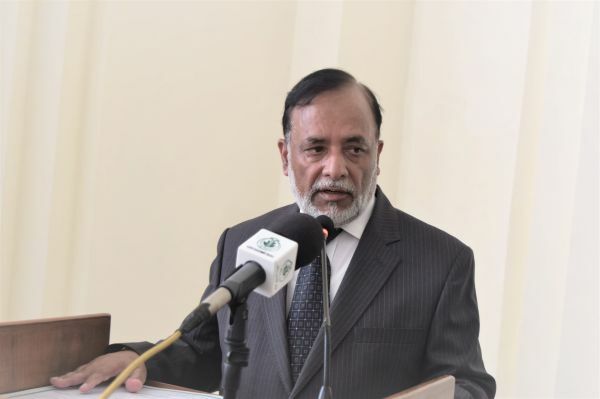 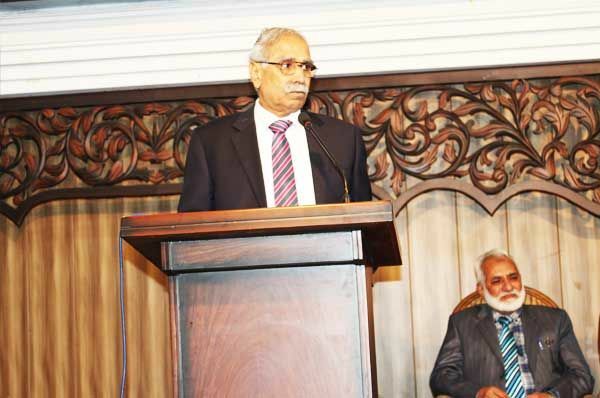 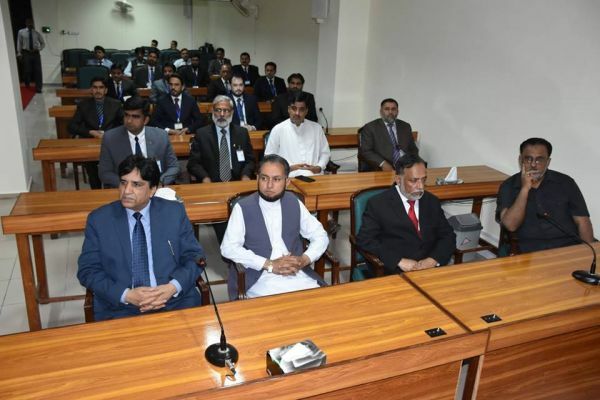 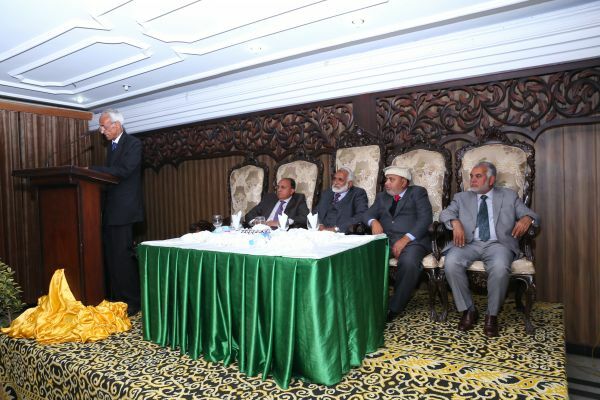 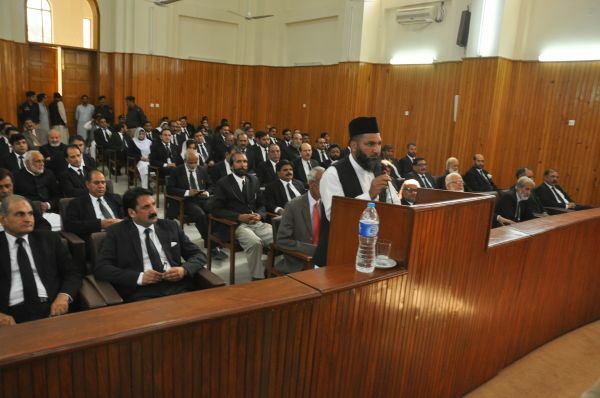 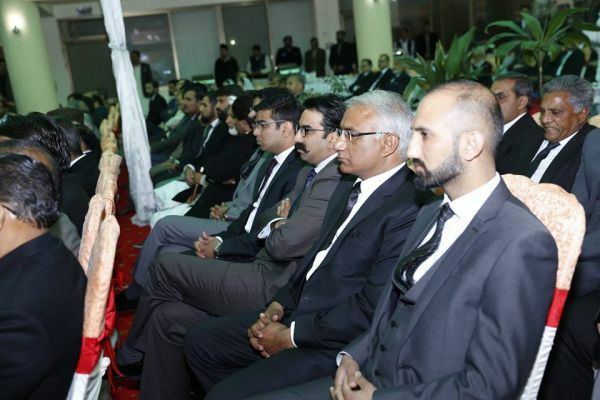 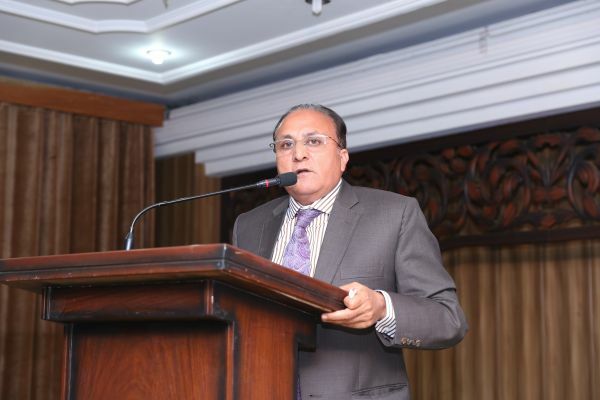 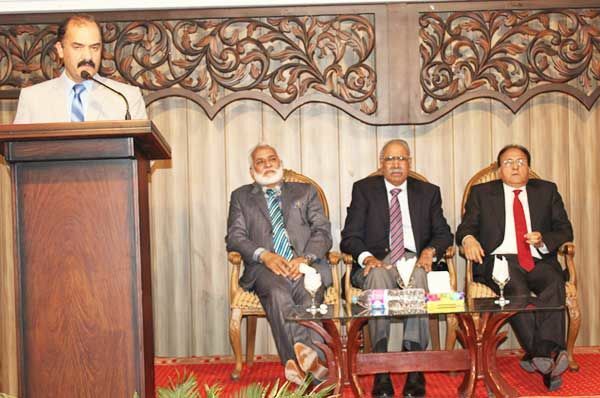 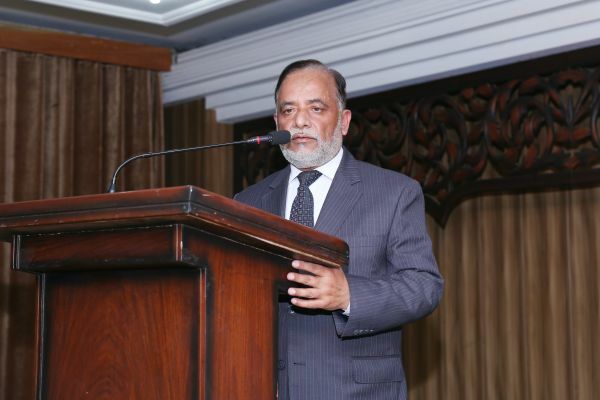 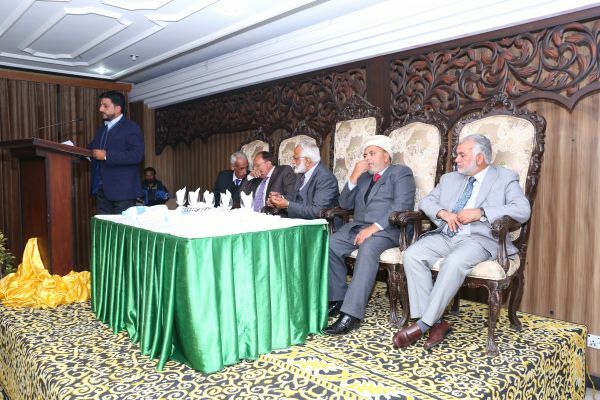 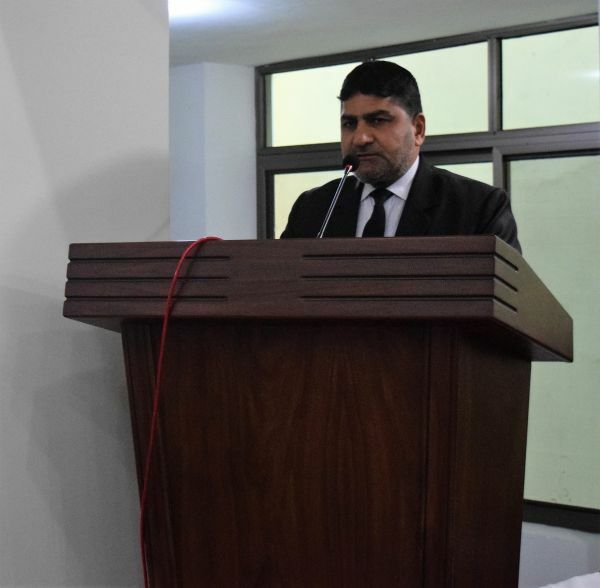 Muhammad Ibrahim Zia while addressing the inauguration ceremony of the office of president Supreme Court Bar Association at Mirpur on 29th November 2018. 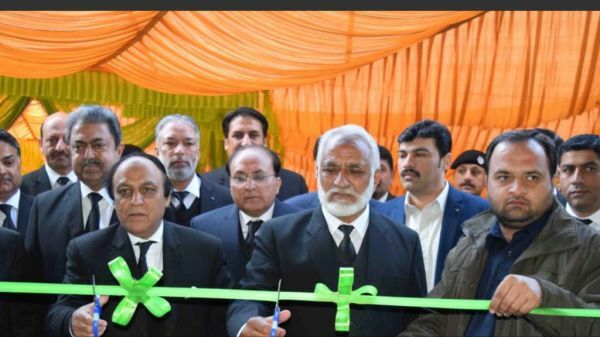 The Honorable Chief Justice of Azad Jammu & Kashmir Mr. Justice Ch. 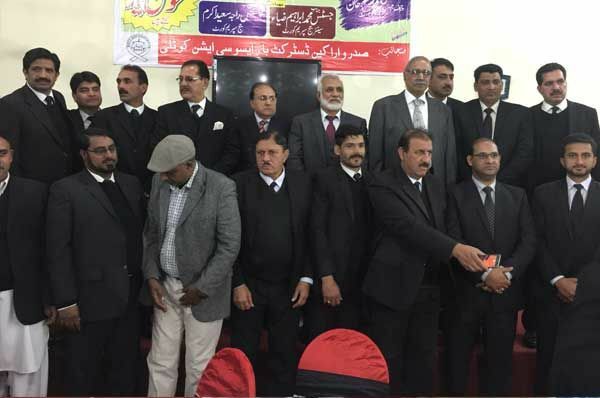 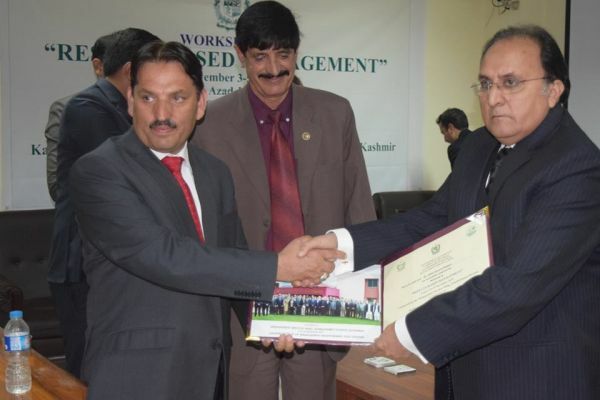 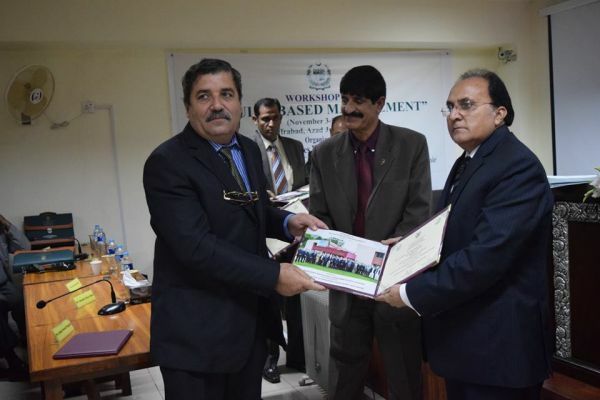 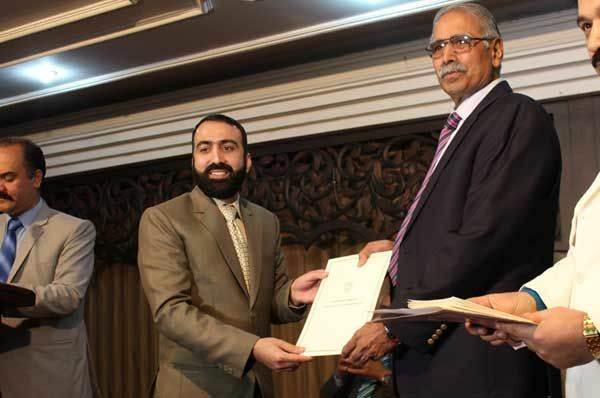 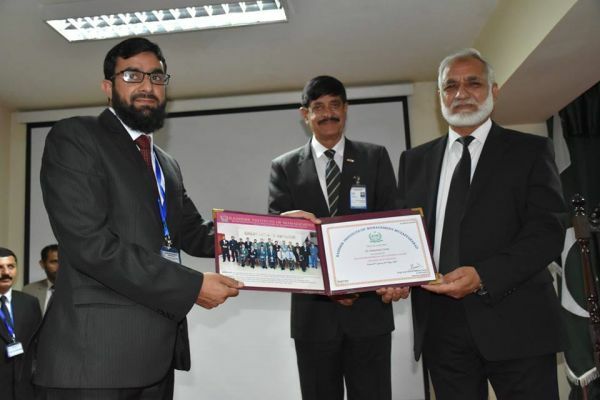 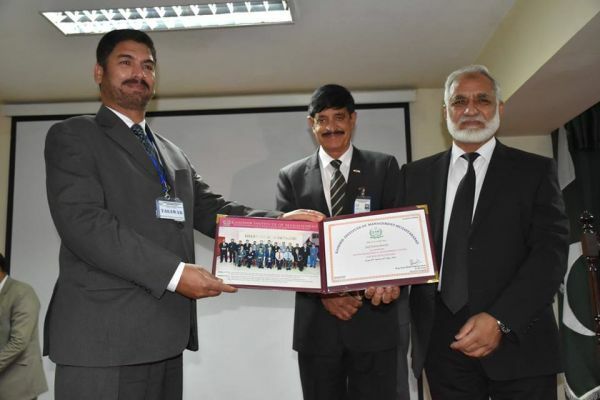 Muhammad Ibrahim Zia and Hon’ble Judges of Supreme Court distributed certificates of enrolment to the newly enrolled Advocates. 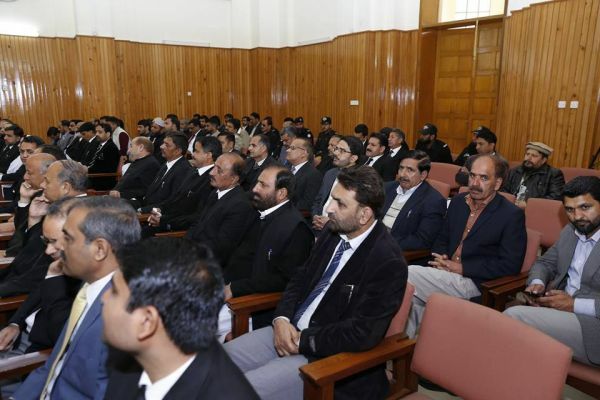 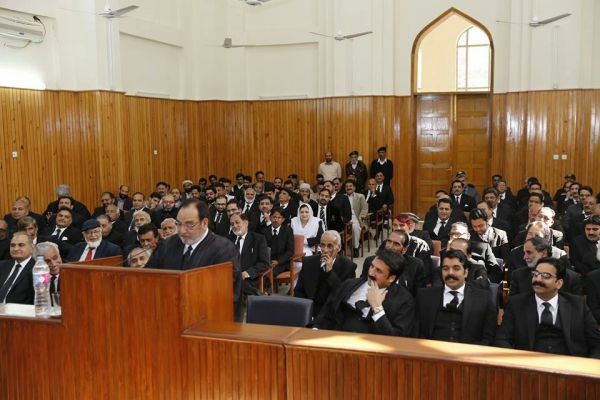 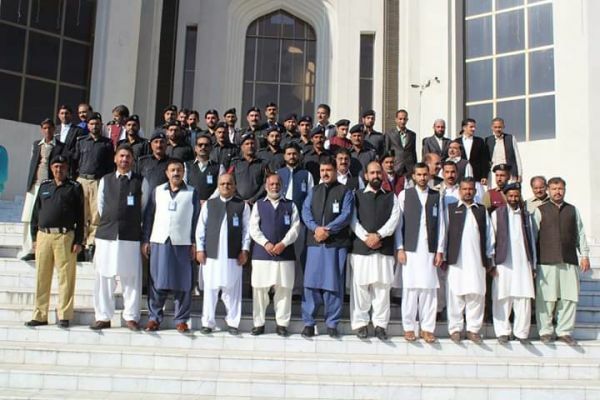 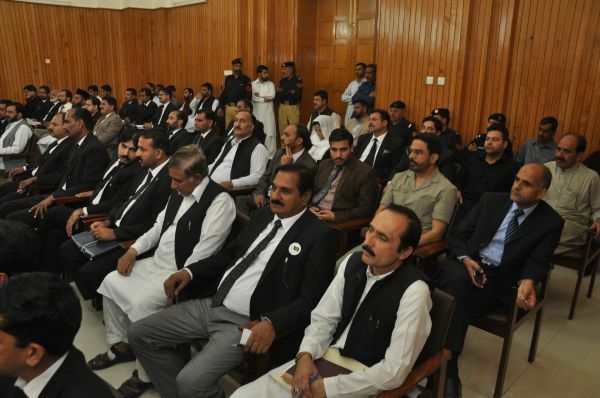 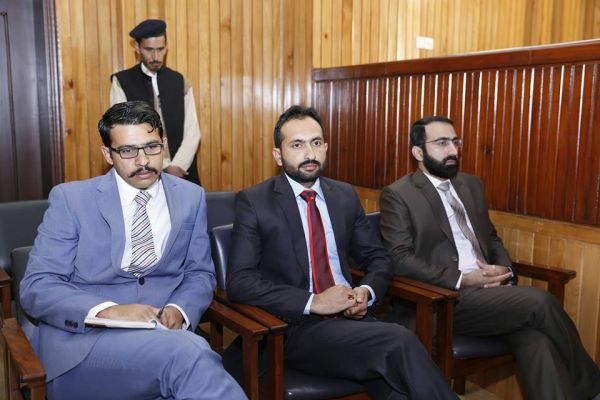 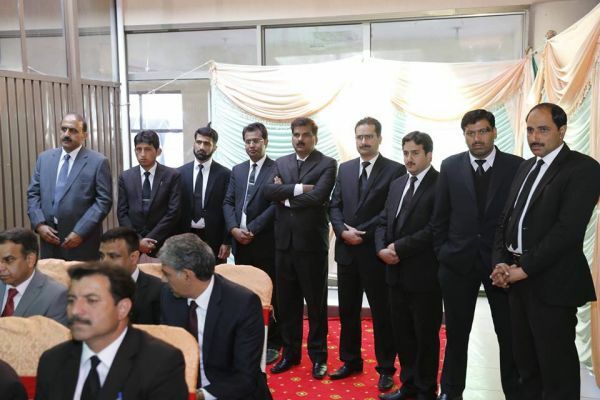 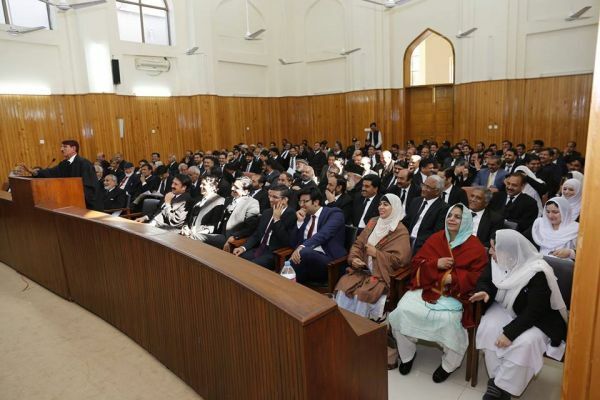 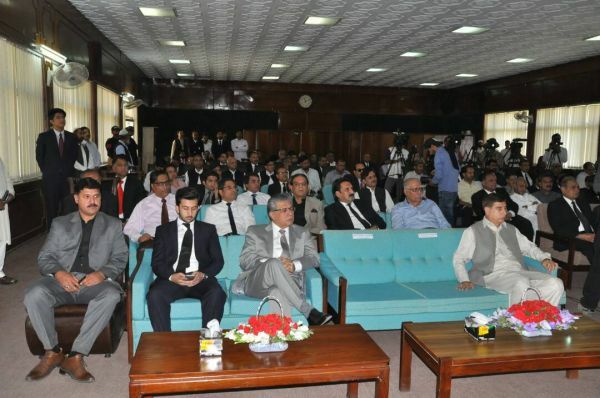 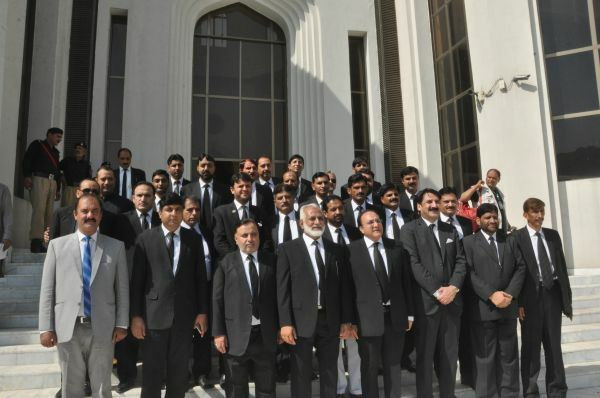 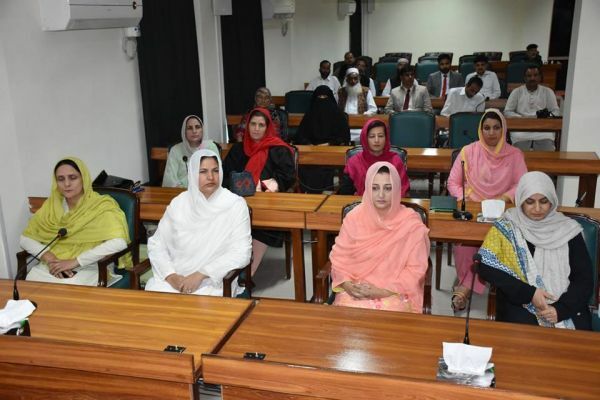 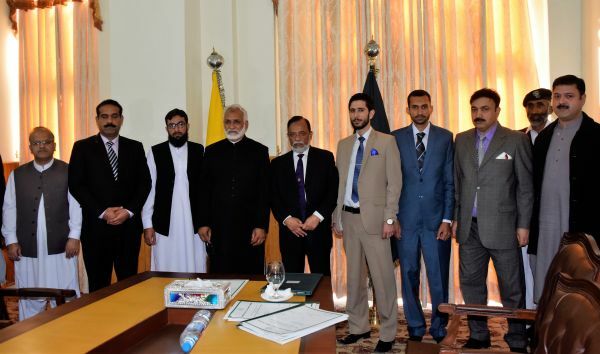 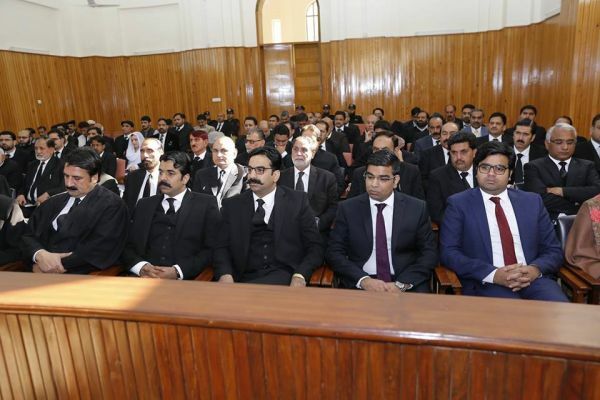 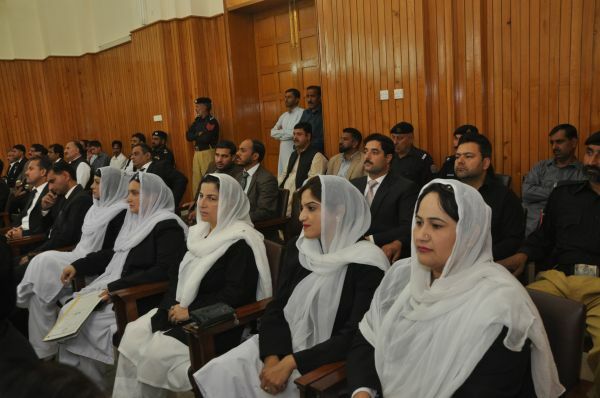 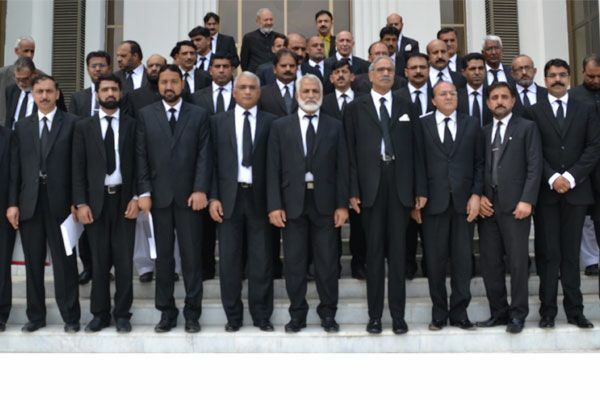 Twenty six advocates from different districts of Azad Jammu & Kashmir were enrolled as advocates of Supreme Court. 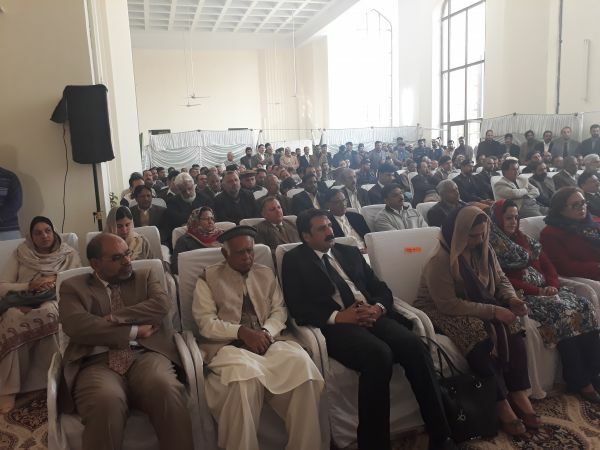 An enrolment function was held at Supreme Court of AJ&K, Muzaffarabad on 16th November 2018. 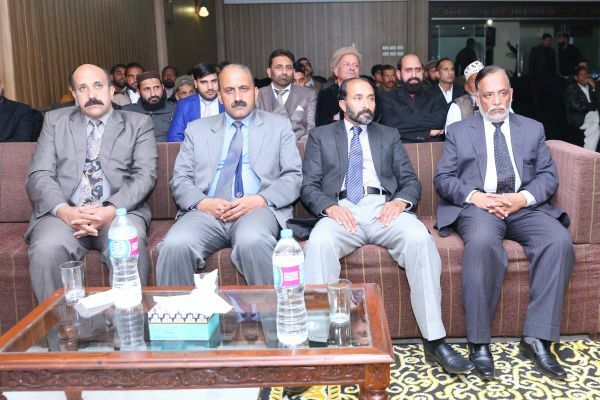 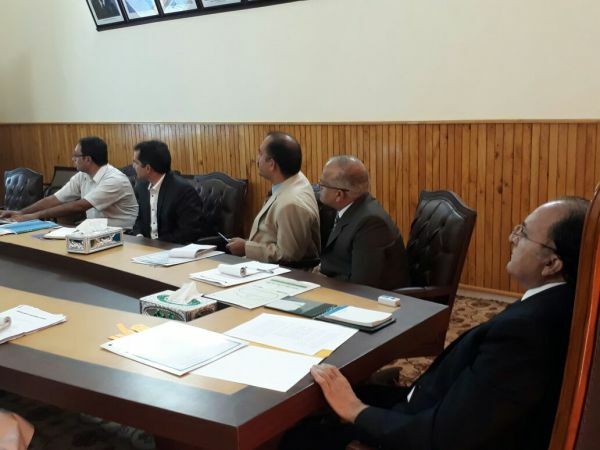 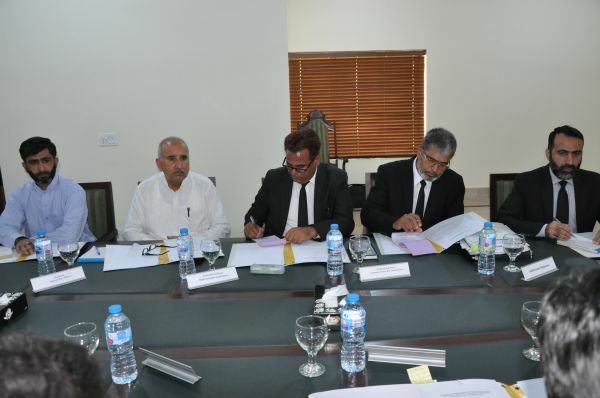 The Honorable Mr. Justice Raja Saeed Akram Khan Senior Judge (Chairman Building Committee) and Mr. Justice Ghulam Mustafa Mughal Judge Supreme Court of AJ&K (Member) while presiding over the building committee meeting at Mirpur Registry Branch on 25-10-2018. 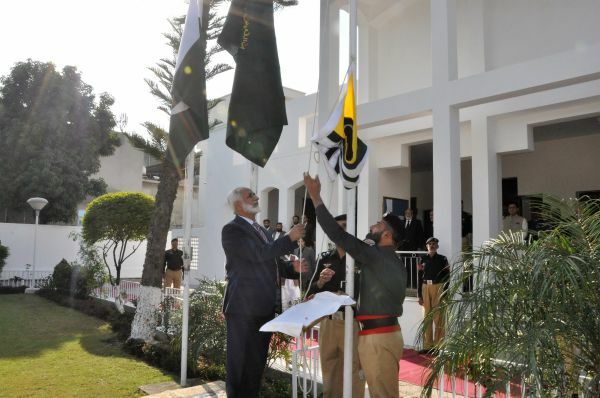 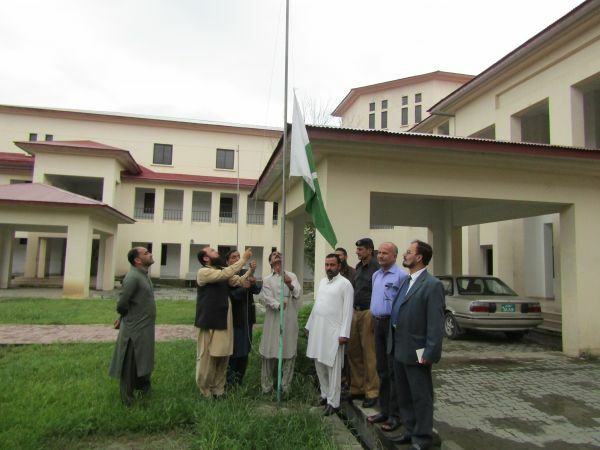 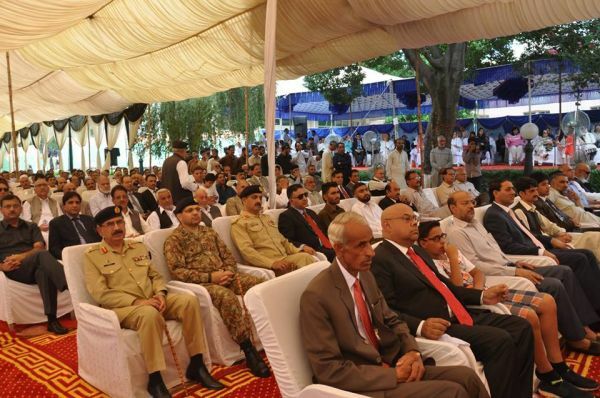 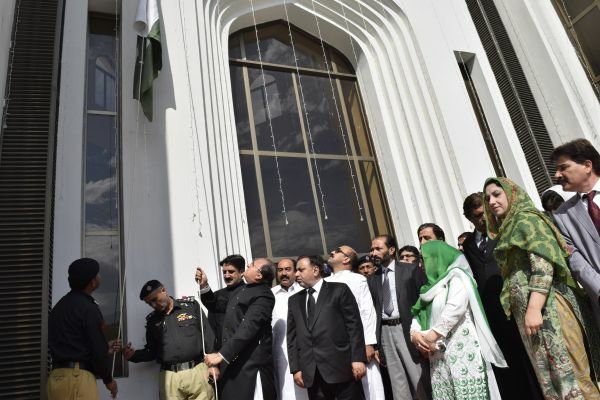 The flag hoisting ceremony on Founding Day of Azad Jammu and Kashmir was held in Supreme Court Registry Branch Mirpur. 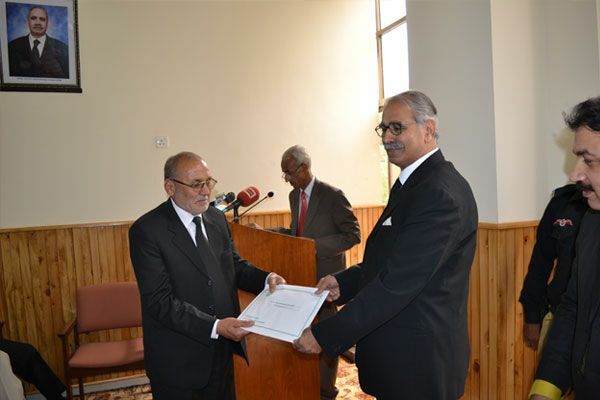 The Honorable Chief Justice of Azad Jammu & Kashmir Mr. Justice Ch. 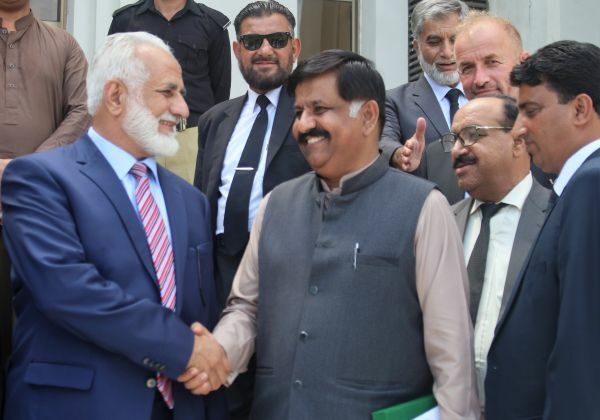 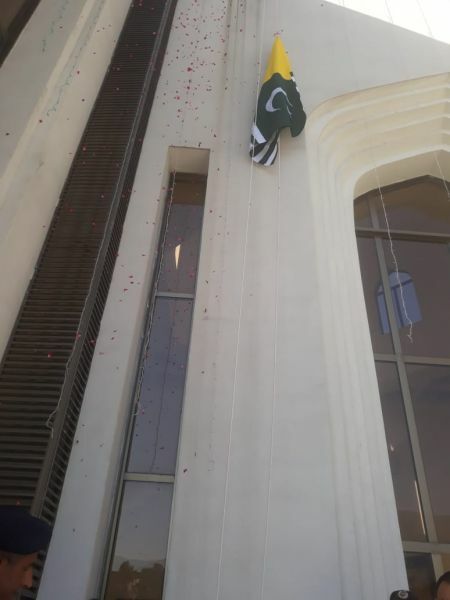 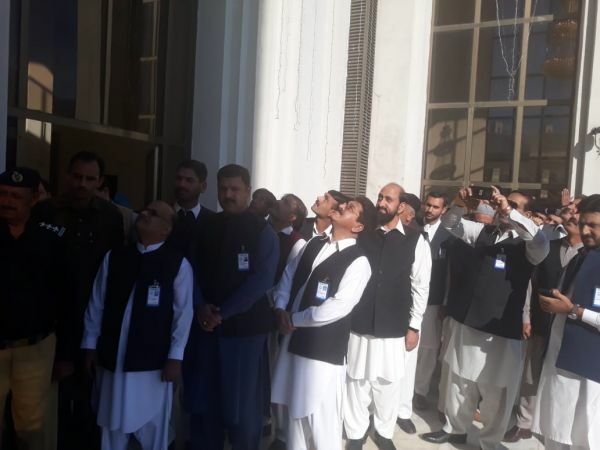 Muhammad Ibrahim Zia hoisted the flag at Supreme Court building in presence of Mr. Justice Raja Saeed Akram Khan, Senior Judge of Supreme Court, officers and employees of the court. 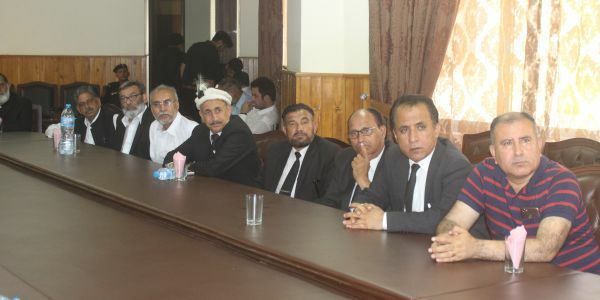 It was also attended by lawyers. 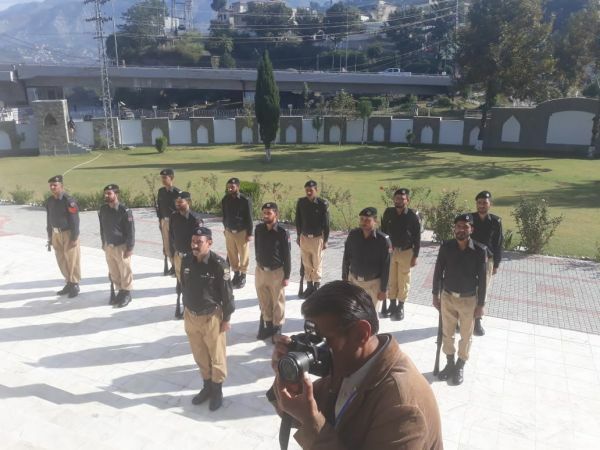 A smartly turned out contingent of police gave salami on the occasion. 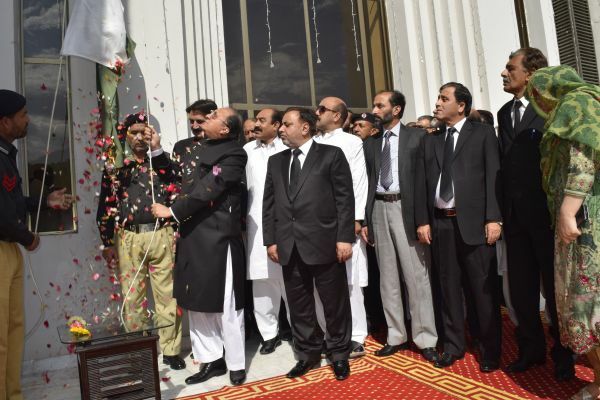 The flag hoisting ceremony on Founding Day of Azad Jammu and Kashmir was held in AJK Supreme Court. 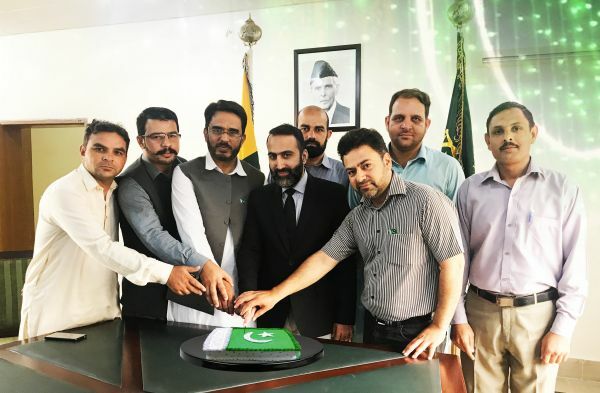 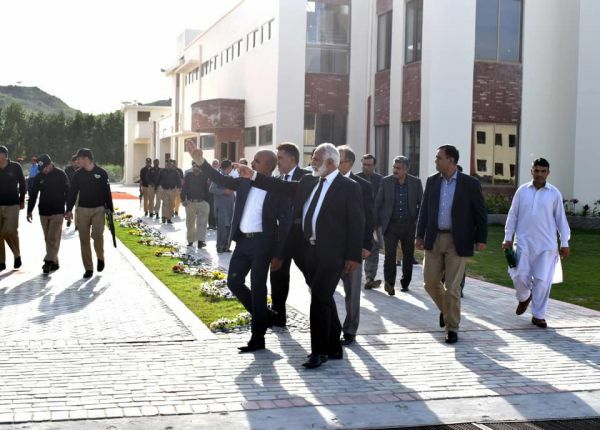 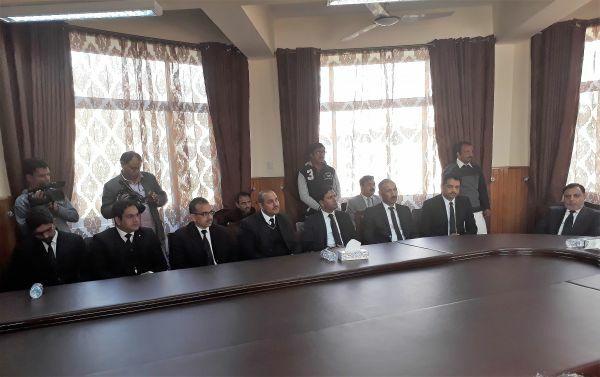 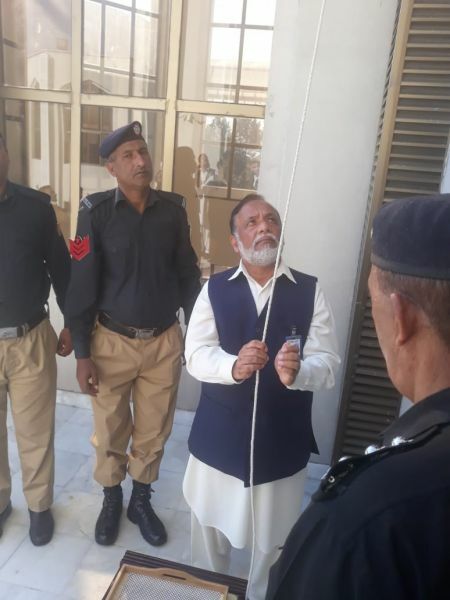 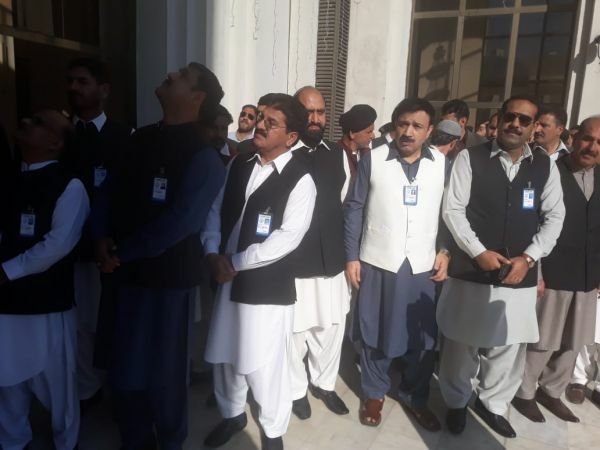 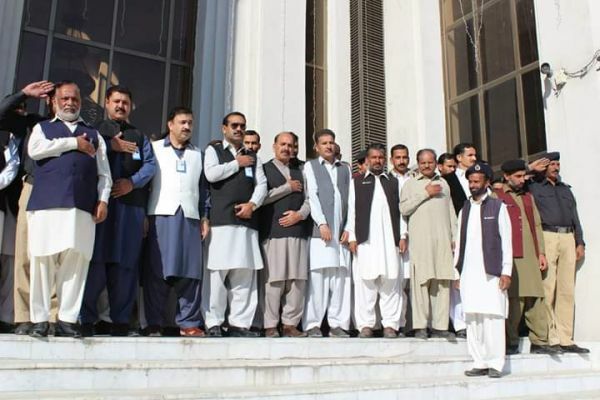 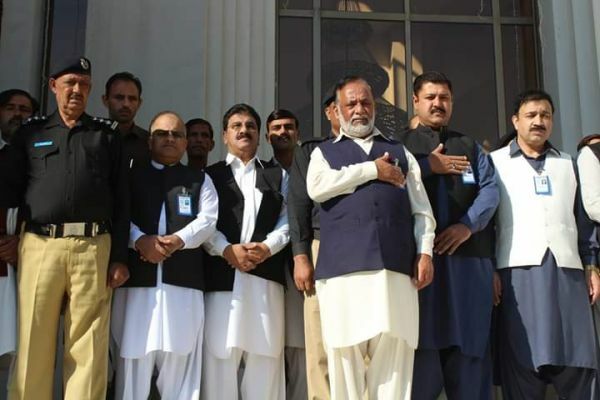 Registrar Supreme Court Sardar Mohammad Rahim Khan hoisted the flag at Supreme Court building in presence of officers and employees of the court. 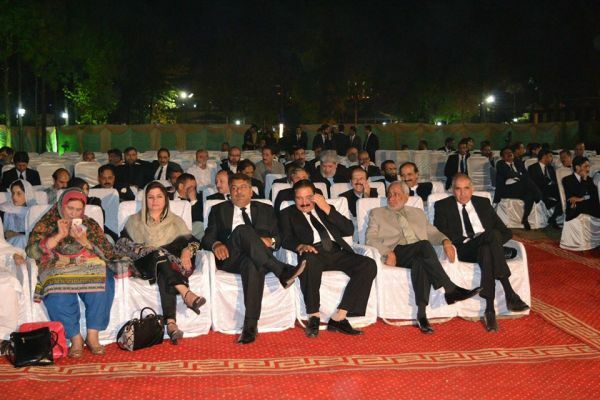 It was also attended by lawyers. 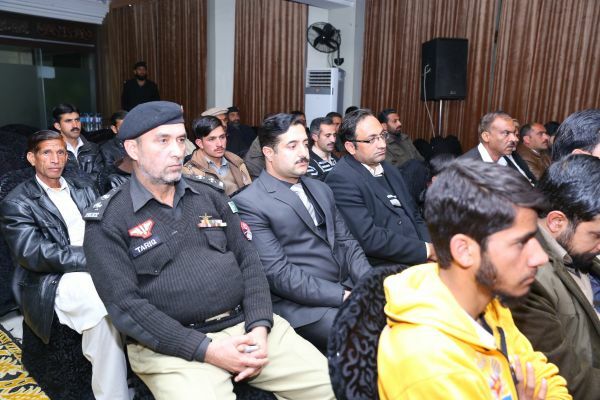 A smartly turned out contingent of police gave salami on the occasion. 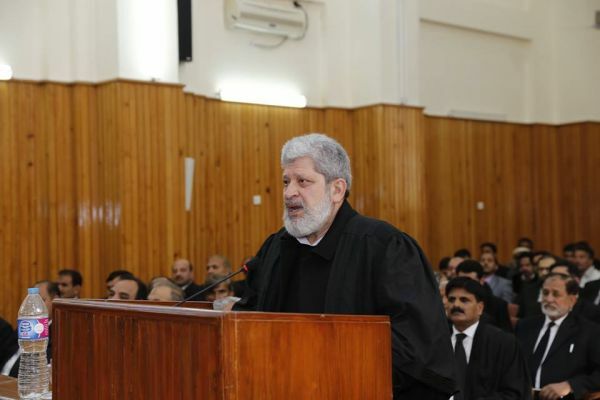 The Honorable Chief Justice of Azad Jammu & Kashmir Mr. Justice Ch. 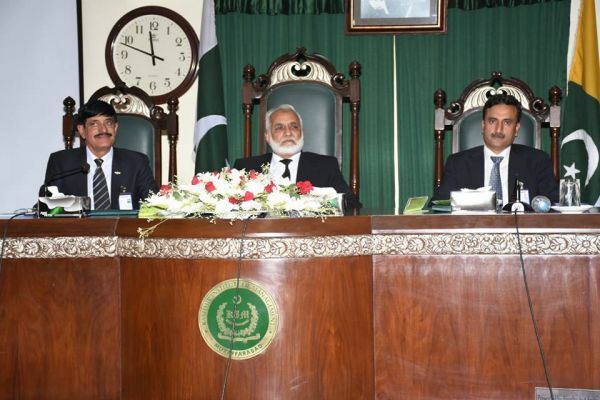 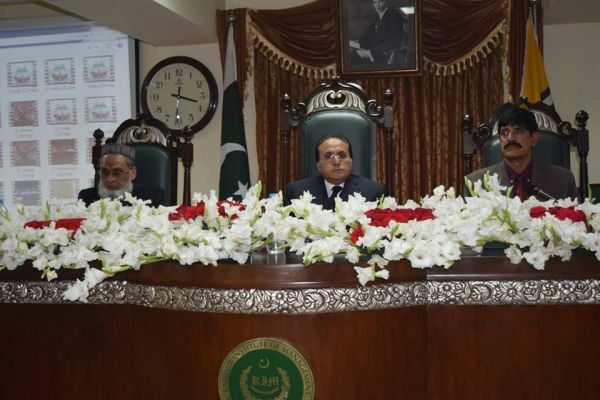 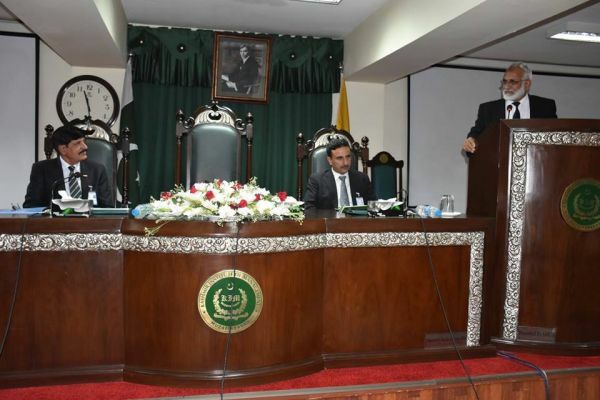 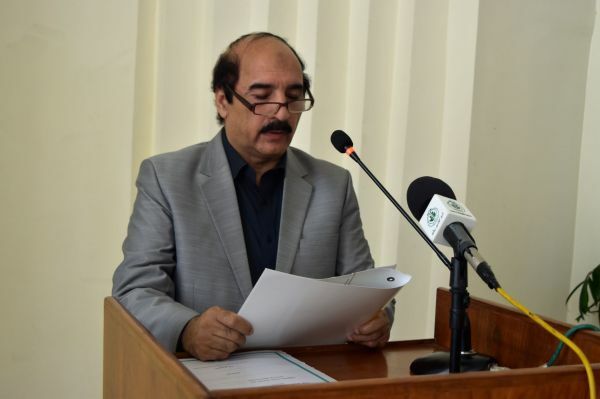 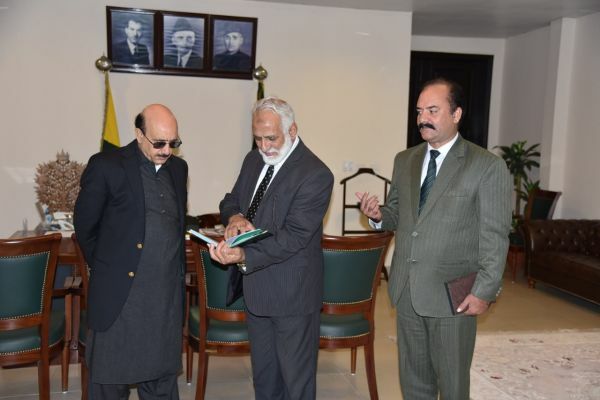 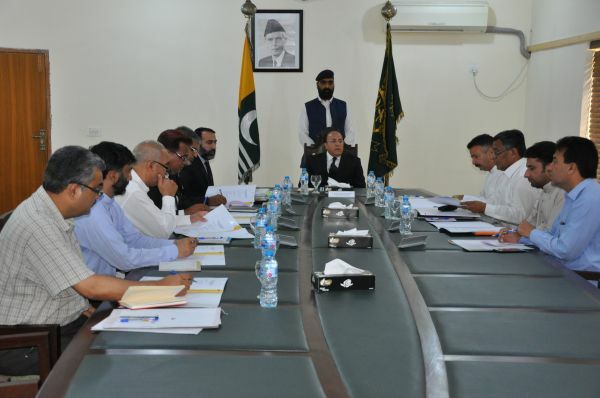 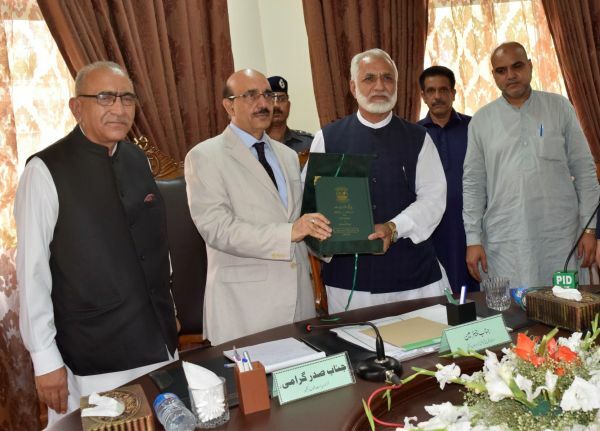 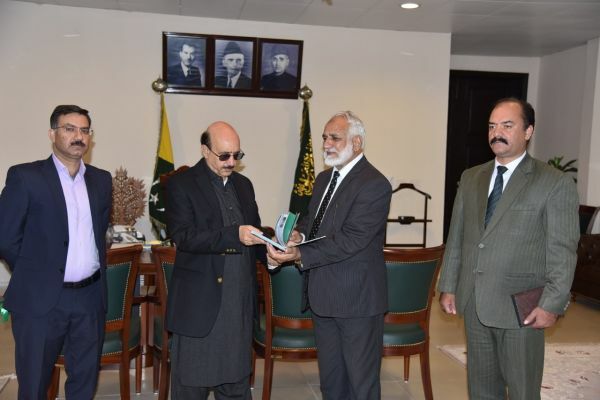 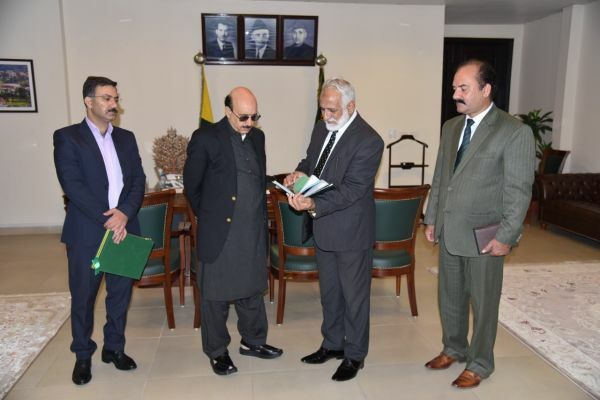 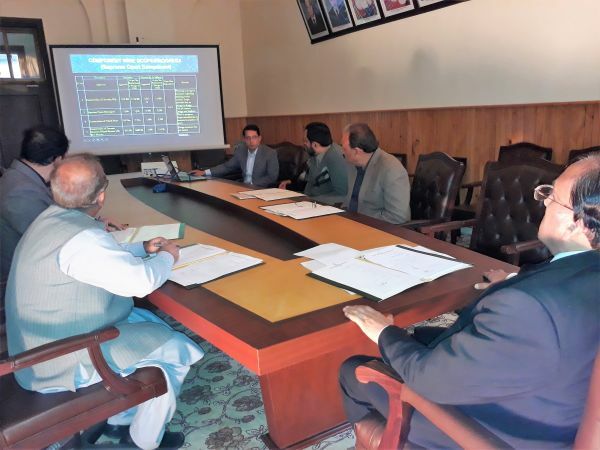 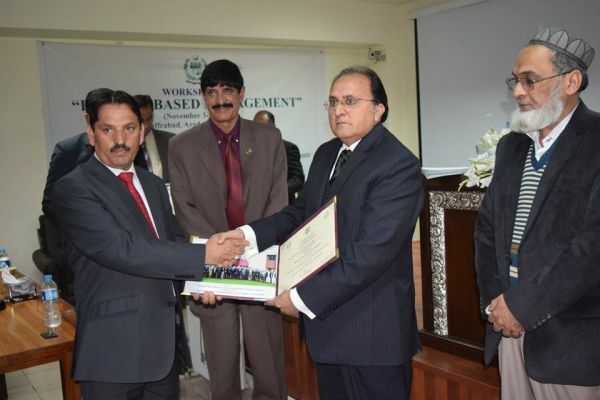 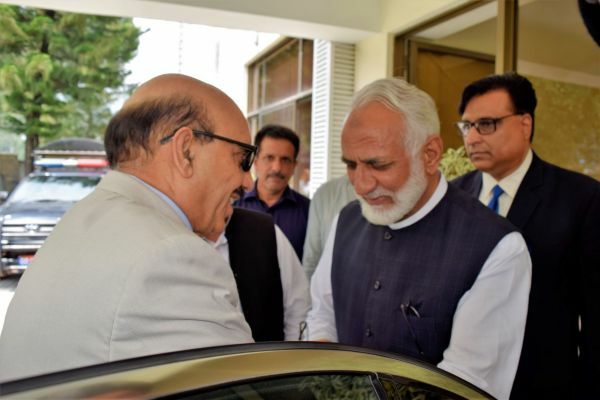 Muhammad Ibrahim Zia while presenting Annual Report of Supreme Court to Honorable President of Azad Jammu & Kashmir Sardar Masood Khan on 14th October 2018. 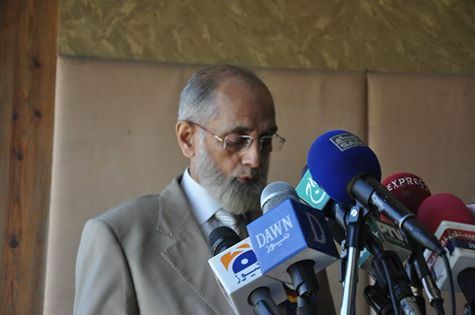 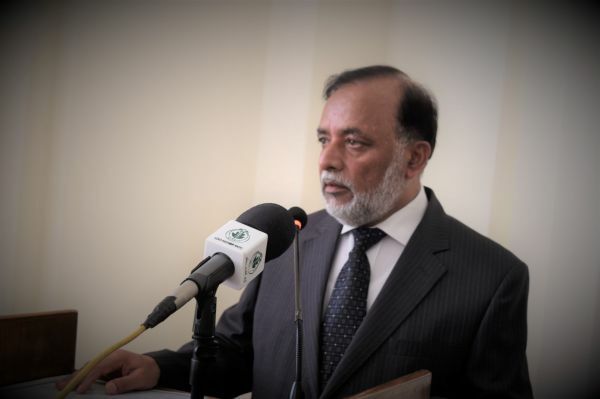 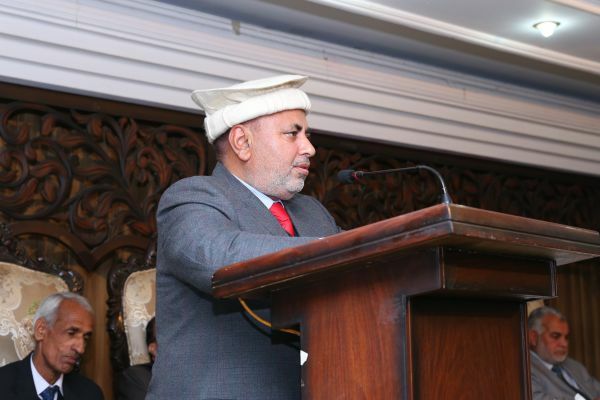 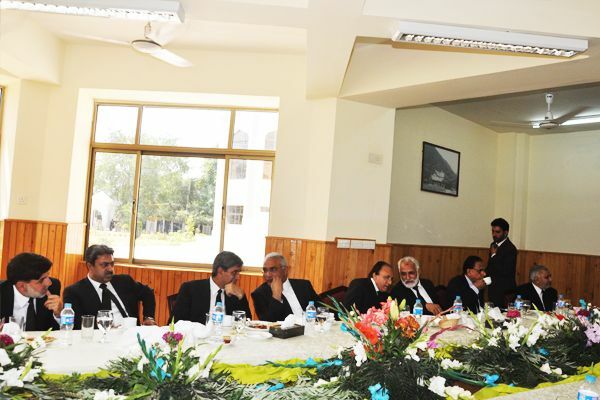 The Chairman Islamic Ideology Council, Honorable Chief Justice of Azad Jammu & Kashmir Justice Ch. 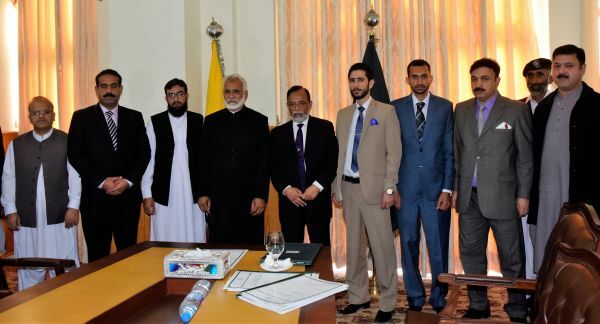 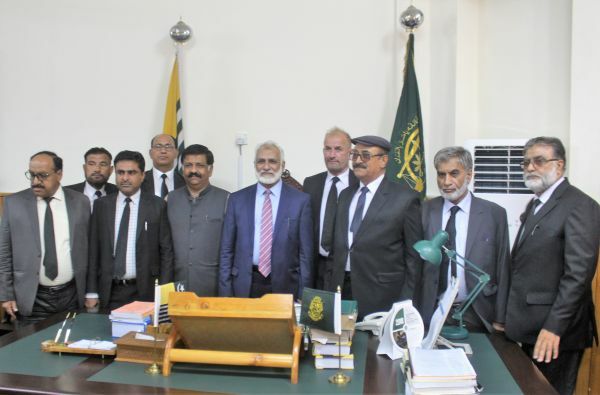 Muhammad Ibrahim Zia and Mr.Justice Raja Saeed Akram Khan,Senior Judge of Supreme Court of AJ&K along with the members of the Council of Islamic Ideology Azad Jammu & Kashmir on 10th October 2018. 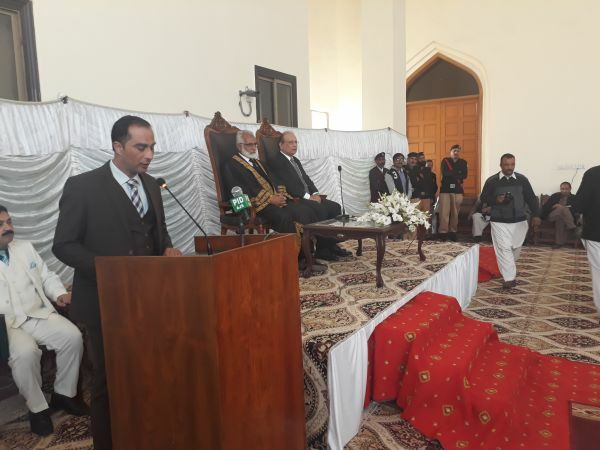 Commencement of Judicial Year 2018-2019 ceremony was held at Supreme Court Muzaffarabad on 1st October 2018. 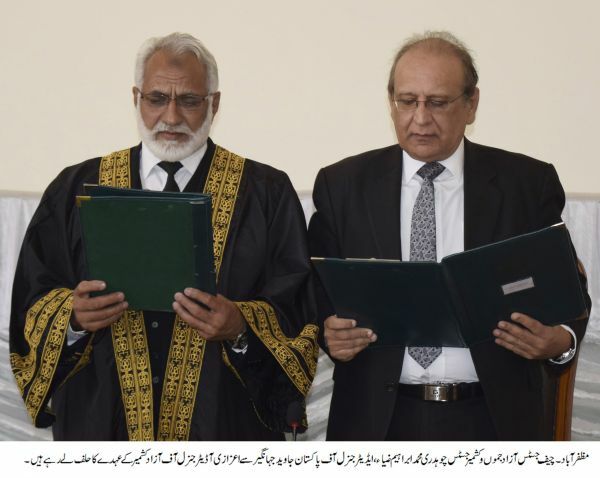 Mr. Justice Ch. 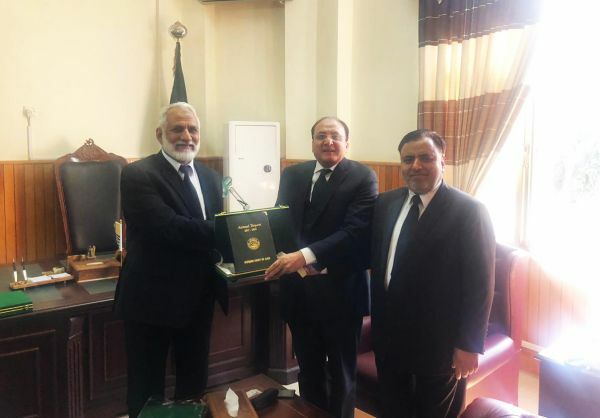 Muhammad Ibrahim Zia, the Hon’ble Chief Justice of AJ&K presenting the Annual Report 2017-18 to Mr. Justice Raja Saeed Akram Khan, the Hon’ble Senior Judge of Supreme Court of AJ&K. 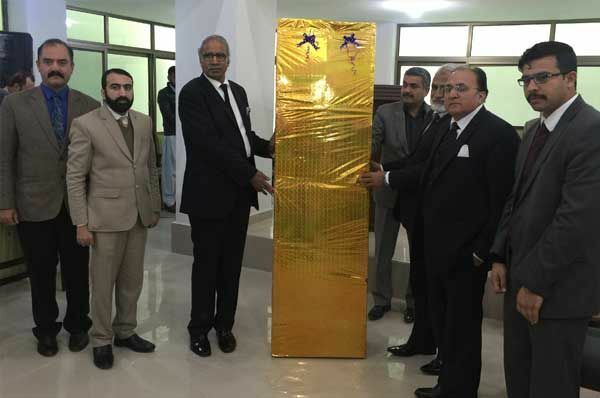 Mr. Justice Raja Saeed Akram Khan, the Hon’ble Senior Judge of Supreme Court of AJ&K presenting the Annual Report 2017-18 to the Hon’ble Chief Justice of AJ&K, Mr. Justice Ch. 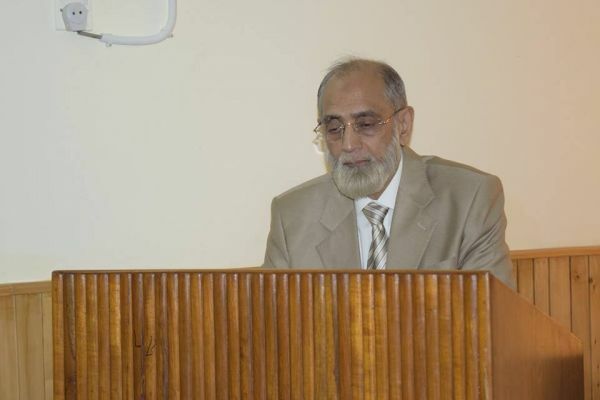 Muhammad Ibrahim Zia. 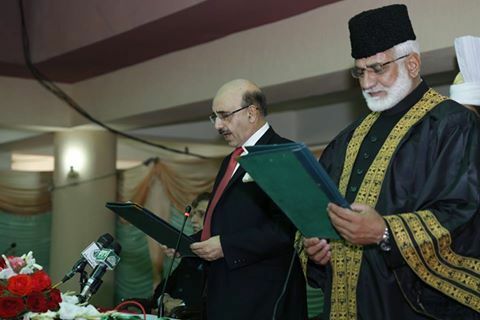 Mr. Justice Ch. 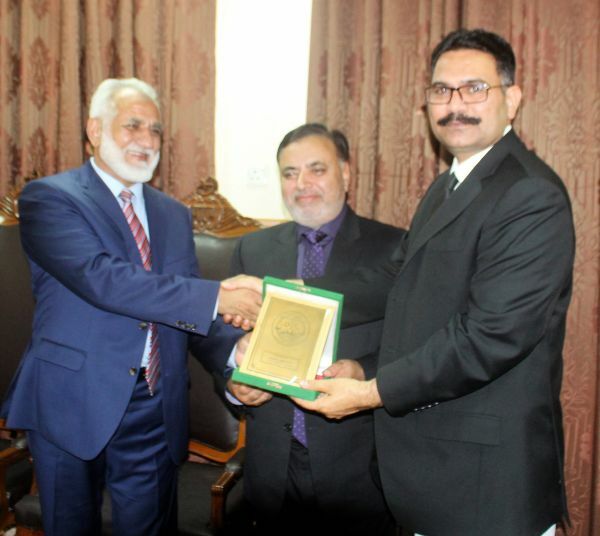 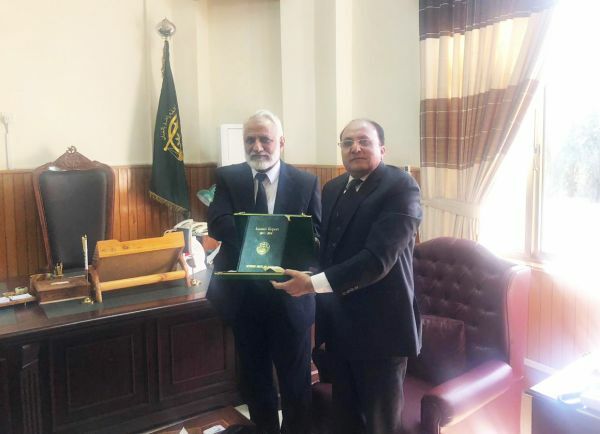 Muhammad Ibrahim Zia, the Hon’ble Chief Justice of AJ&K presenting the Annual Report 2017-18 to Mr. Justice Ghulam Mustafa Mughal, the Hon’ble Judge of Supreme Court of AJ&K. 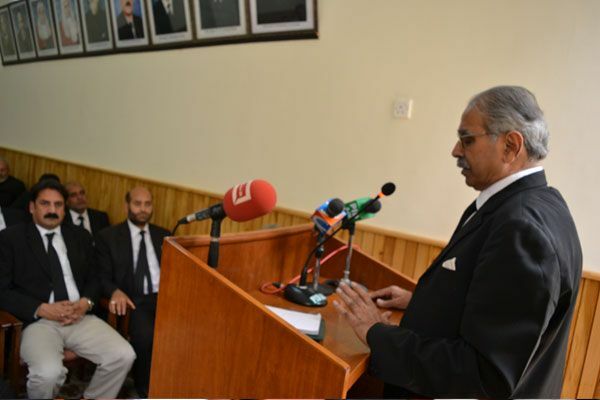 The Honorable Chief Justice of Azad Jammu & Kashmir Mr. Justice Ch. 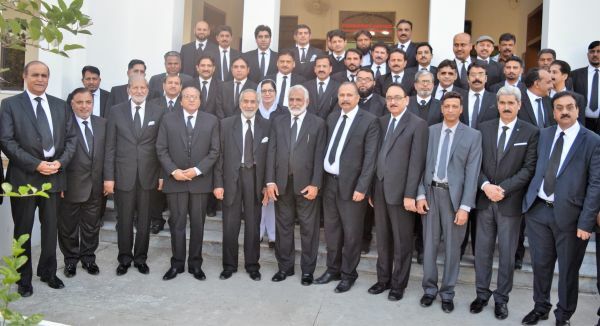 Muhammad Ibrahim Zia and Mr. Justice Ghulam Mustafa Mughal Honorable Judge of Supreme Court while in a meeting with advocates from lahore High Court. 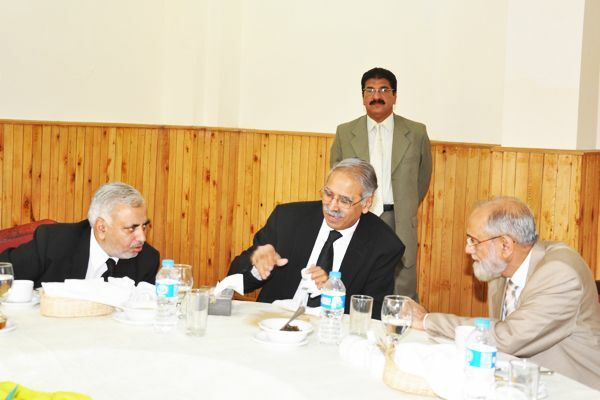 The Honorable Chief Justice of Azad Jammu & Kashmir Mr. Justice Ch. 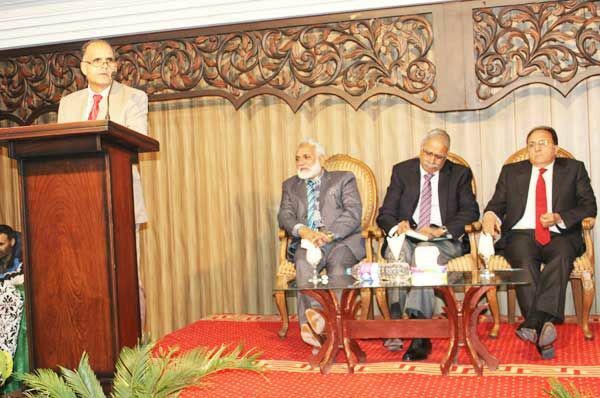 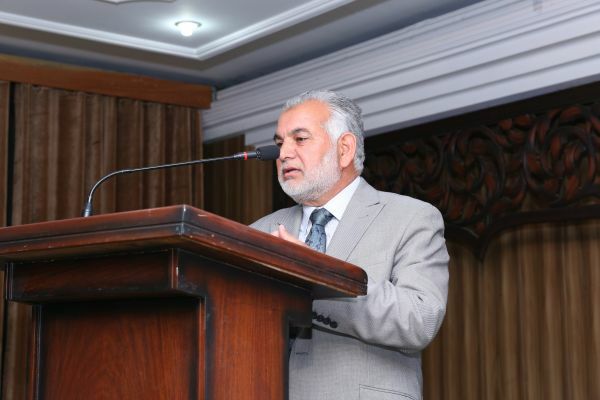 Muhammad Ibrahim Zia while addressing to the international science conference on 15-09-2018. 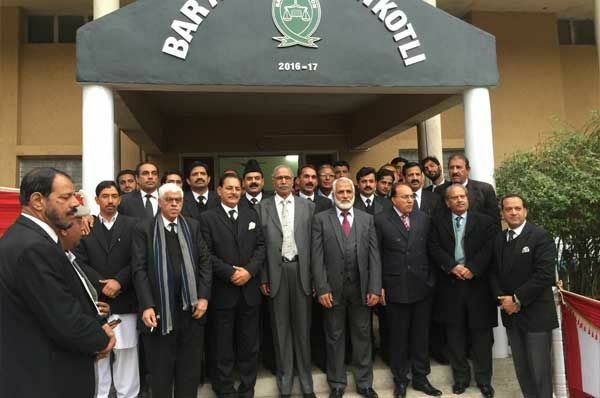 The Lawyer Community in Pakistan shall raise their voices against abrogation of Article 35A by India regarding special status of occupied Jammu & Kashmir Says Honorable Chief Justice of Azad Jammu & Kashmir Justice Ch. 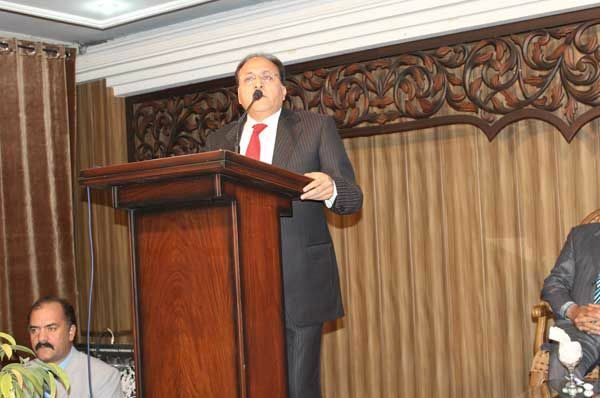 Muhammad Ibrahim Zia. 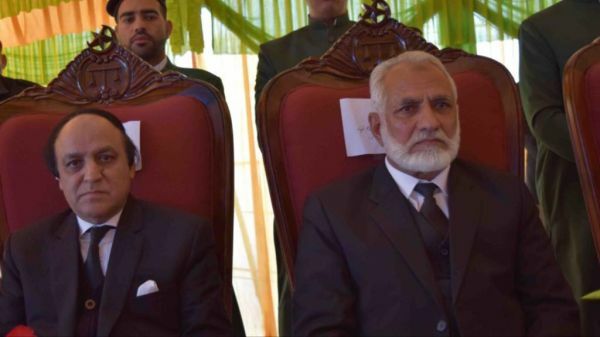 Mr. Justice Raja Saeed Akram Khan, Acting Chief Justice of Azad Jammu & Kashmir and Mr. Justice Ghulam Mustafa Mughal Hon’ble Judge Supreme Court of Azad Jammu & Kashmir at Pakistan’s 71st Independence day function on 14th August 2018, arranged in Supreme Court Building Muzaffarabad. 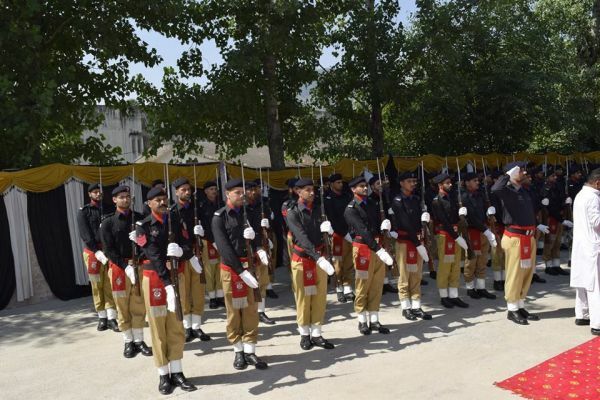 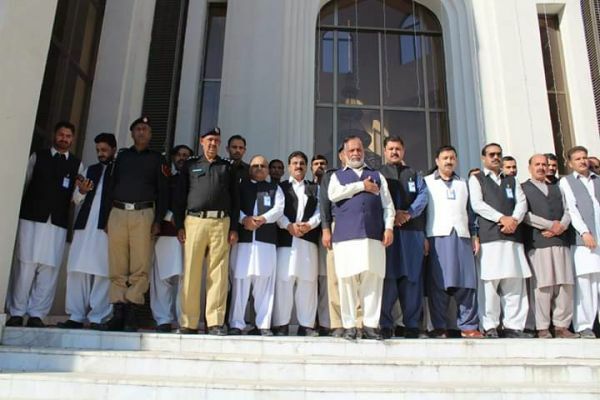 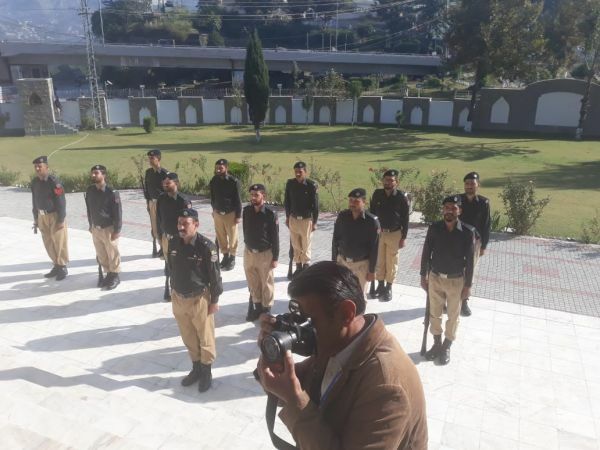 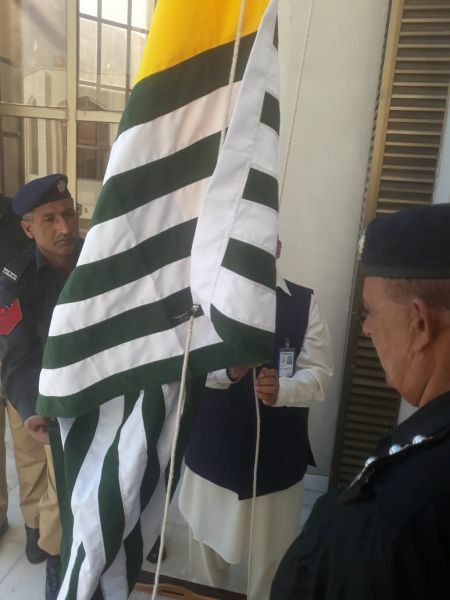 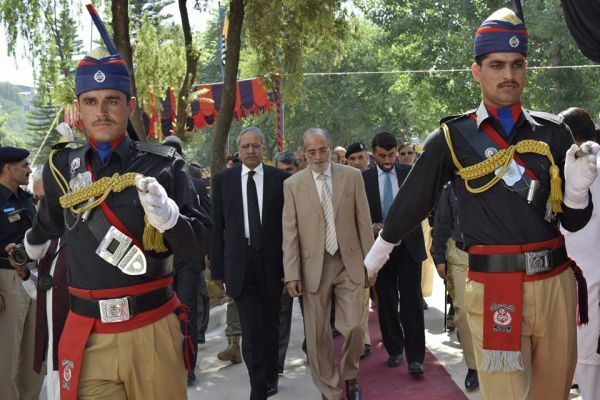 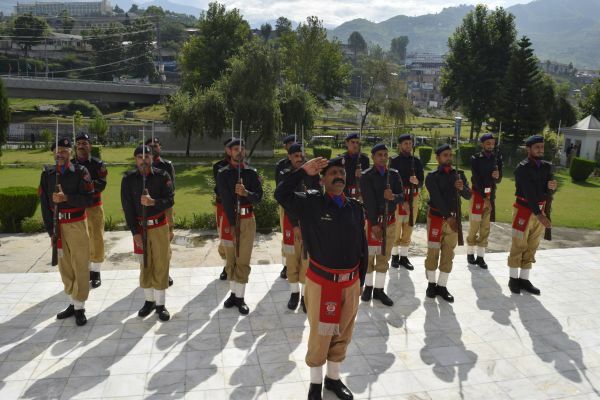 Pakistani flag was raised by Hon’ble Acting Chief Justice followed by salute by a contingent of AJK police. 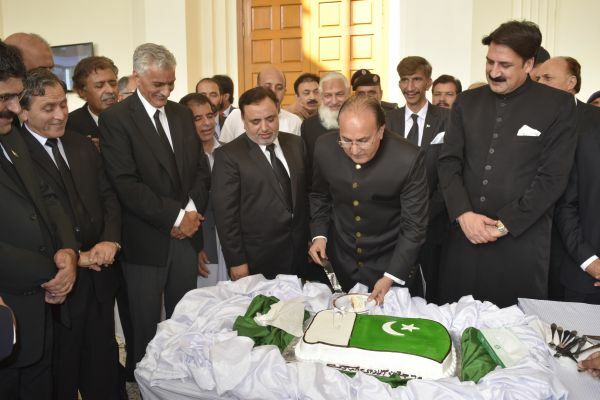 A cake was cut by the Hon’ble Acting Chief Justice at this occasion and dua was offered to remember the souls of ancestors who paid their lives during their exemplary struggle for the creation and building of Pakistan. 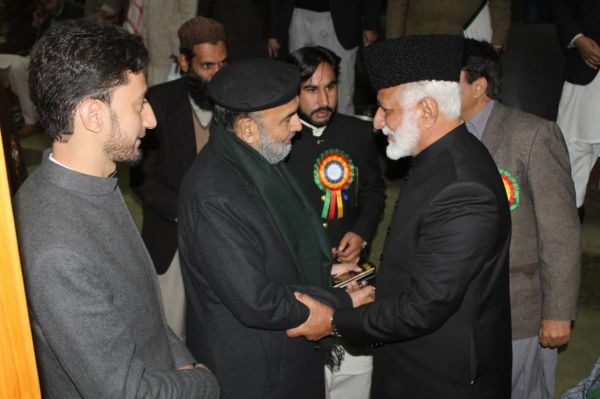 Dua was also offered for the liberation of Kashmir and success of Kashmir freedom struggle to its logical conclusion. 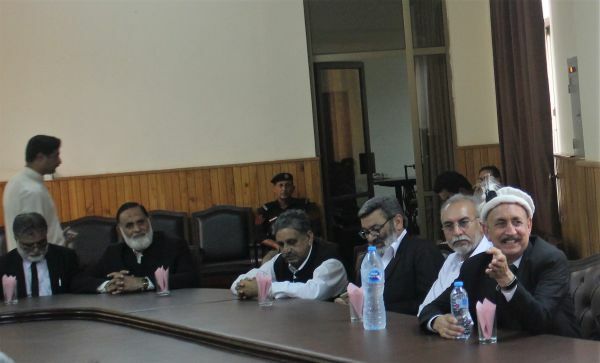 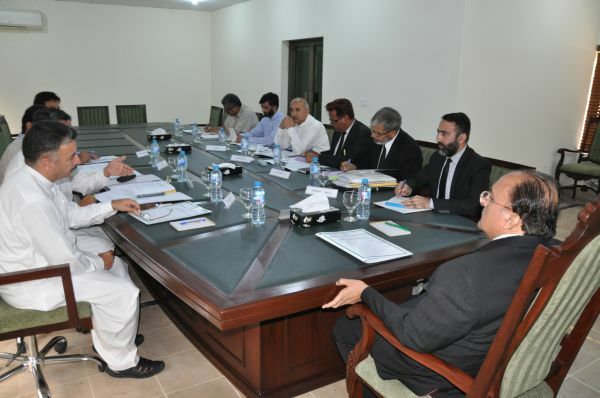 Mr. Justice Raja Saeed Akram Khan, Hon’ble Acting Chief Justice of AJ&K, presiding over a meeting at Supreme Court Branch Registry Mirpur, on 10th August 2018, regarding under construction buildings of Judicial Complex and High Court Building Mirpur . 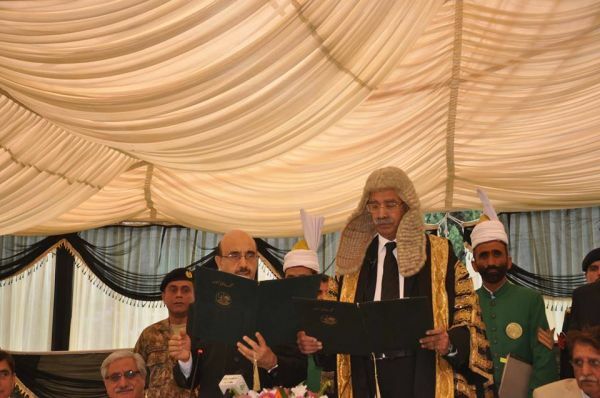 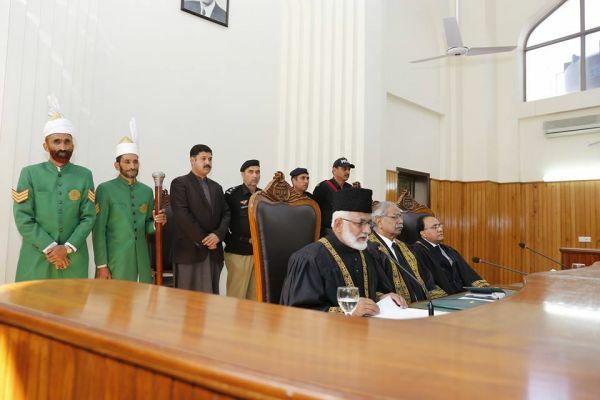 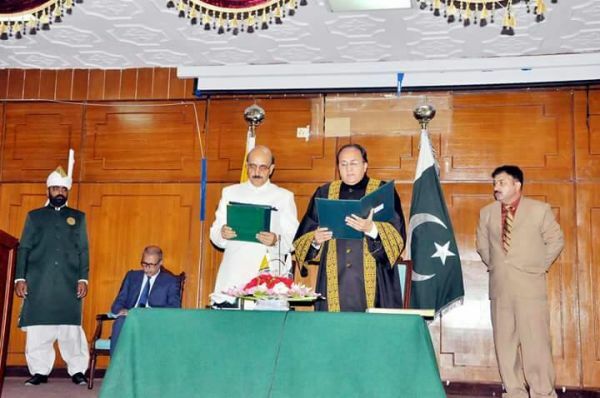 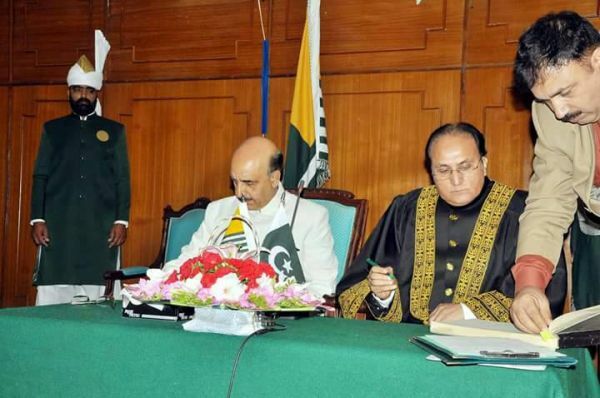 Mr. Justice Raja Saeed Akram Khan the Hon’ble senior Judge of Supreme Court of Azad Jammu and Kashmir took oath as Acting Chief Justice of Azad Jammu & Kashmir. 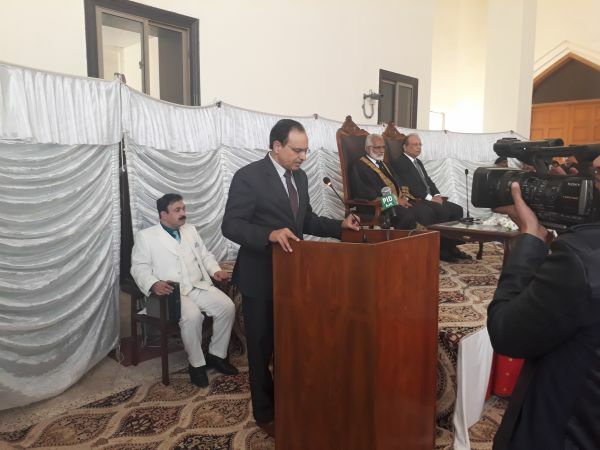 Mr. Justice Ghulam Mustafa Mughal next senior judge Supreme Court of AJ&K administered oath to the Hon’ble Acting Chief Justice. 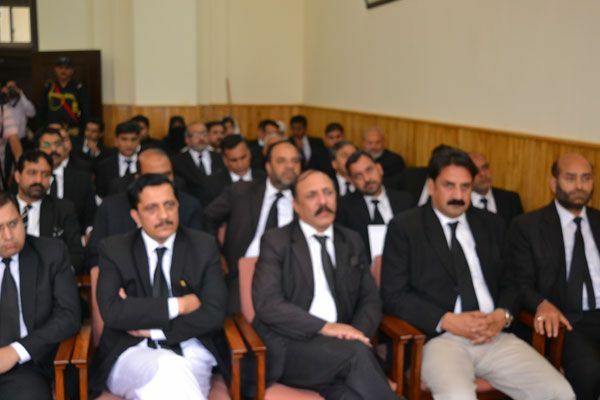 The oath ceremony was held in Supreme Court Building Muzaffarabad today on 30th July 2018. 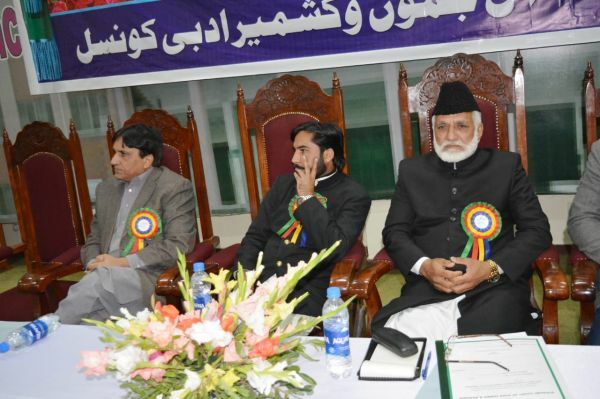 The Chairman Islamic Ideology Council, Honorable Chief Justice of Azad Jammu & Kashmir Justice Ch. 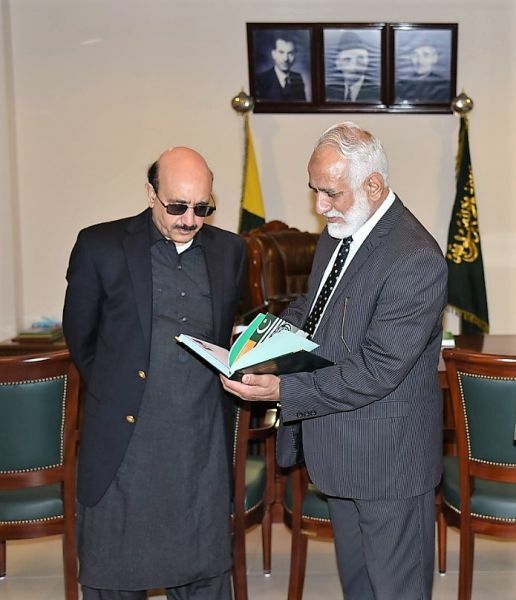 Muhammad Ibrahim Zia presenting the report of Islamic Ideology Council to Mr. Sardar Masood Khan worthy president of AJK on 23rd July, 2018 at Muzaffarabad. 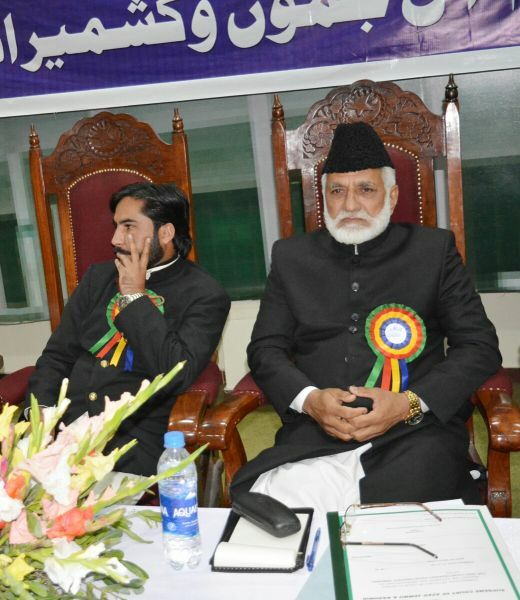 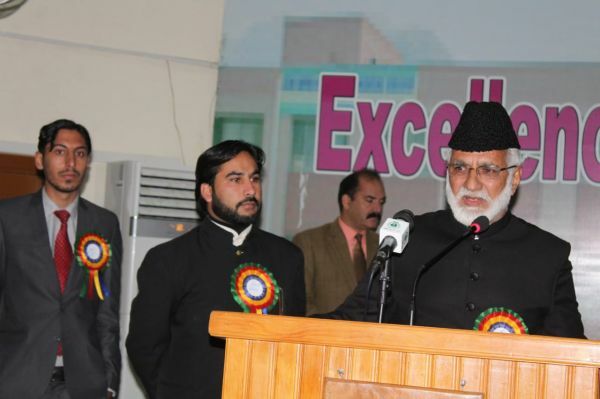 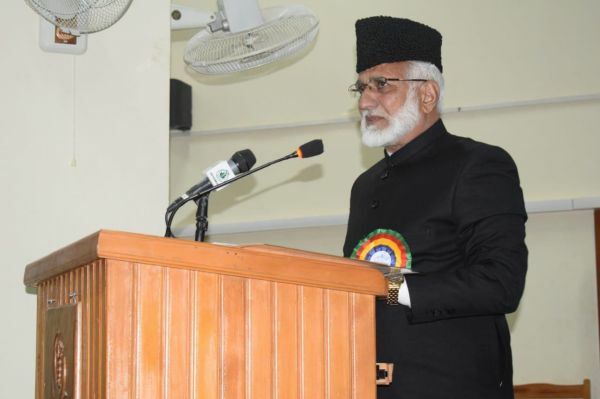 The Chairman Islamic Ideology Council, Honorable Chief Justice of Azad Jammu & Kashmir Justice Ch. 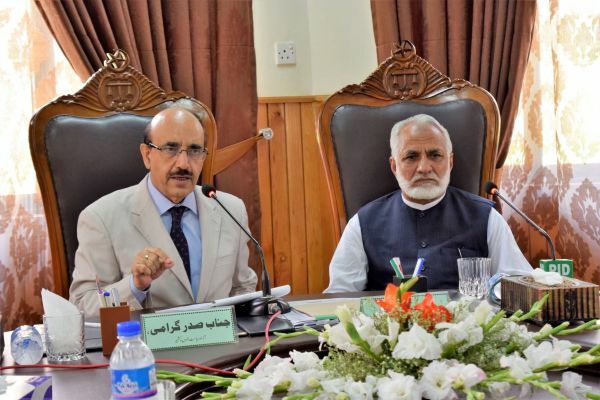 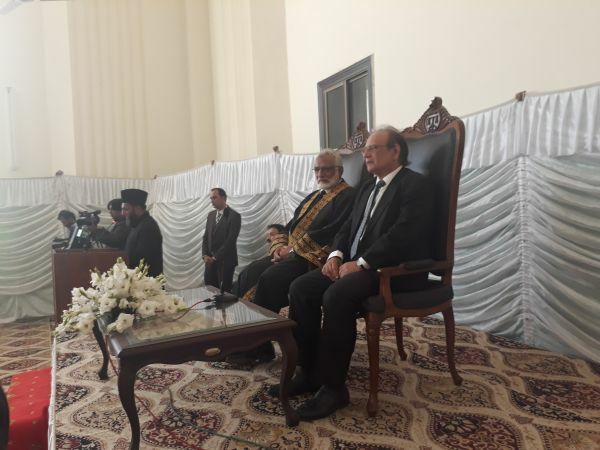 Muhammad Ibrahim Zia presiding the chair whereas worthy president of AJK Mr. Sardar Masood Khan chief guest on the occasion on 23rd July, 2018 at Muzaffarabad. 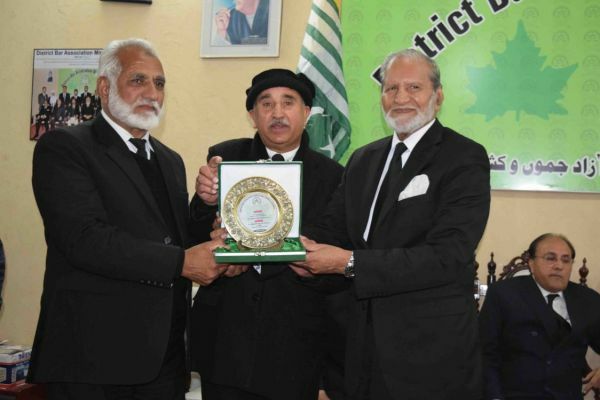 The Chairman Islamic Ideology Council, Honorable Chief Justice of Azad Jammu & Kashmir Justice Ch. 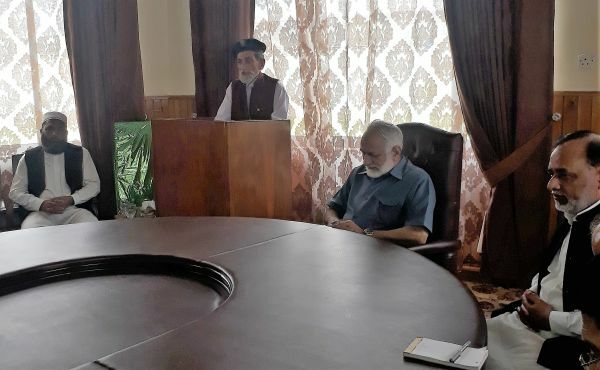 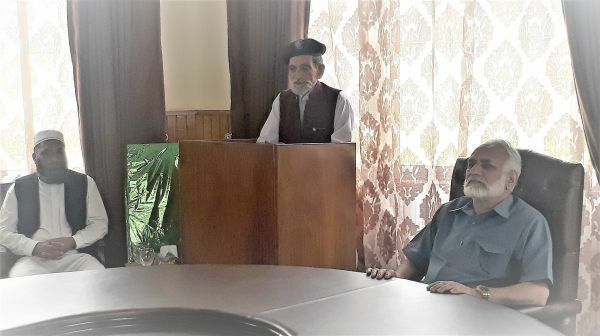 Muhammad Ibrahim Zia addressing the reference of death condolence of former Chief Justice Raja Muhammad Khurshid Khan and Maulana Muhammad Ishaq Khan Madni member Islamic Ideology Council on 23rd July, 2018 at Muzaffarabad. 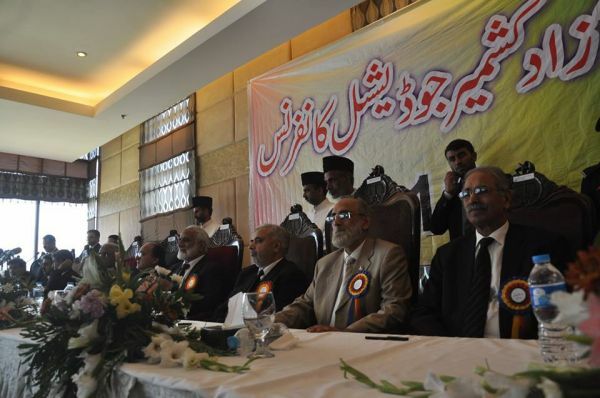 The Chairman Islamic Ideology Council, Honorable Chief Justice of Azad Jammu & Kashmir Justice Ch. 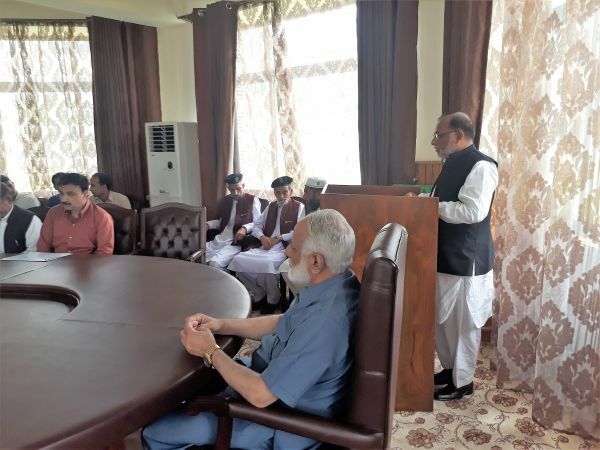 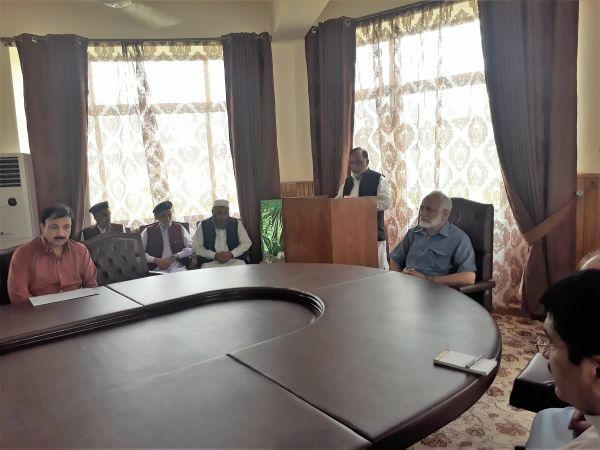 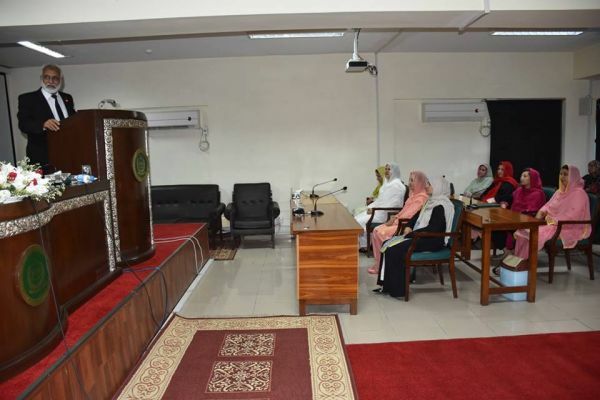 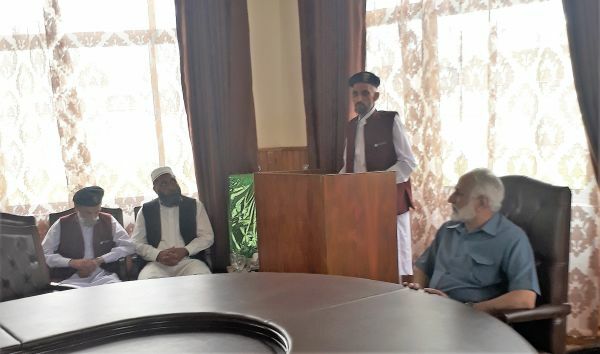 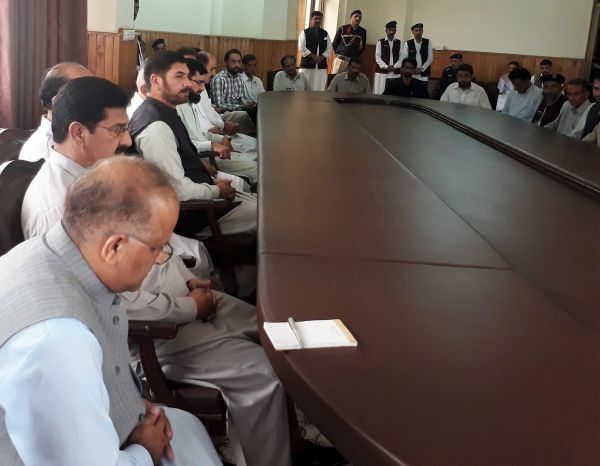 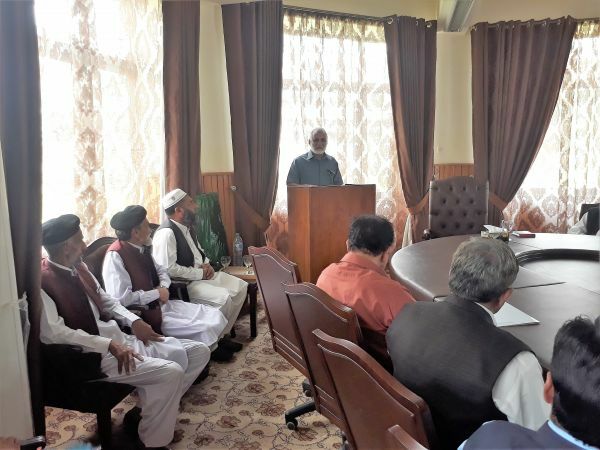 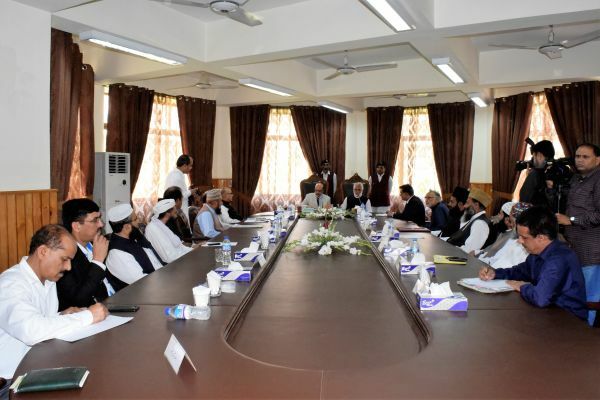 Muhammad Ibrahim Zia addressing the farewell of members of Islamic Ideology Council on 23rd July, 2018 at Muzaffarabad. 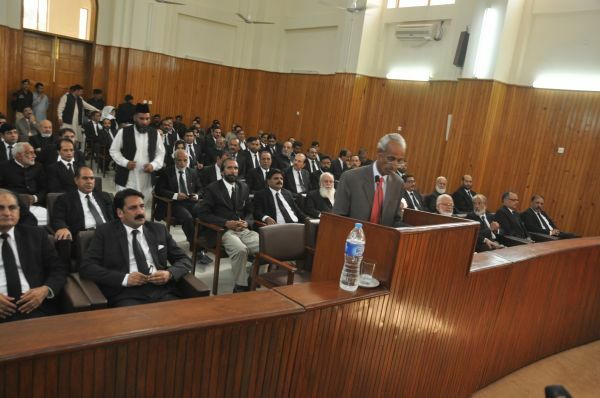 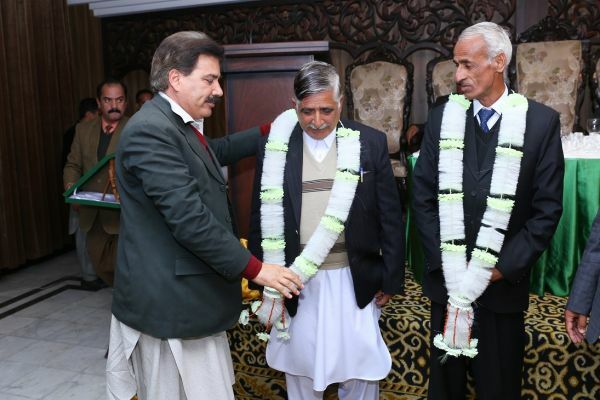 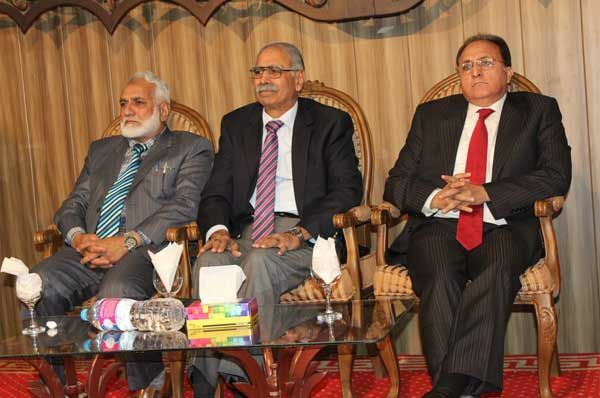 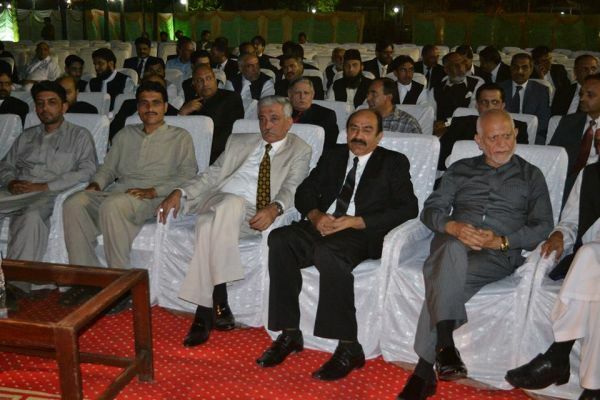 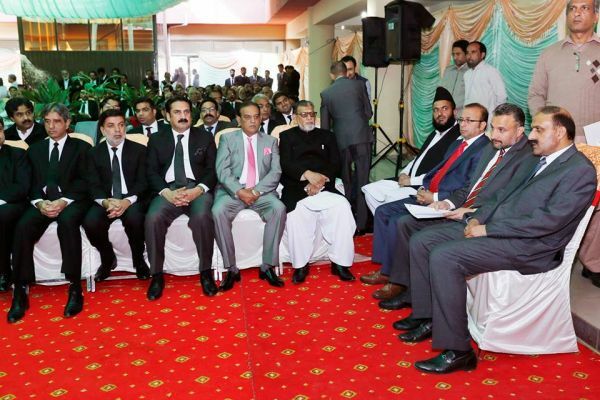 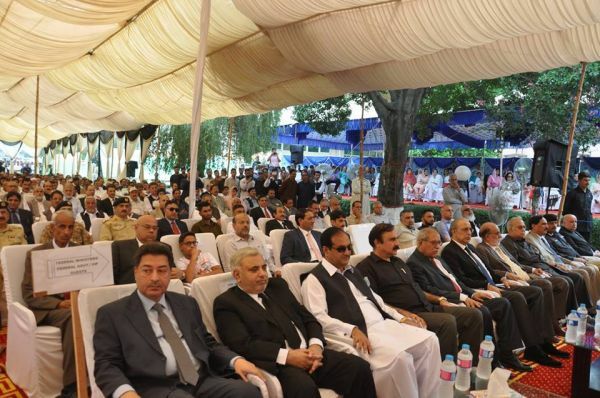 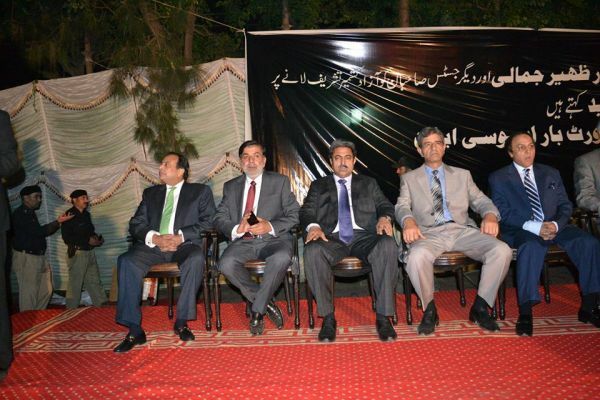 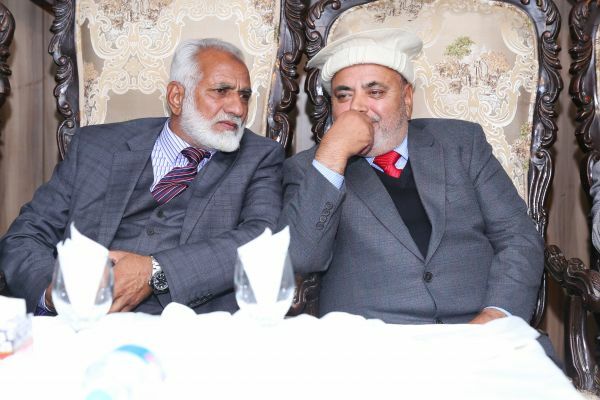 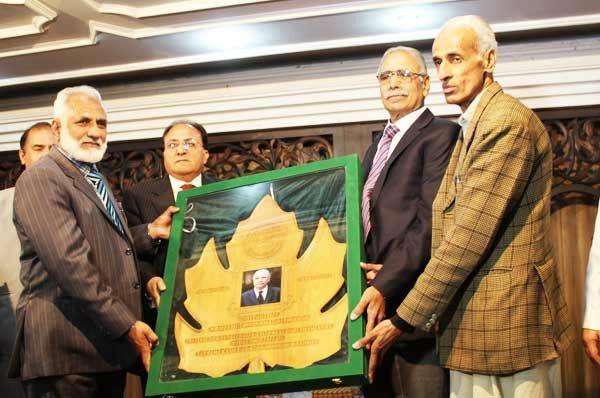 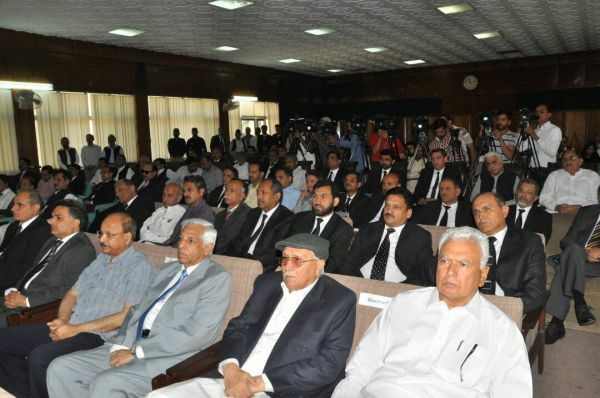 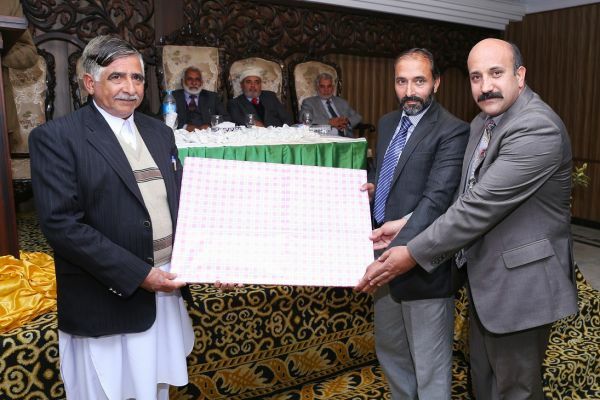 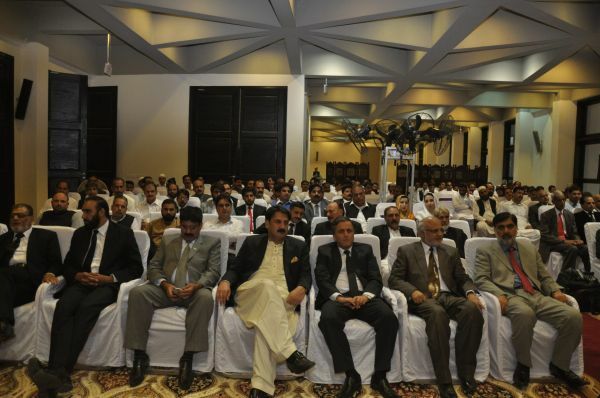 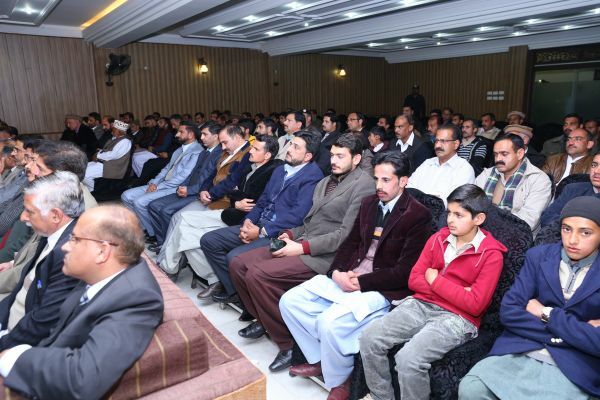 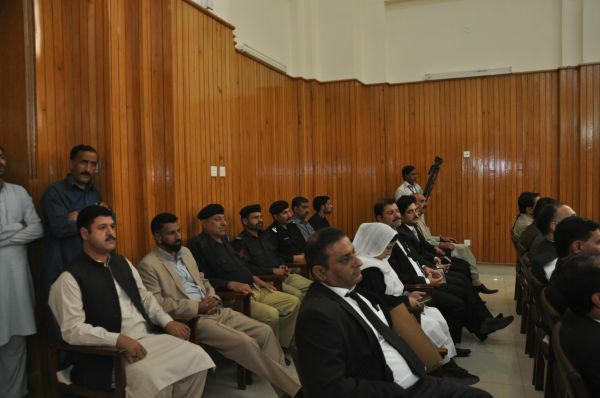 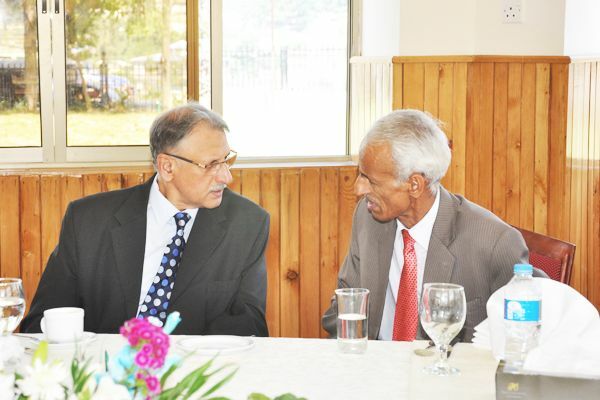 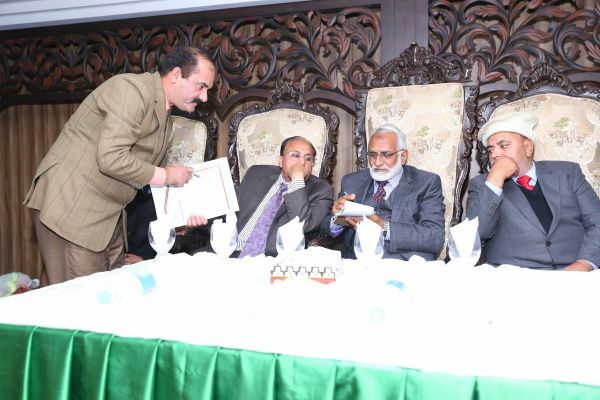 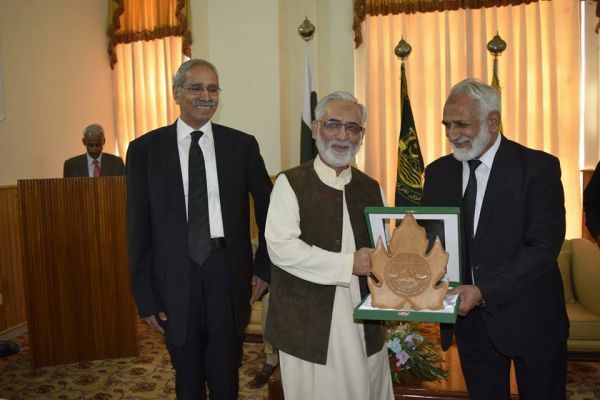 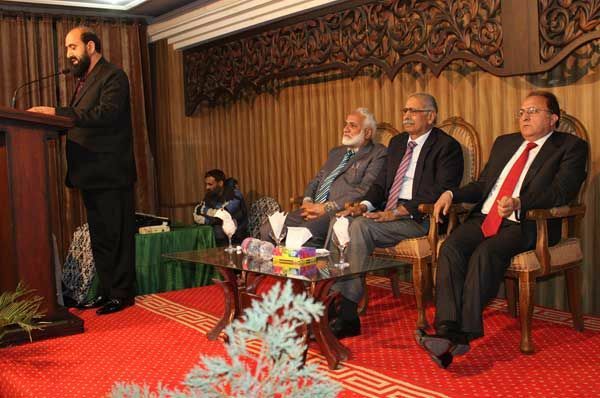 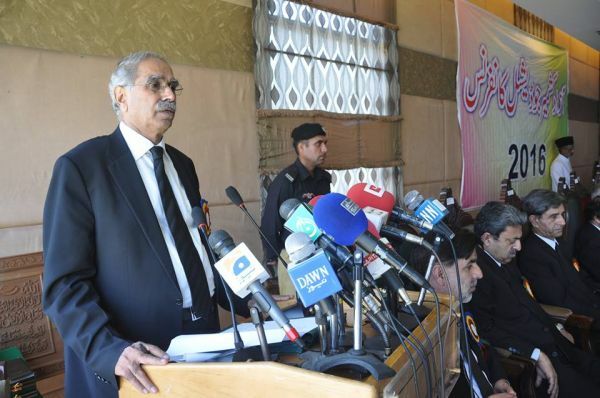 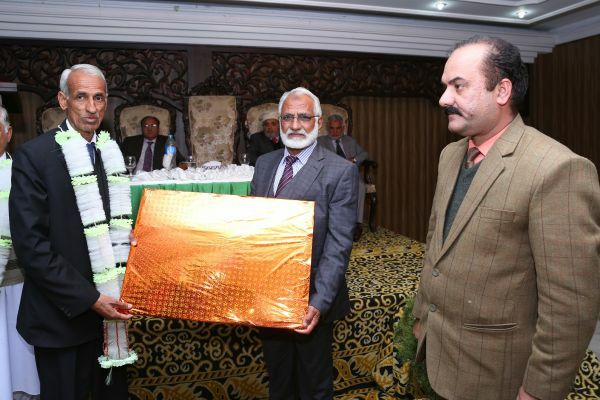 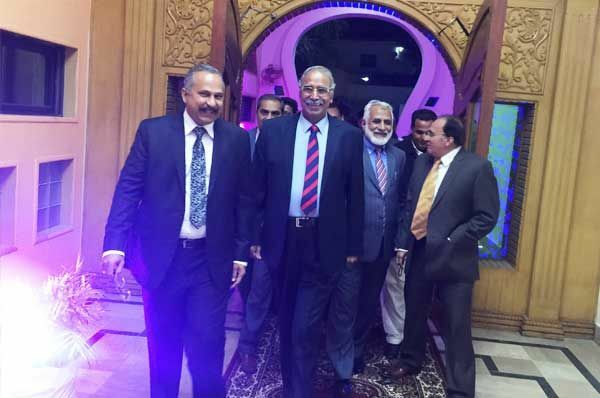 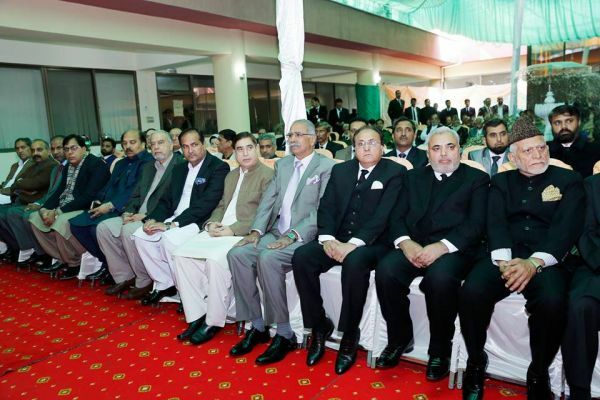 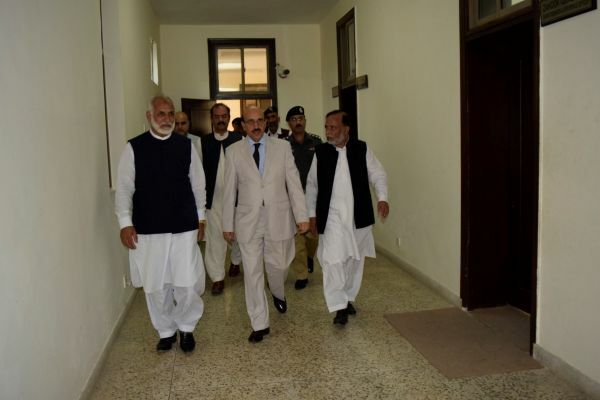 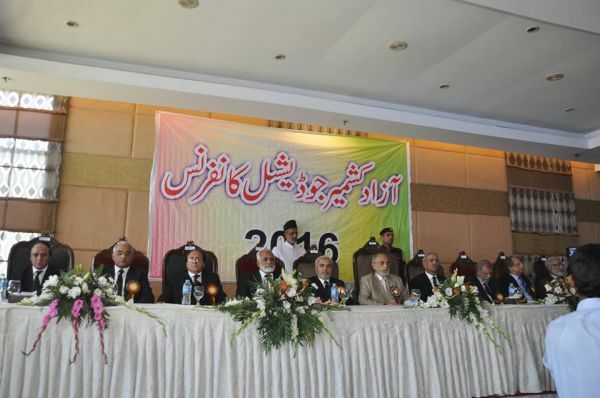 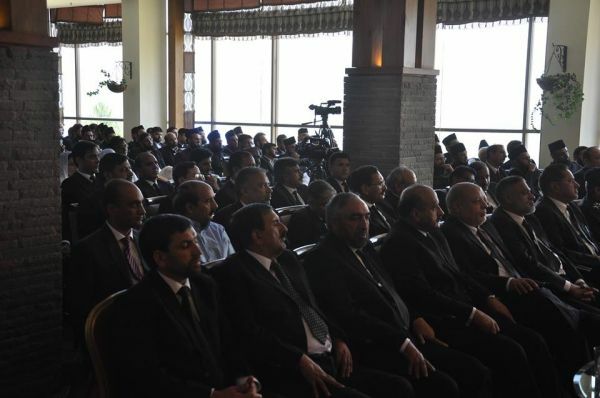 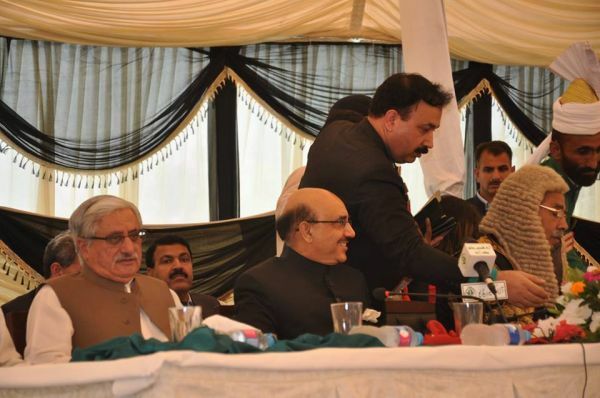 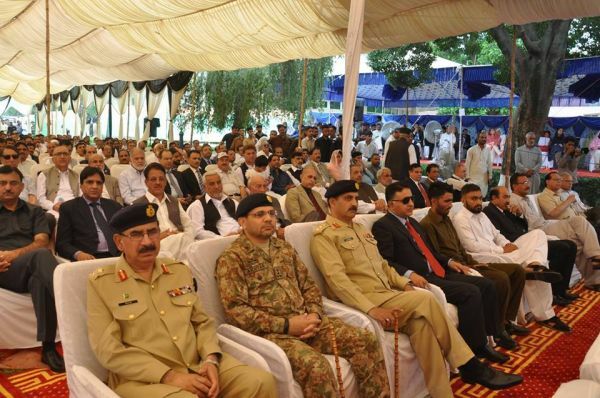 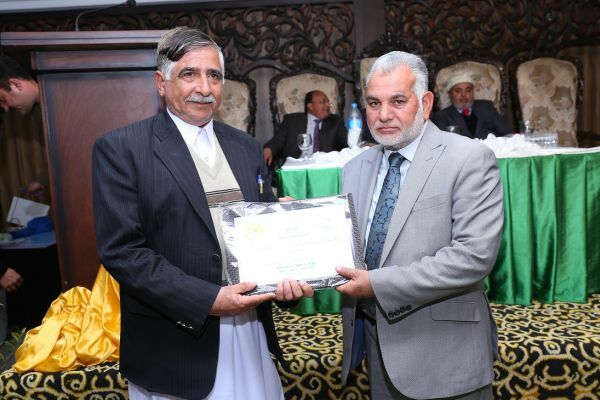 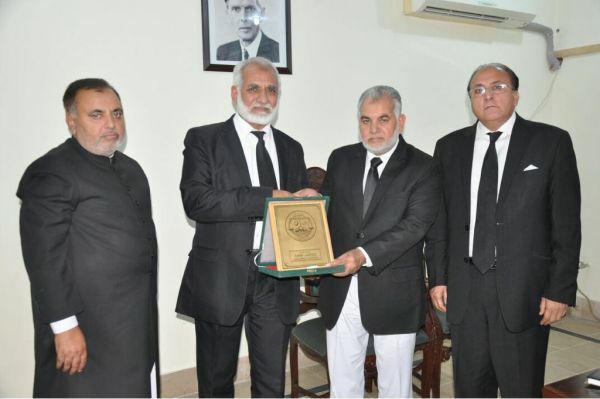 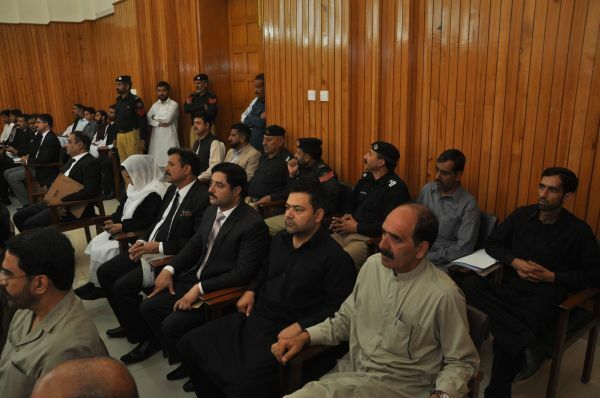 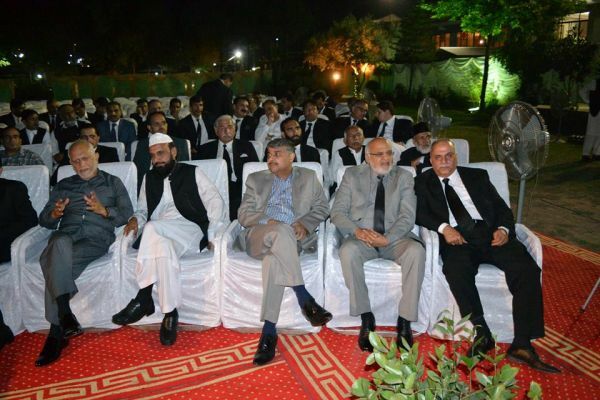 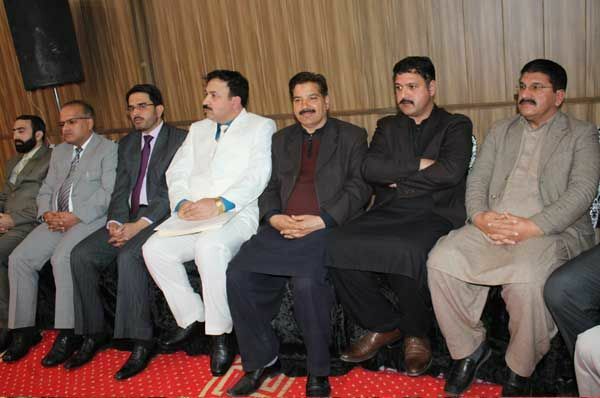 The photos of the farewell chaired by Honorable Chief Justice of Azad Jammu & Kashmir Justice Ch. 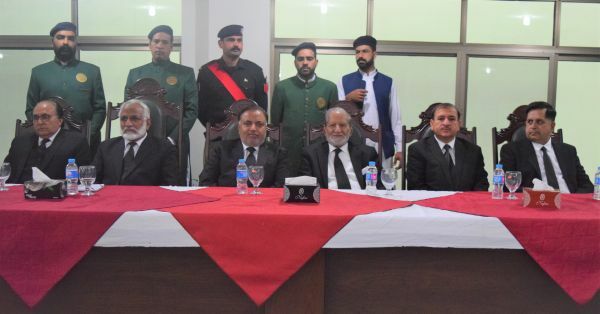 Muhammad Ibrahim Zia on 30th June, 2018 at Muzaffarabad on the eve of retirement of Mr. Mehboob Ahmed & Mr. Ismail NQs Supreme Court. 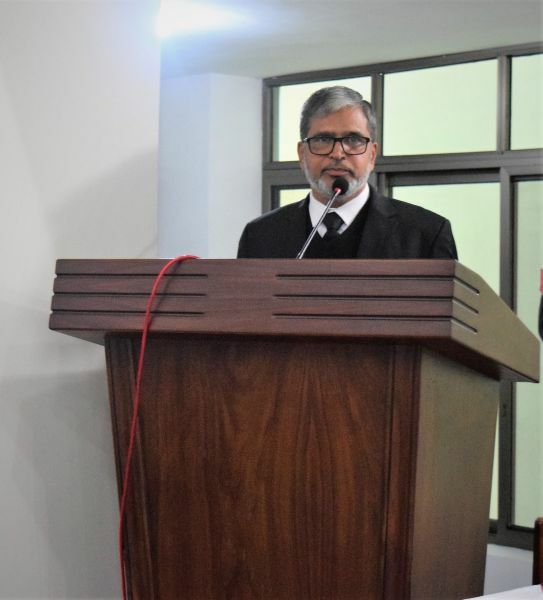 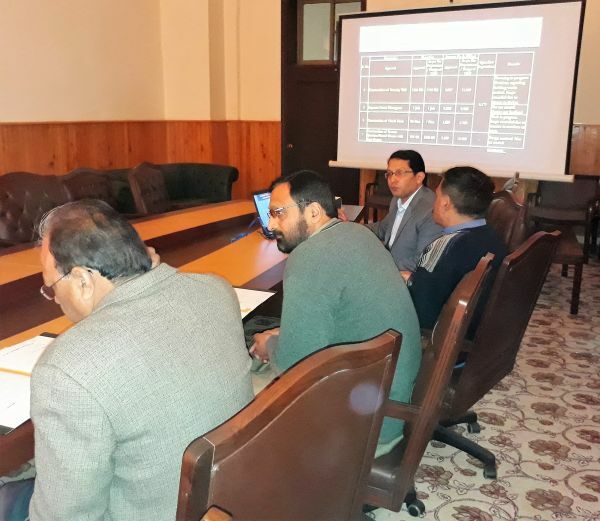 Day-2 of 2nd Professional Development Course on Research Methodology & Effective Communication/Presentation Skills for Research Officers of AJ&K Supreme Court, AJ&K High Court and Jammu and Kashmir Liberation Cell. 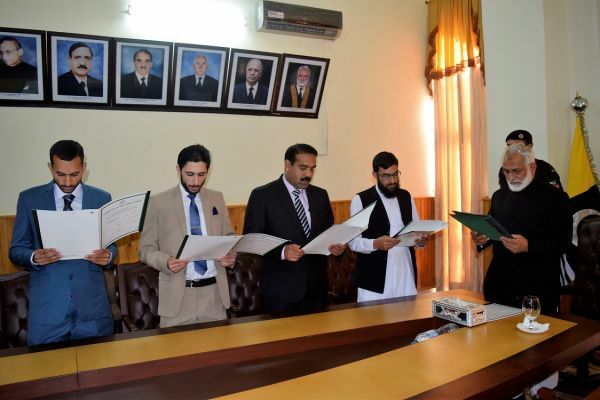 Oath taking ceremony of new appointed Readers and Judgment Writer. 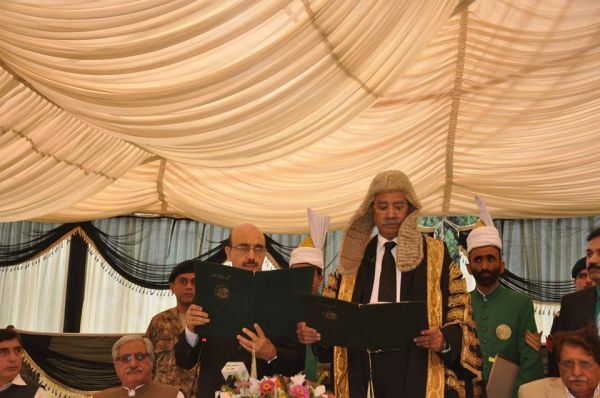 Oath was administered by the Ch. 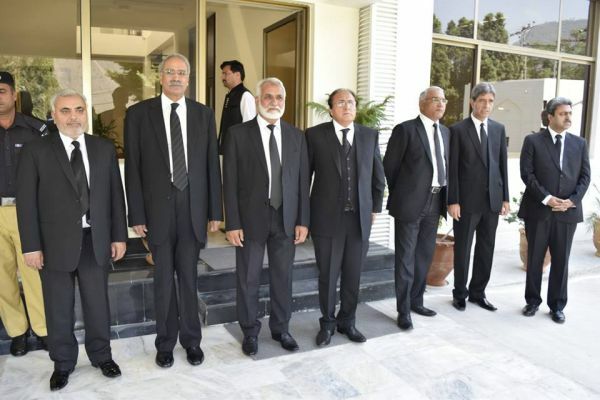 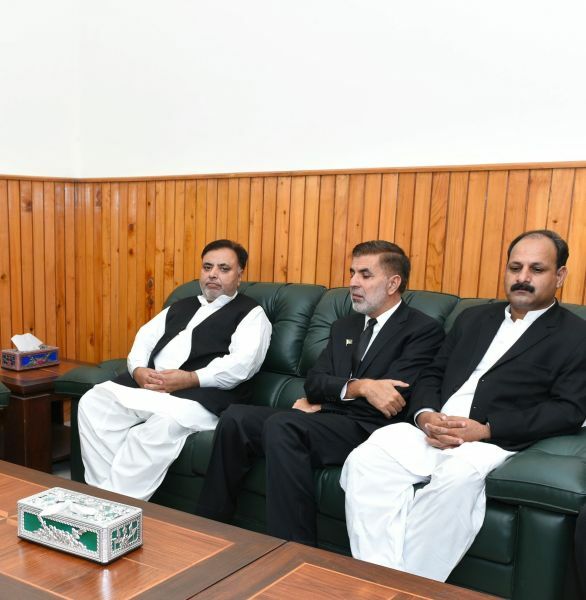 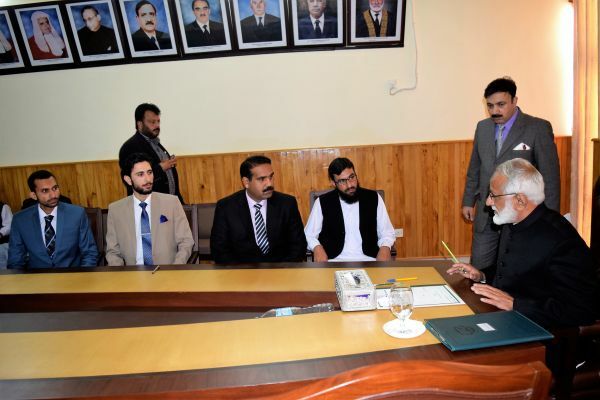 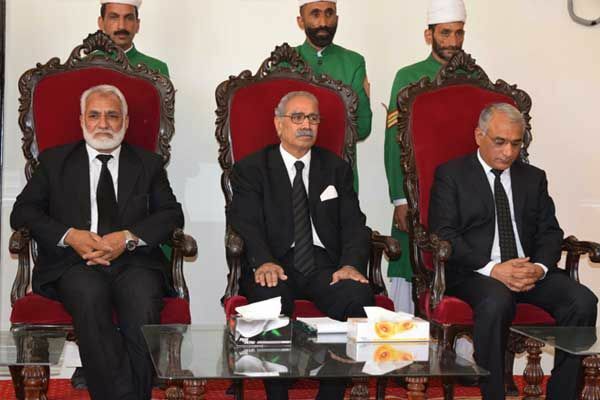 Muhammad Ibrahim Zia the Hon’ble Chief Justice of AJ&K to the newly appointed officers. 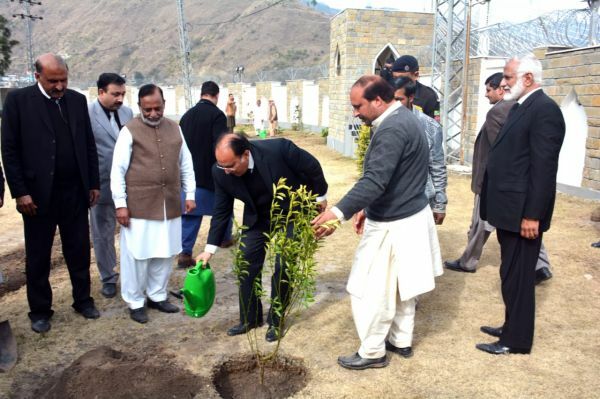 As a gesture of forestation program by Forest Department of the State of Azad Jammu & Kashmir Ch. 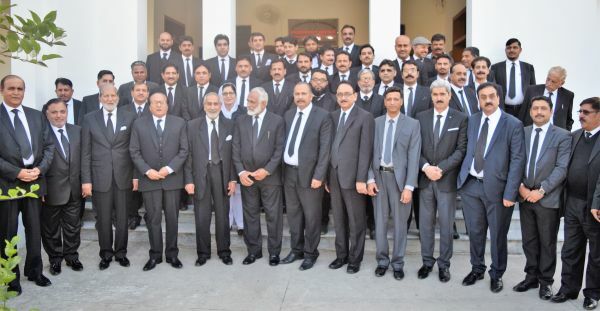 Muhammad Ibrahim Zia the Hon’ble Chief Justice of AJ&K, Hon’ble Judges of AJ&K Supreme Court, Registrar Supreme Court of AJK and Syed Zahoor-ul-Hassan Gillani Secretary Forest Govt. 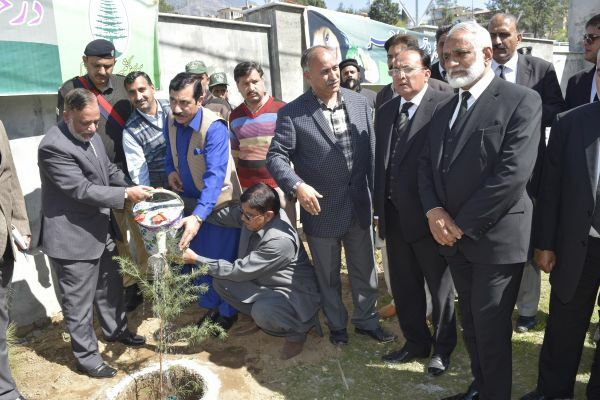 of AJK planted different trees in the premises of Supreme Court of AJK, Muzaffarabad on 6th March 2018. 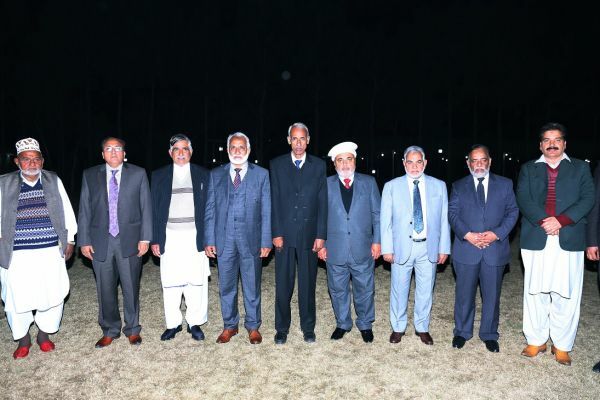 The photos of the farewell dinner hosted by the establishment of the Azad Jammu & Kashmir Supreme Court at Neelum View Hotel on 7th February, 2018 at Muzaffarabad on the eve of retirement of Mr. Riaz Ahmed Registrar Supreme Court & Mr. Sheikh Qutub-u-Din Librarian Supreme Court. 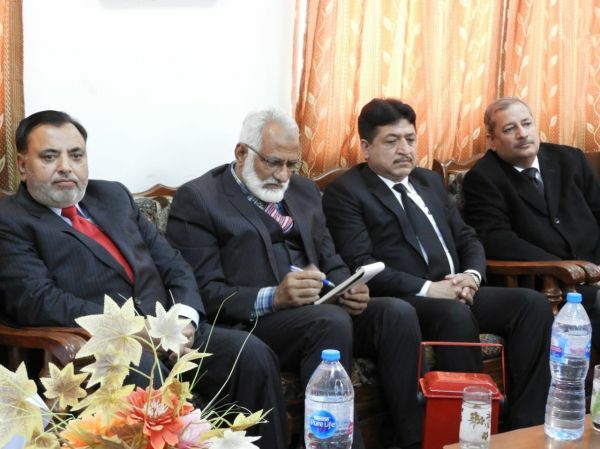 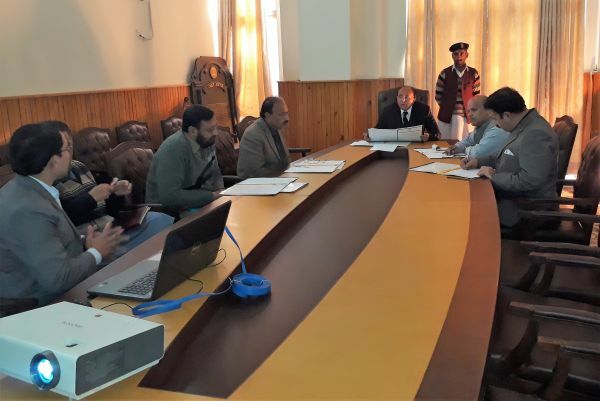 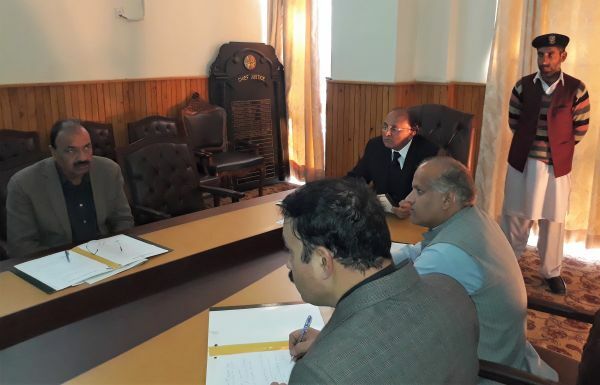 The senior Judge of Azad Jammu and Kashmir Supreme Court Mr. Justice Raja Saeed Akram Khan chaired a meeting regarding Supreme Court Building Committee on 10-01-2018. 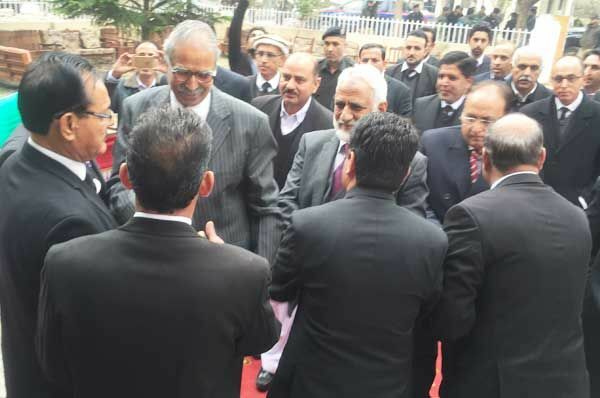 Oath taking ceremony of Auditor General of AJ&K on 7th of December 2017. 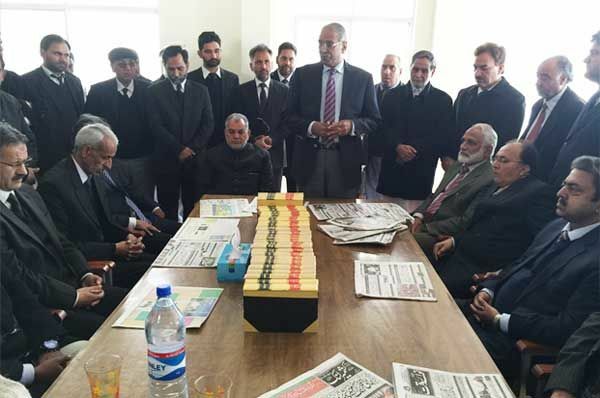 Hon’ble Chief Justice of AJ&K and Hon’ble Judges of Supreme Court distributed certificates of enrolment to the newly enrolled Advocates. 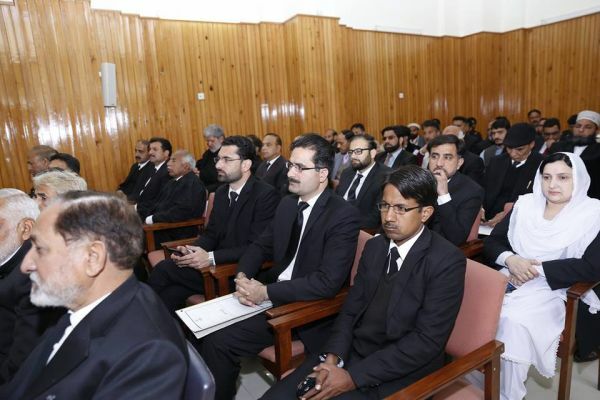 Twenty six advocates from different districts of Azad Jammu & Kashmir were enrolled as advocates of Supreme Court. 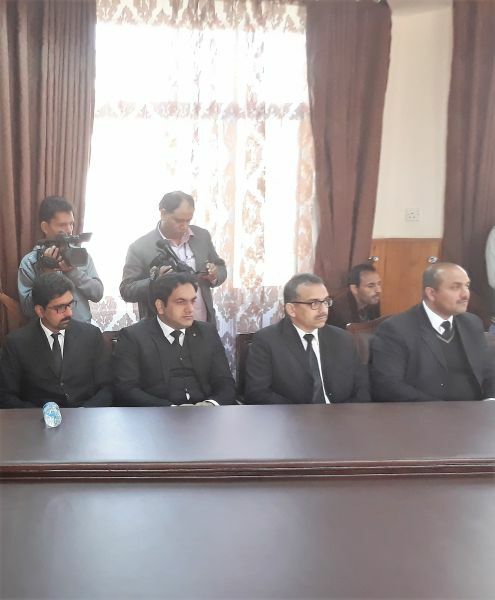 An enrolment function was held at Supreme Court of AJ&K, Muzaffarabad on 6th December 2017. 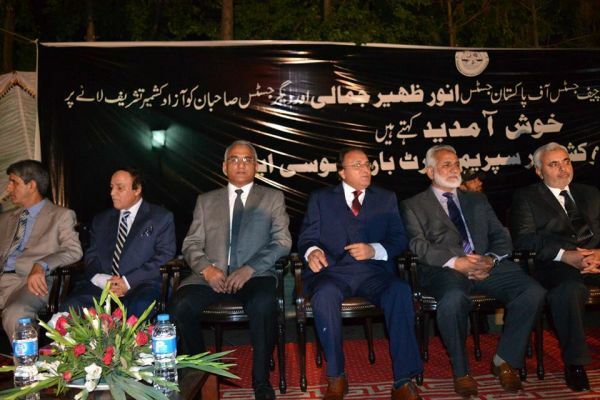 Mr. Justice Ch. 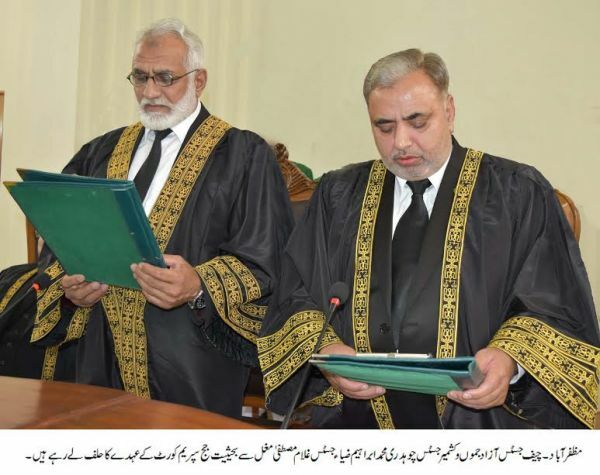 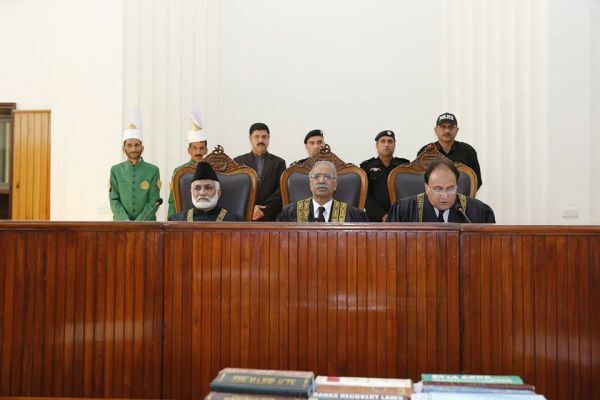 Muhammad Ibrahim Zia, Hon’ble Chief Justice of Azad Jammu & Kashmir administered oath to Sardar Abdul Hameed Khan as Ad-hoc Judge Supreme Court of AJ&K. 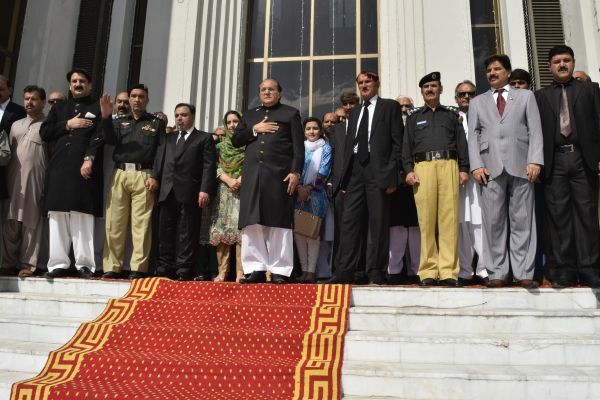 Oath taking ceremony of. 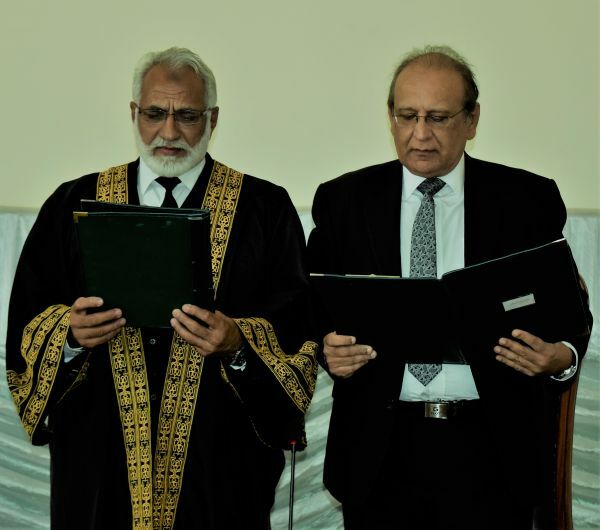 The oath ceremony was held on 31st October 2017 in Supreme Court Room No. 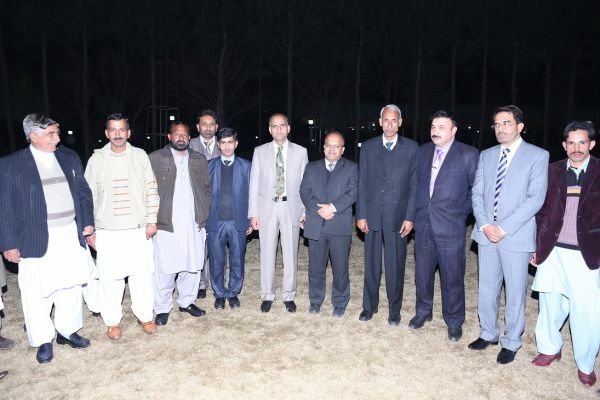 1 of AJK. 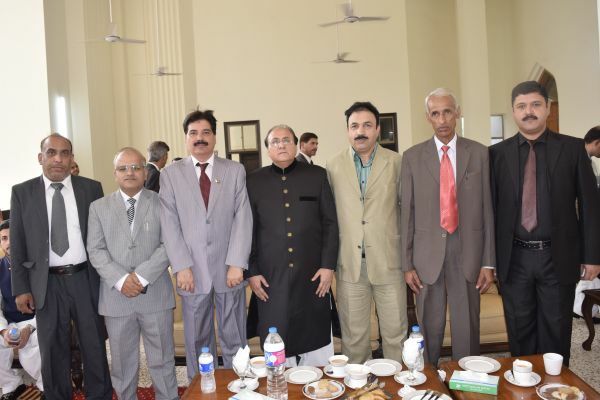 Group photos on the occasion of annual lunch hosted by Hon’ble Chief Justice & Judges Supreme Court of AJ&K in the honour of former Chief Justices and Judges of Supreme Court and incumbent and former Chief Justices and Judges of High Court of AJ&K on 26th Oct. 2017 at Supreme Court Rest House Mirpur. 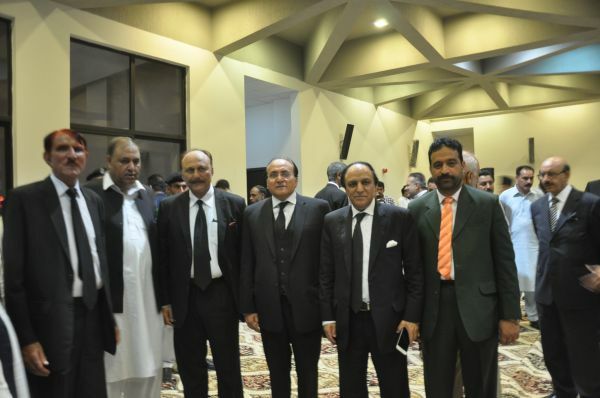 At the eve of retirement of Secretary Law Justice and parliamentary Affairs Mr Muhammad idrees Tabasum farewell by Honble Chief Justice of AJ&k Honble Judges of Supreme Court and High Court. 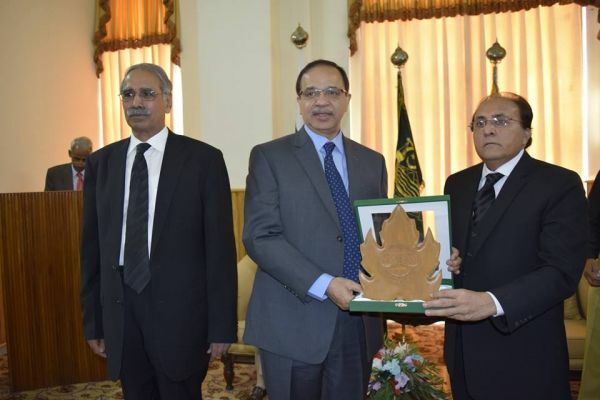 A shield was presented to outgoing Secretary Law by the Honble Chief Justice for his tremendous services in Govt and Law Dept. 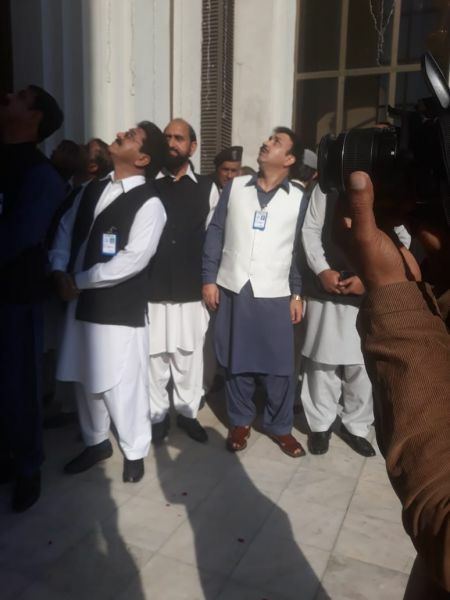 In particular. 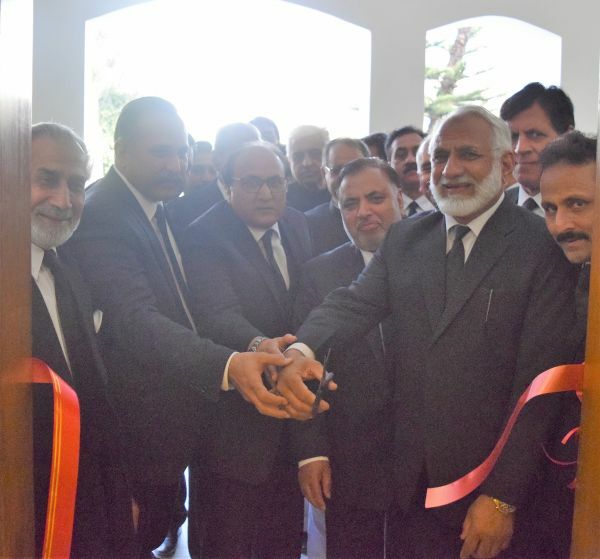 A new judicial year opening ceremony was held on the 2nd of October, 2017 at 9 am in Supreme Court Building Muzaffarabad Azad Kashmir. 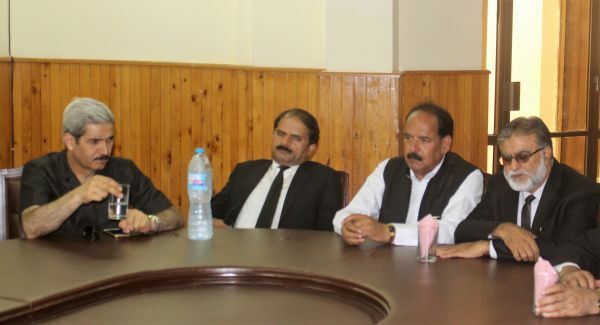 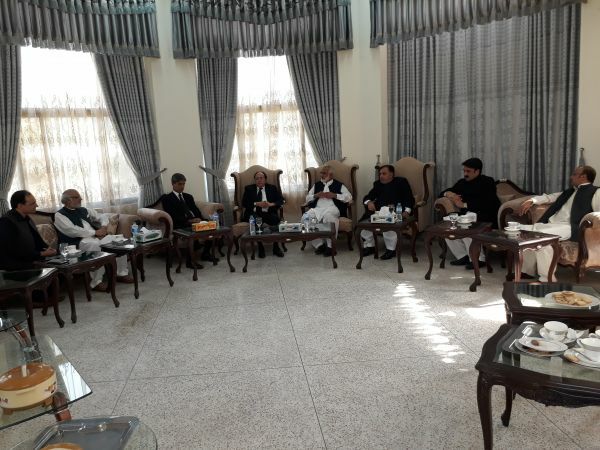 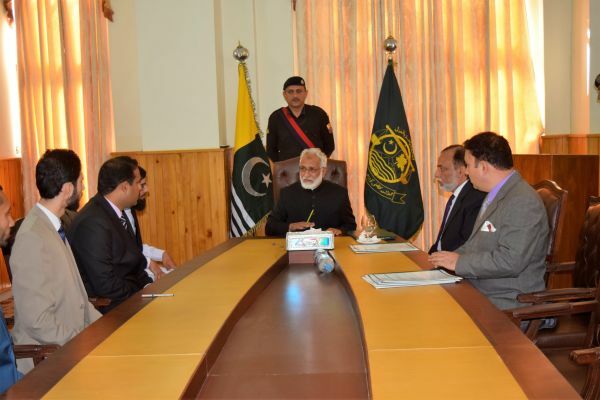 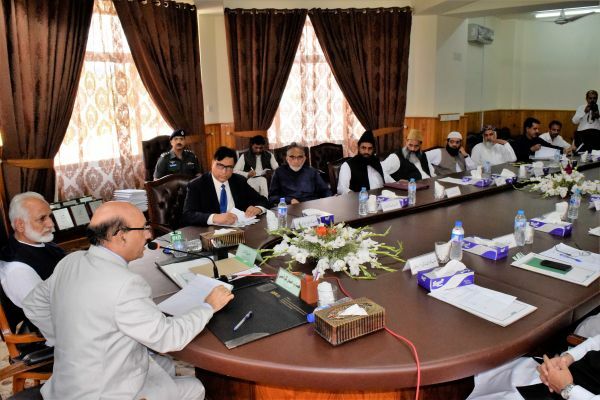 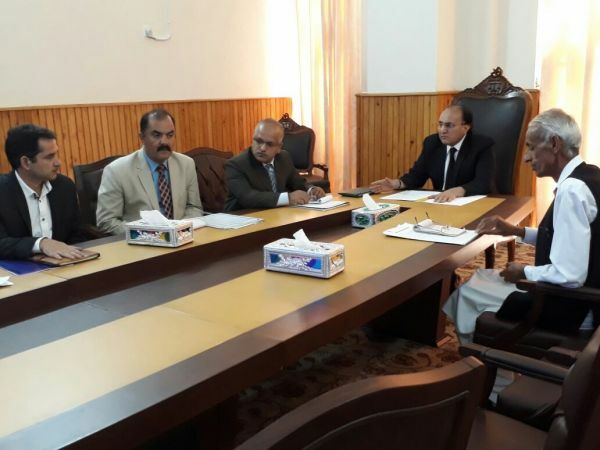 A meeting was held under the chair of Honorable Acting Chief Justice of Azad Jammu & Kashmir Mr. Justice Raja Saeed Akram Khan regarding Automation of Supreme Court Offices at Muzaffarabad Mirpur & Rawalakot. 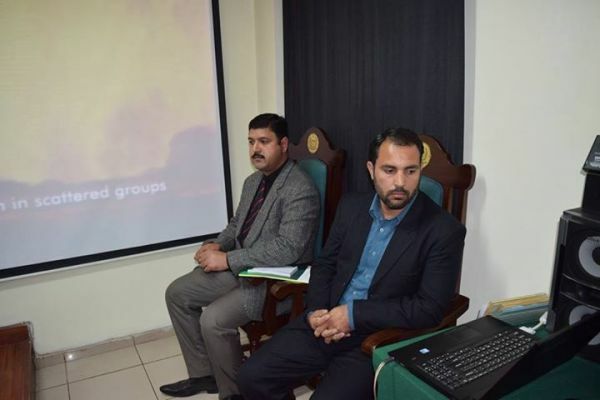 Director General Information Technology Board Dr. Khalid Rafique briefed the forum about the project’s progress. 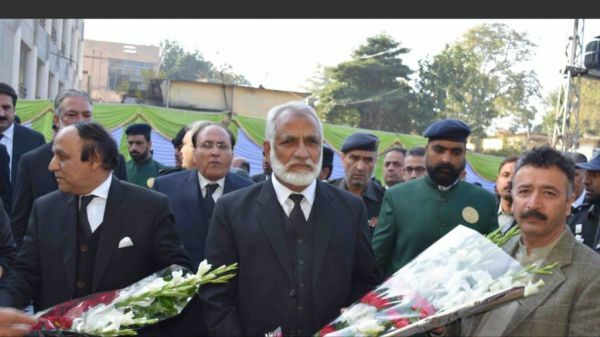 Mr. Justice Raja Saeed Akram Khan, Acting Chief Justice of Azad Jammu & Kashmir and Mr. Justice Ghulam Mustafa Mughal Hon’ble Judge Supreme Court of Azad Jammu & Kashmir at Pakistan’s 70th Independence day function on 14th August 2017, arranged in Supreme Court Building Muzaffarabad. 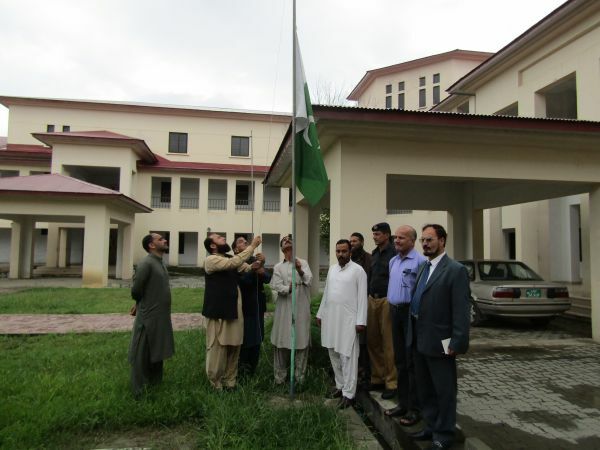 Pakistani flag was raised by Hon’ble Acting Chief Justice followed by salute by a contingent of AJK police. 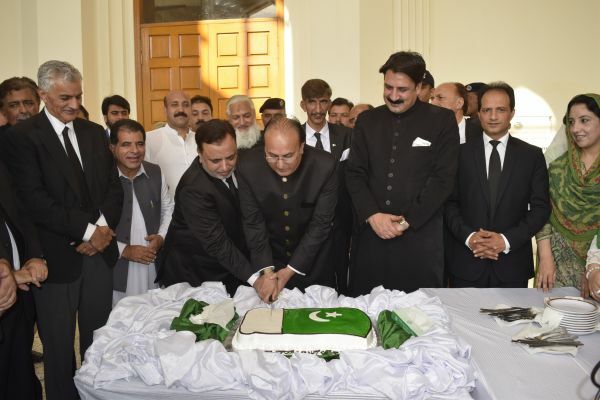 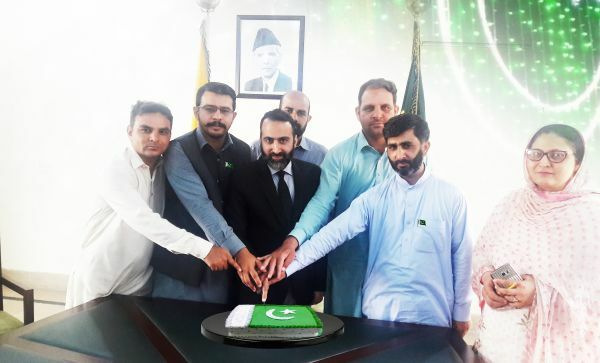 A cake was cut by the Hon’ble Acting Chief Justice at this occasion and dowa was offered to remember the souls of ancestors who paid their lives during their exemplary struggle for the creation and building of Pakistan. 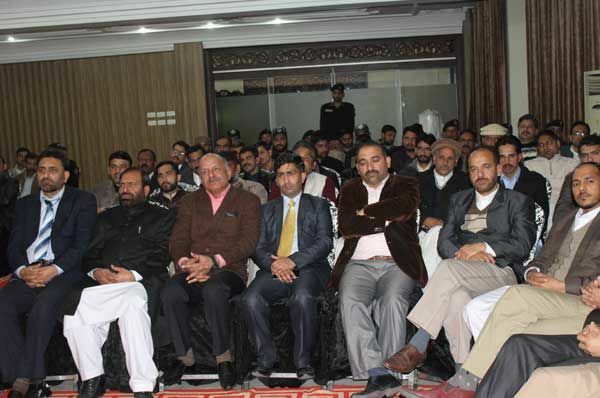 Dowa was also offered for the liberation of Kashmir and success of Kashmir freedom struggle to its logical conclusion. 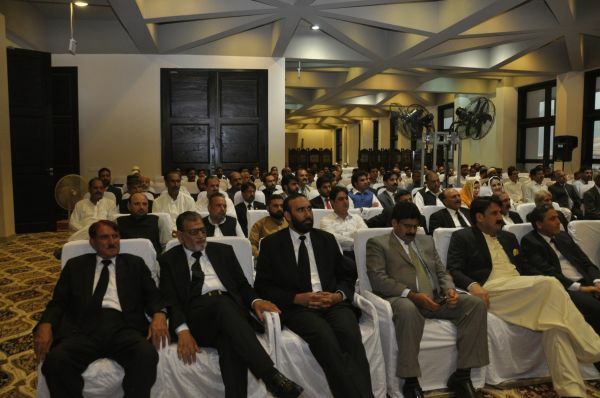 The function was attended by Chairman Service Tribunal Kh. 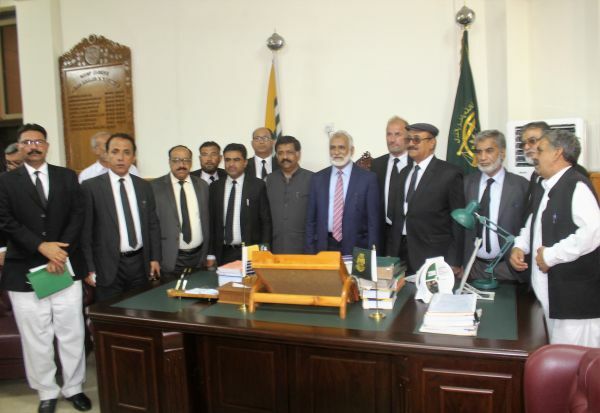 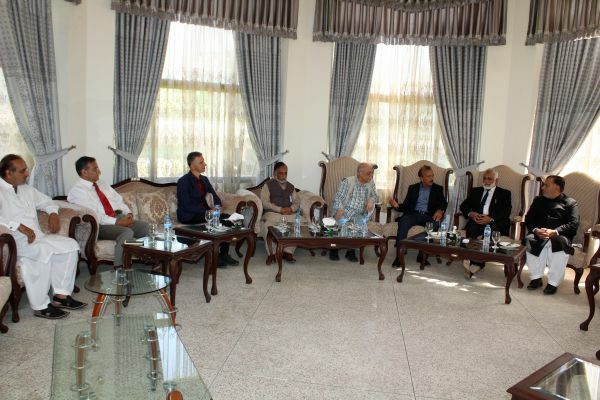 Mohammad Naseem, members service Tribunal, Registrar Supreme Court, Senior Lawyers and Supreme Court staff members besides the police guards. 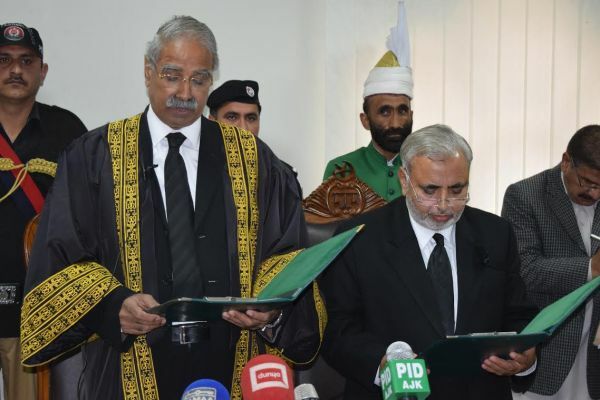 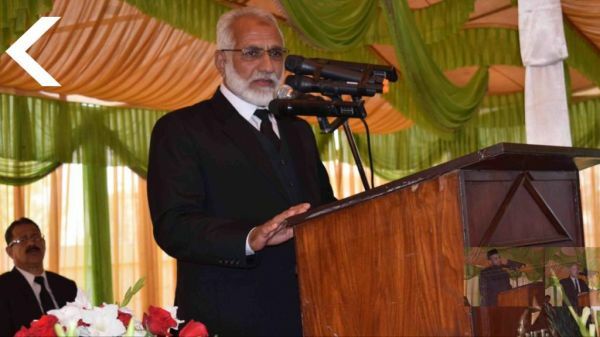 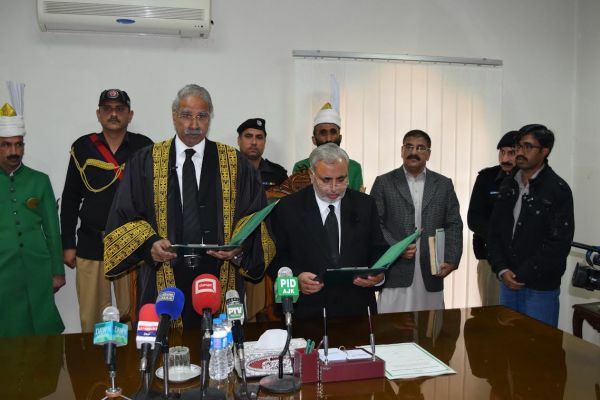 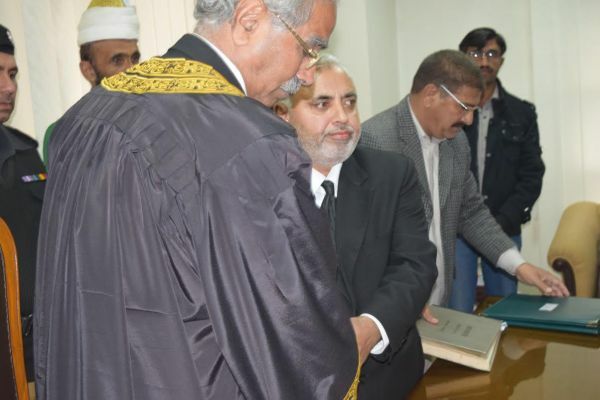 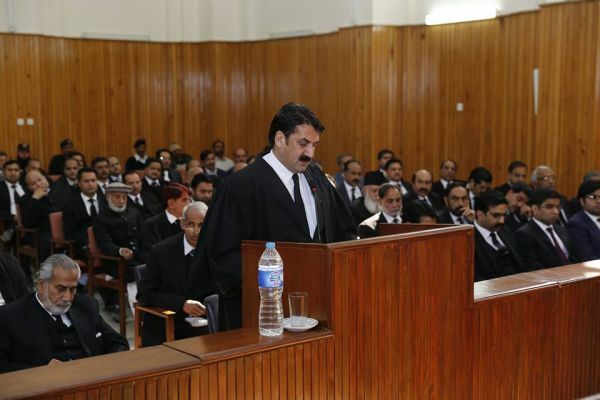 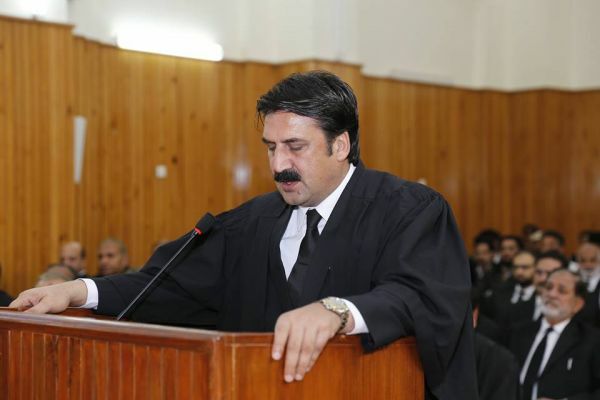 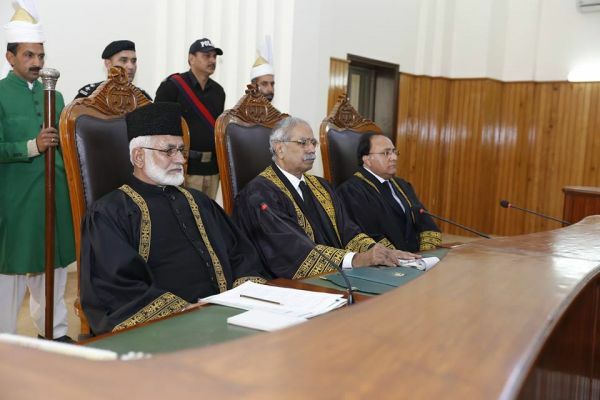 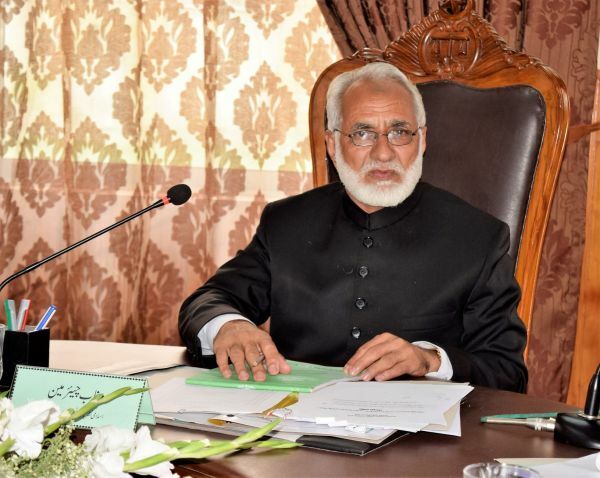 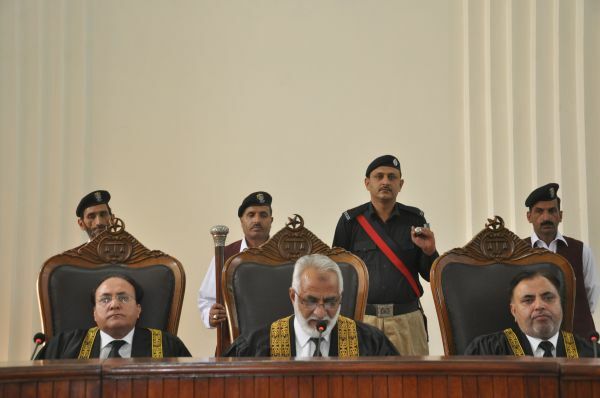 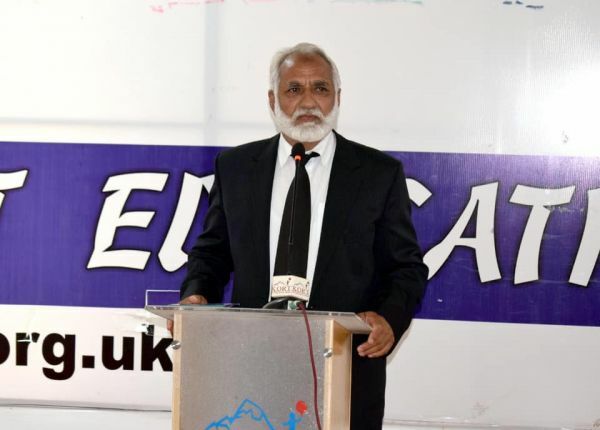 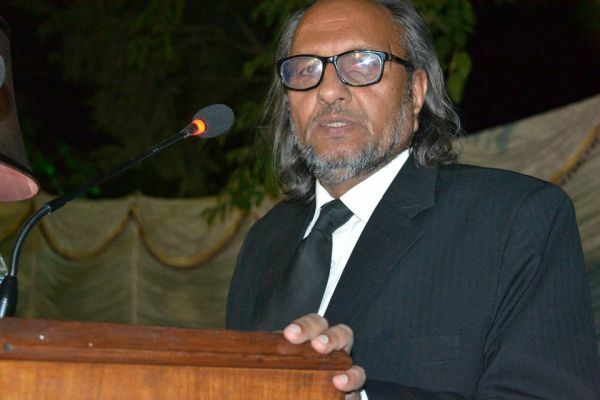 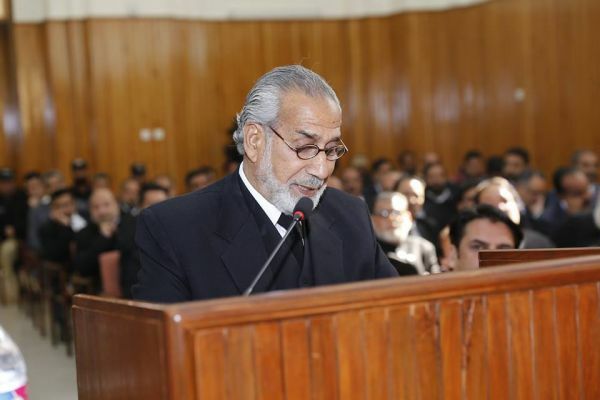 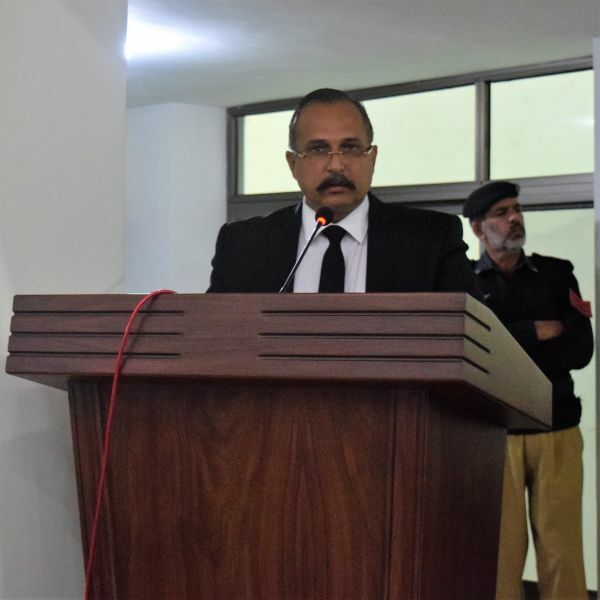 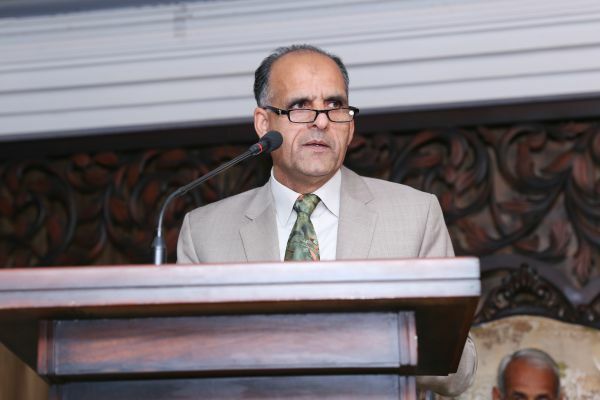 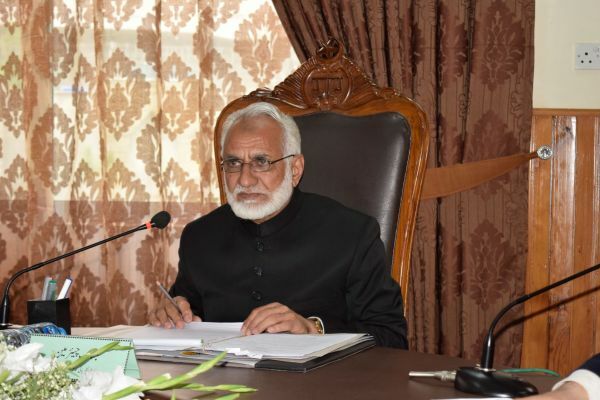 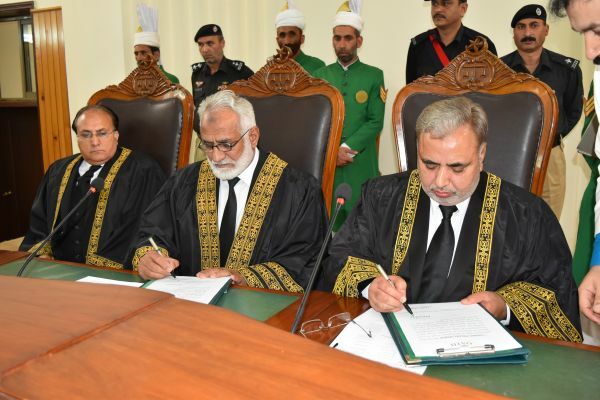 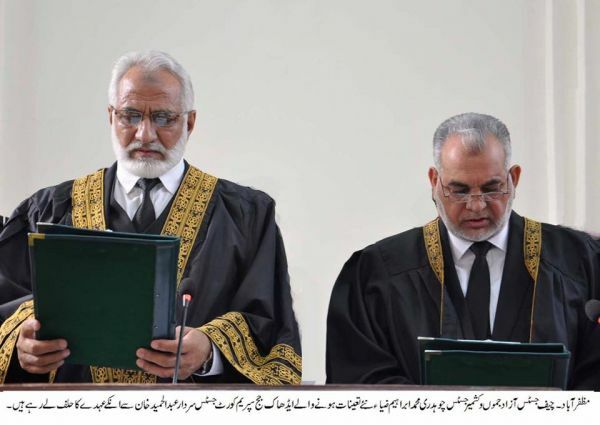 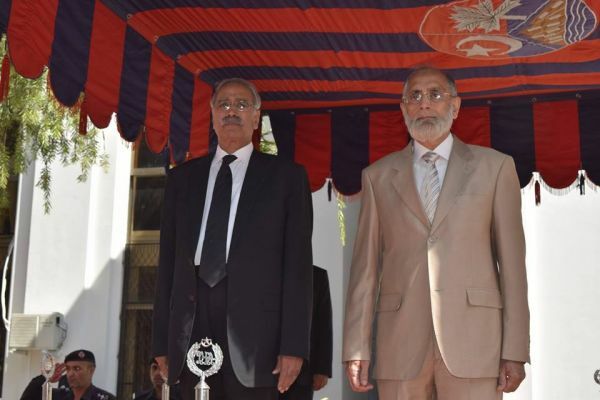 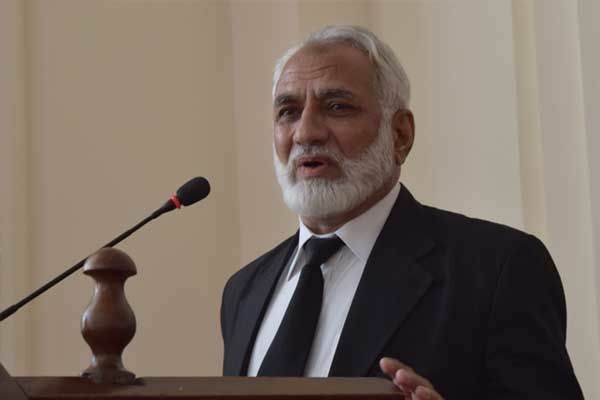 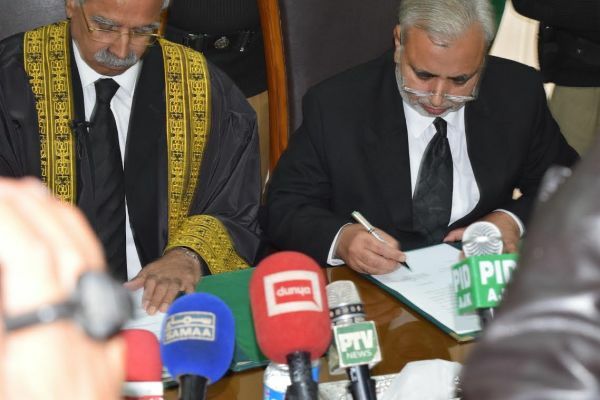 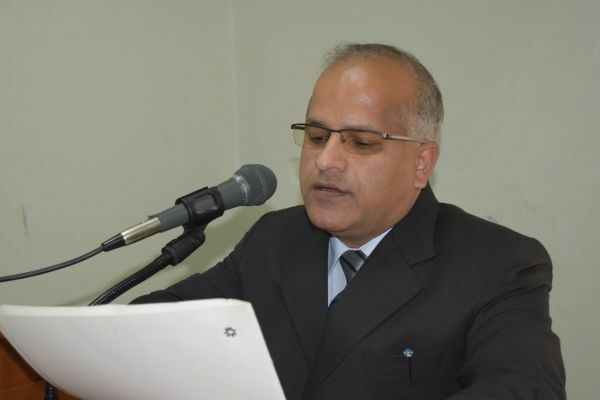 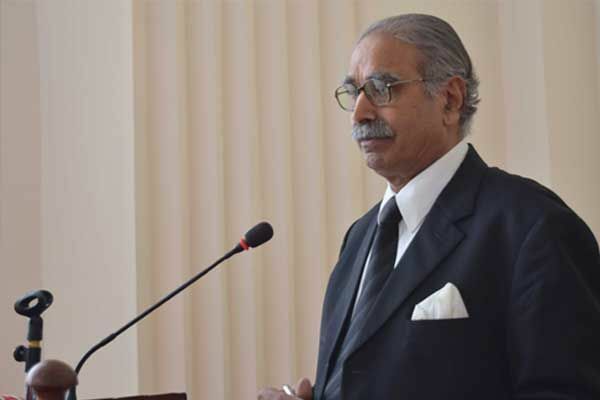 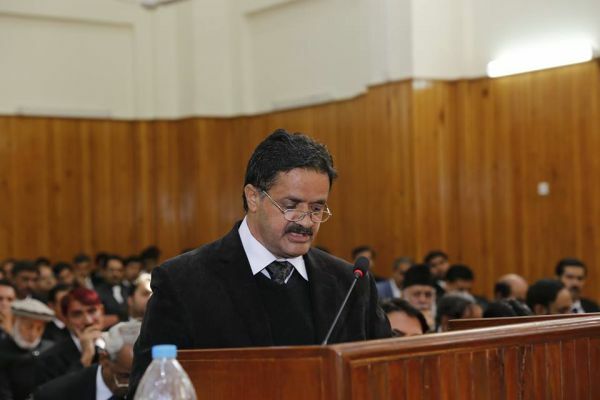 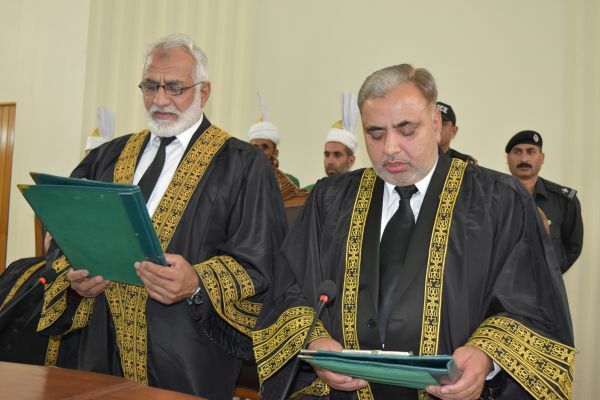 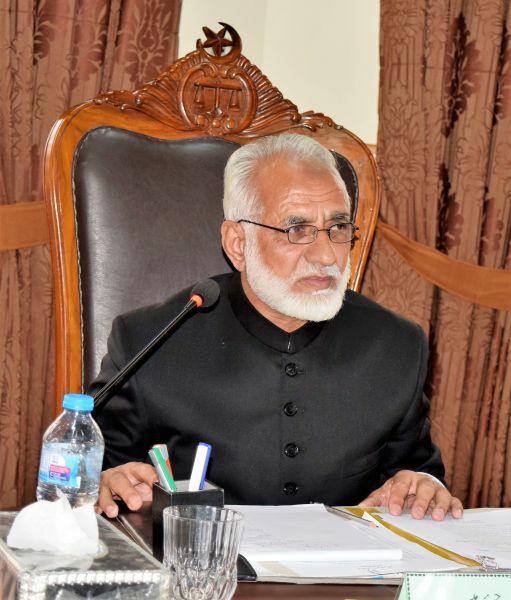 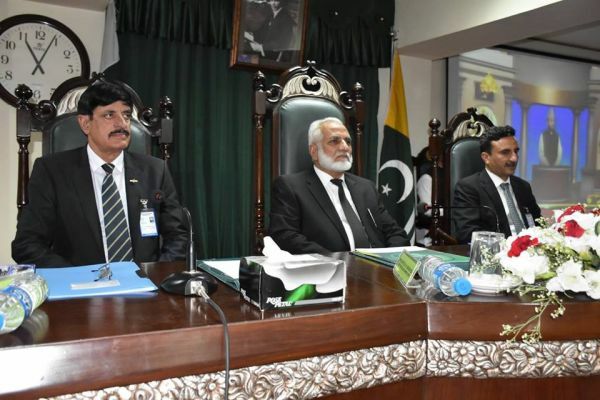 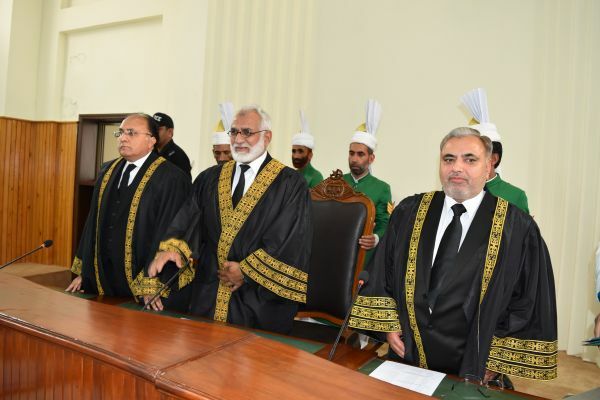 The senior Judge of Azad Jammu and Kashmir Supreme Court Mr. Justice Raja Saeed Akram Khan has taken oath as Acting Chief Justice of Azad Jammu and Kashmir. 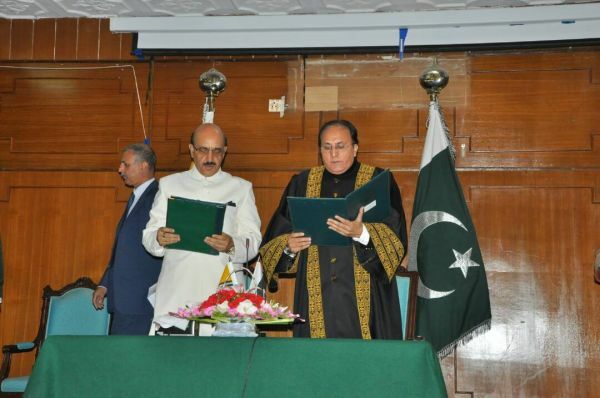 President Azad Kashmir Sardar Muhammad Masood Khan administered oath to him at President House in Muzaffarabad on Sunday 13th August 2017. 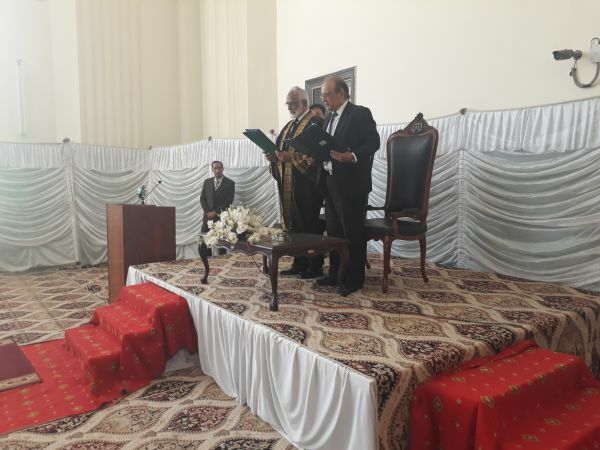 The senior Judge of Azad Jammu and Kashmir Supreme Court Mr. Justice Raja Saeed Akram Khan has taken oath as Acting Chief Justice of Azad Jammu and Kashmir. 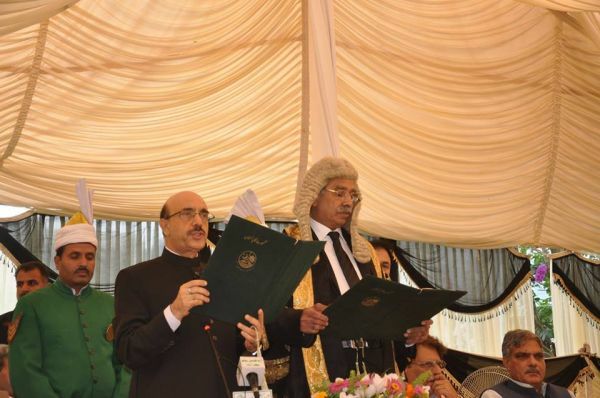 President Azad Kashmir Sardar Muhammad Masood Khan administered oath to him at Kashmir House in Islamabad on Sunday 11th June 2017. 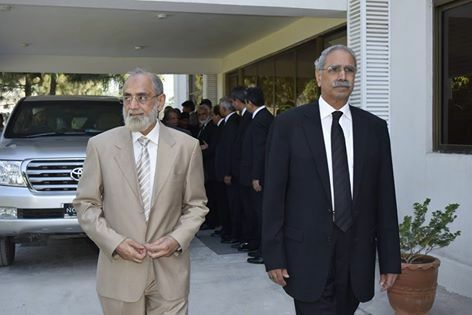 Mr. Justice Ch. 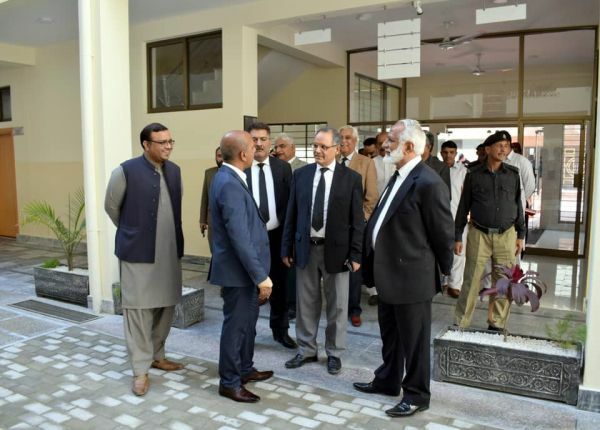 Muhammad Ibrahim Zia, Hon’ble Chief Justice of Azad Jammu & Kashmir and Mr. Justice Raja Saeed Akram Khan, Hon’ble Judge Supreme Court of Azad Jammu & Kashmir, visited to Central Jail Mirpur. 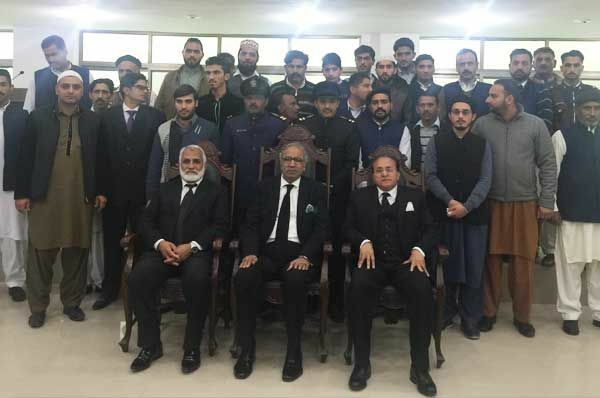 25th February 2017 - Oath taking ceremony of Hon’ble Chief Justice of Azad Jammu & Kashmir Mr. Justice Ch. 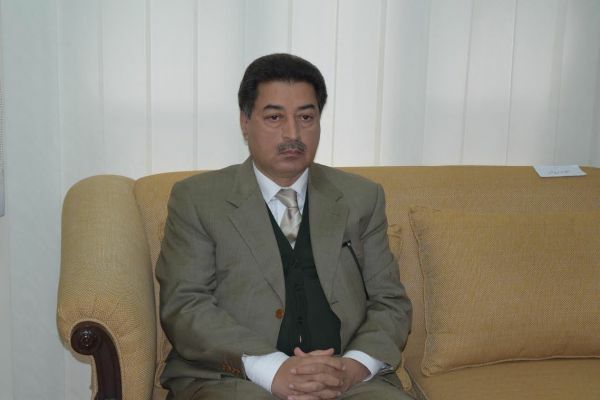 Muhammad Ibrahim Zia. 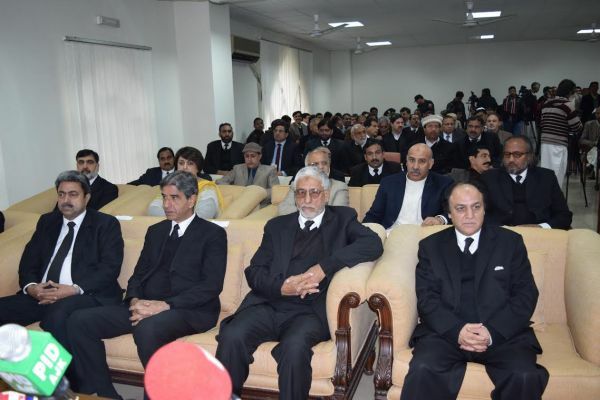 24th February 2017 - A Full Court Reference held at SUPREME COURT AZAD JAMMU & KASHMIR on the eve of retirement of HONORABLE Mr. JUSTICE MUHAMMAD AZAM KHAN CHIEF JUSTICE OF AZAD JAMMU KASHMIR. 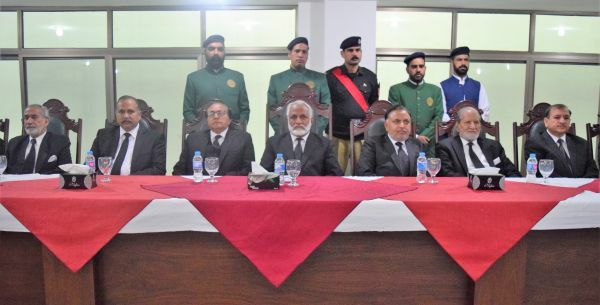 22nd February 2017 – Addressed the gathering and attended the farewell dinner hosted by the establishment of the Azad Jammu & Kashmir Supreme Court at Neelum View Hotel, Muzaffarabad. 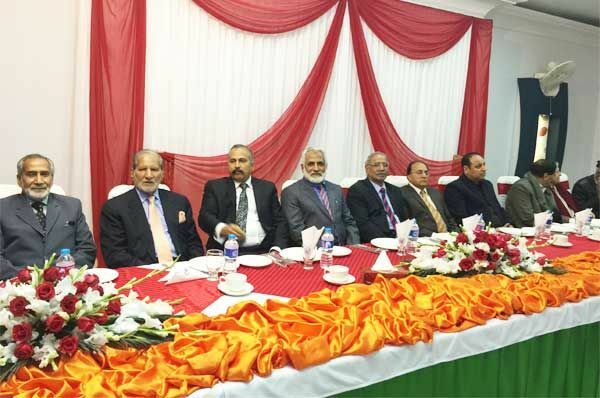 5th February 2017 -Attended breakfast hosted by Ch. 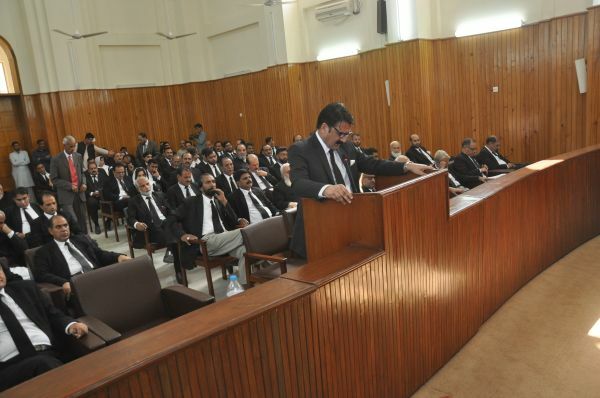 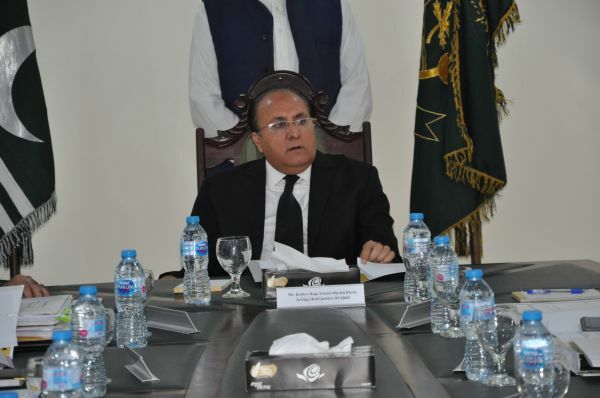 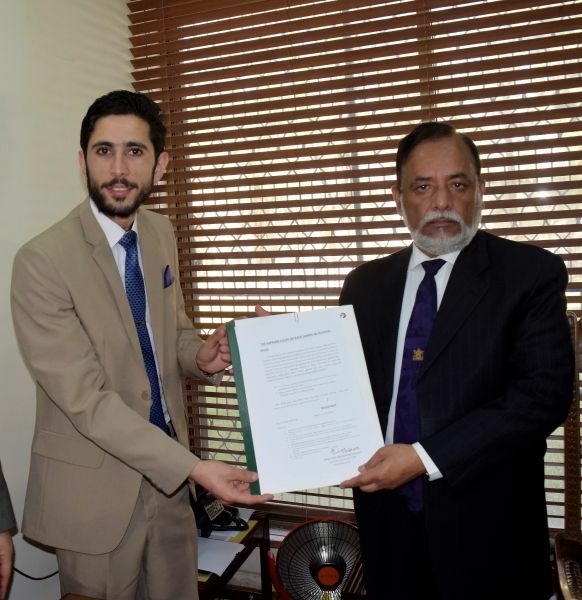 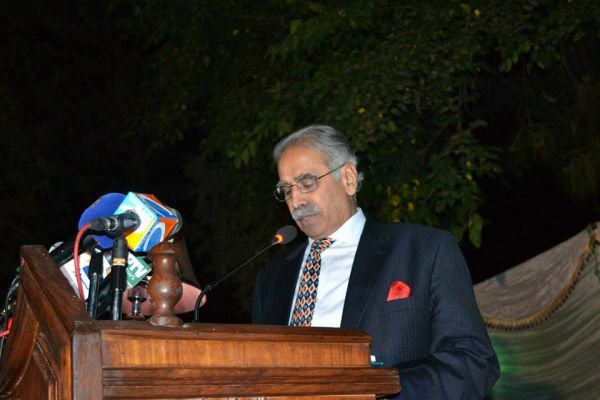 Ashraf Ayaz, Additional Advocate-General. 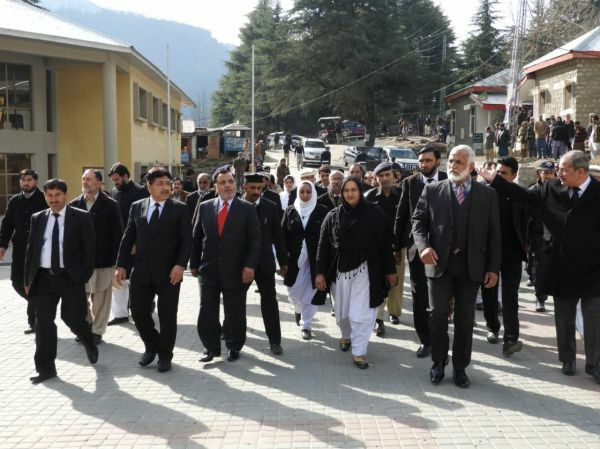 Reached Pallandari. 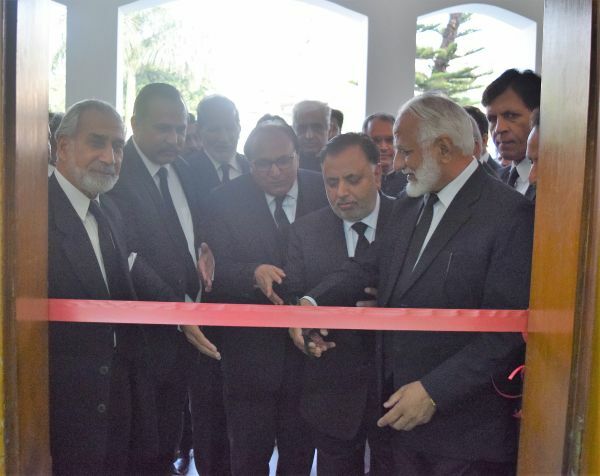 Proceeded to Pallandari, Inaugurated the Bar Library established by Mr. Justice (R) Sardar Abdul Hameed Khan, addressed District Bar Pallandari at Cadet College Pallandari Auditorium Hall, attended farewell dinner hosted by Bar and tea hosted by Sardar Amjad Aslam Khan advocate. 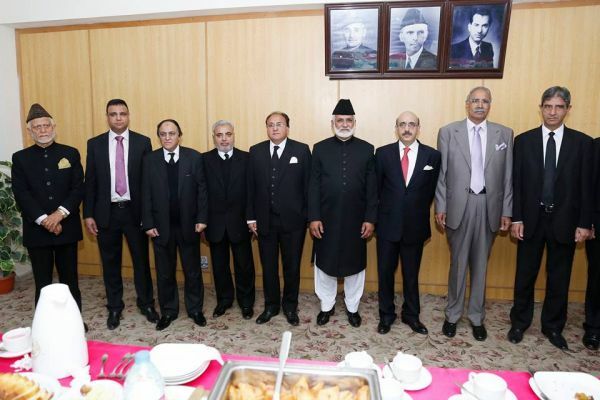 Attended dinner hosted by Justice (R) Sardar Abdul Hameed Khan, advocate. 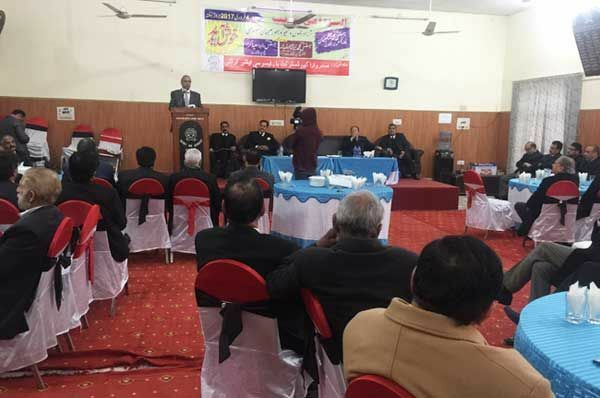 4th February 2017 – Addressed the office-bearers and members of District Bar Kotli at Kotli and attended the farewell lunch hosted by Bar. 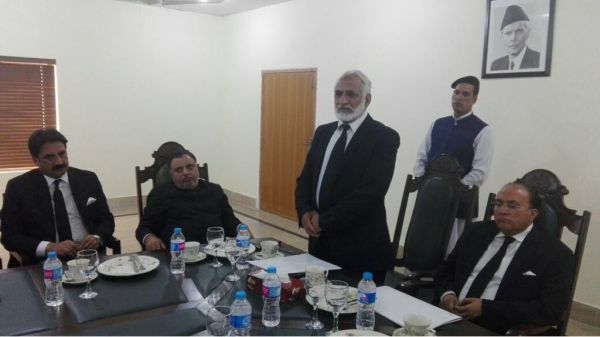 Offered Fatiha of Late Malik Muhammad Yousaf Advocate and attended the farewell dinner hosted by Ch. 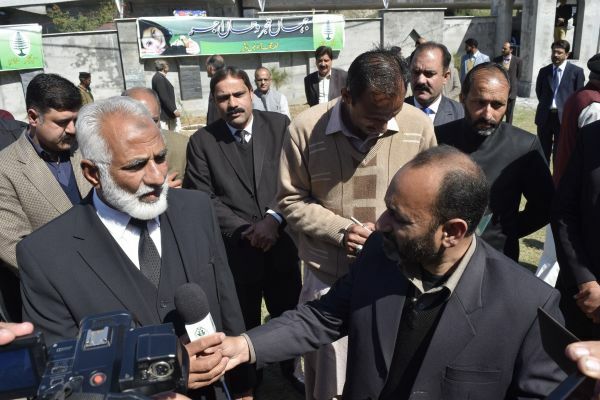 Mehboob Elahi advocate at Sadat Marriage Hall Kotli. 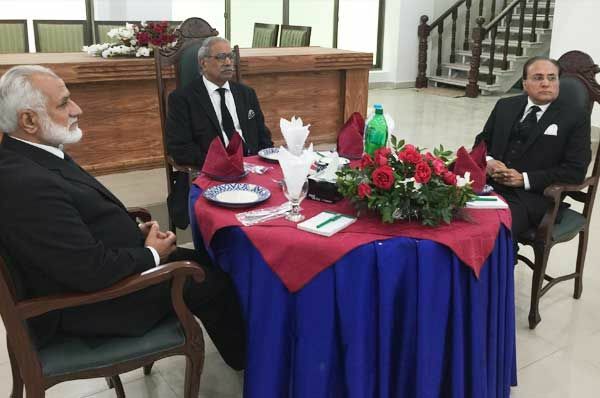 2nd February 2017 – Attended the farewell lunch hosted by the AJ&K Supreme Court staff at Mirpur. 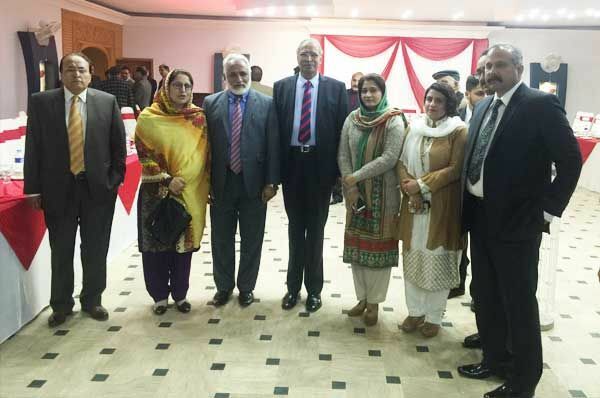 Attended the farewell dinner hosted by Raja Khalid Mehmood Khan, advocate, Mirpur. 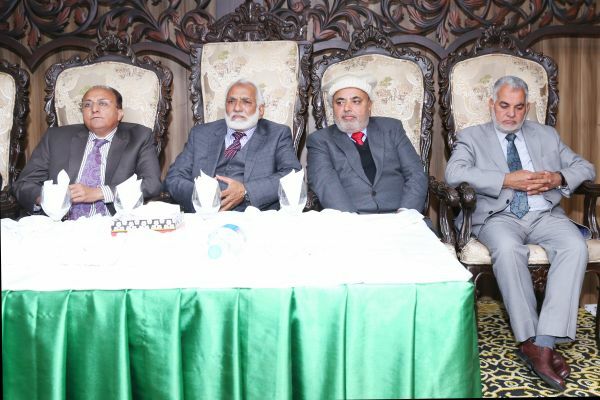 21st February 2017 – Attended the farewell lunch hosted by Raja Khalid Mehmood Khan, Mr. Imtiaz Ahmed Raja and Mr. Khalid Yousaf, advocates, at Regency Hotel Mirpur. 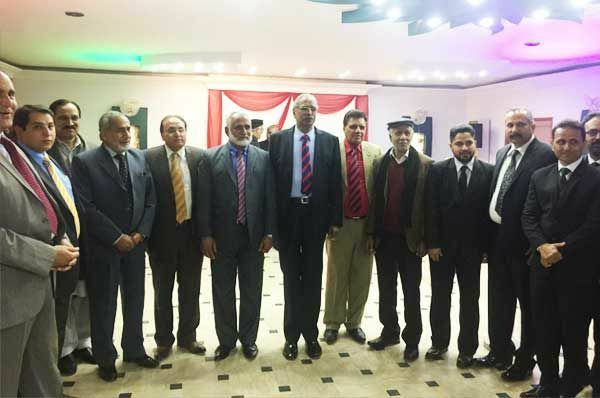 Attended the farewell dinner hosted by Raja Inaamullah Khan, advocate at Nafees Marriage Hall, Mirpur. 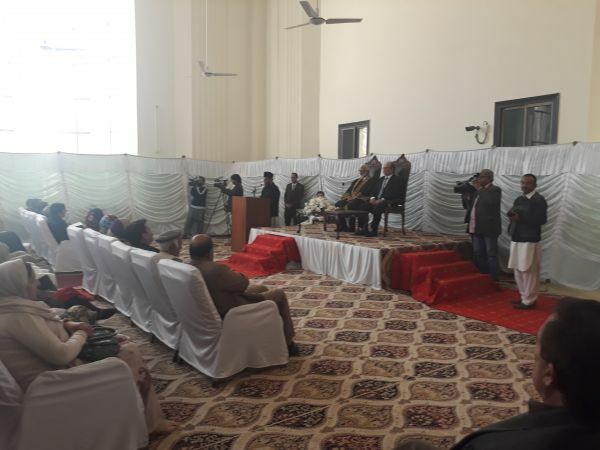 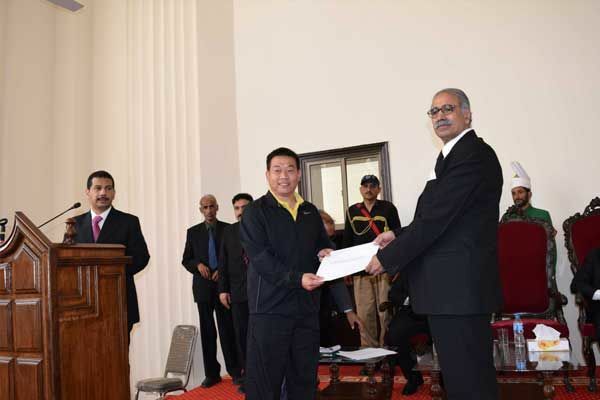 Oath Taking Ceremony of newly elected President. 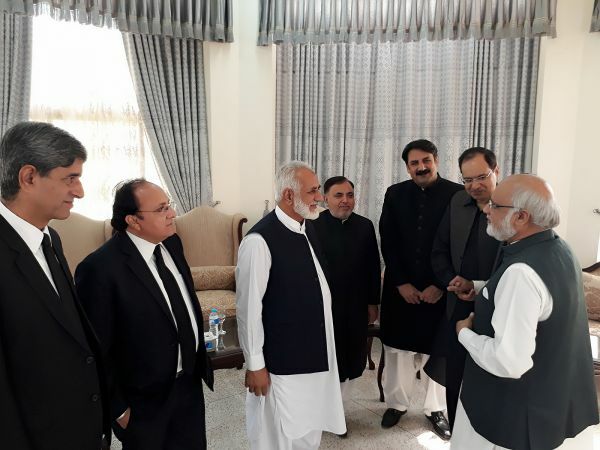 Hon’ble Mr. Justice Muhammad Azam Khan, Chief Justice of Azad Jammu & Kashmir offered breakfast to Hon’ble Mr. Justice Anwar Zaheer Jamali, Chief Justice of Pakistan at Supreme Court Muzaffarabad. 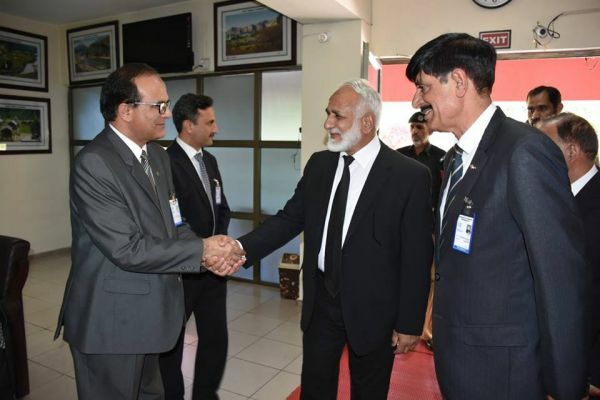 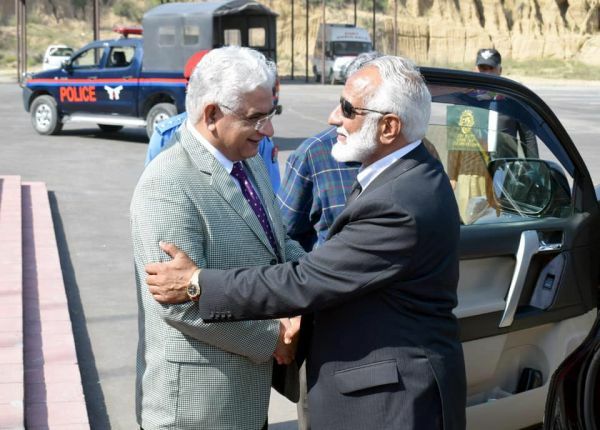 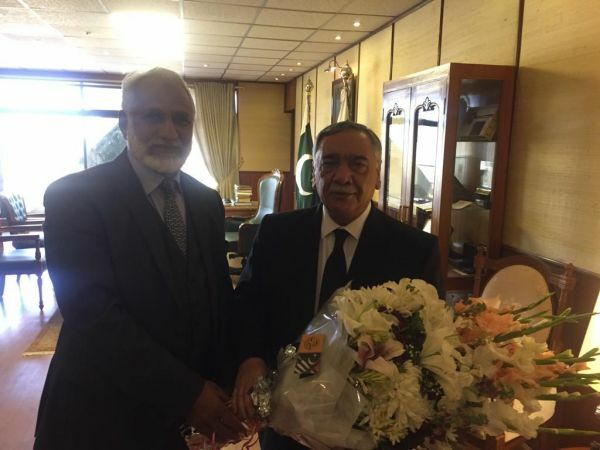 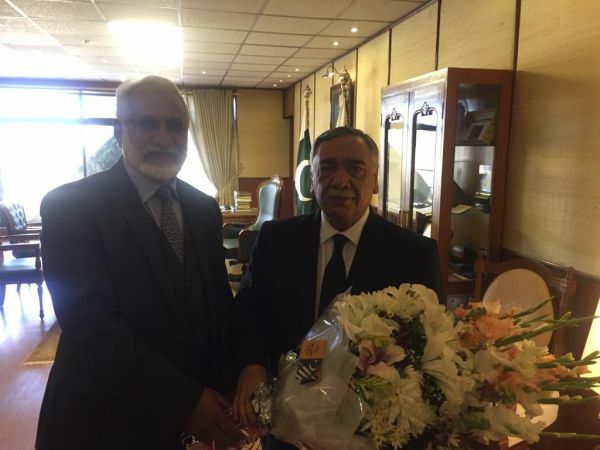 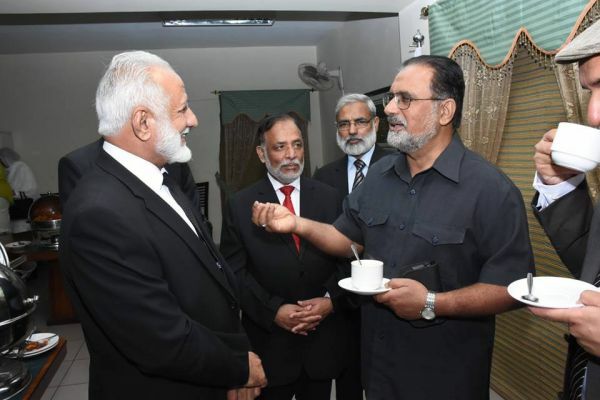 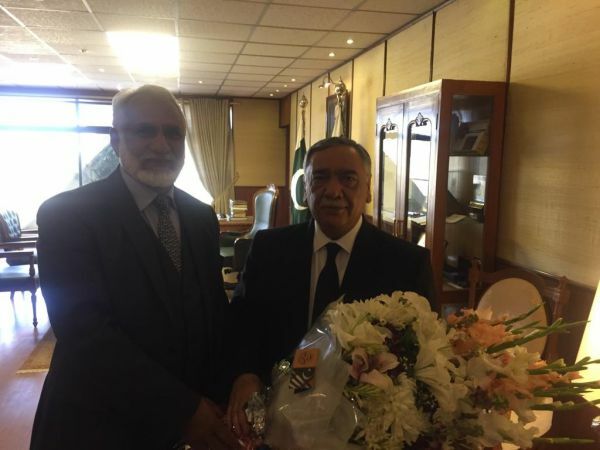 Hon’ble Mr. Justice Muhammad Azam Khan, Chief Justice of Azad Jammu & Kashmir warmly welcomed Hon’ble Mr. Justice Anwar Zaheer Jamali, Chief Justice of Pakistan at Supreme Court Muzaffarabad. 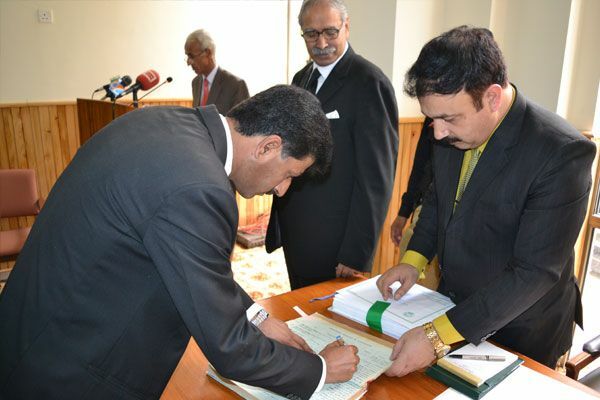 On 5th May, 2016 Roll Signing Ceremony arranged by the Supreme Court AJ&K in Supreme Court building Muzaffarabad. 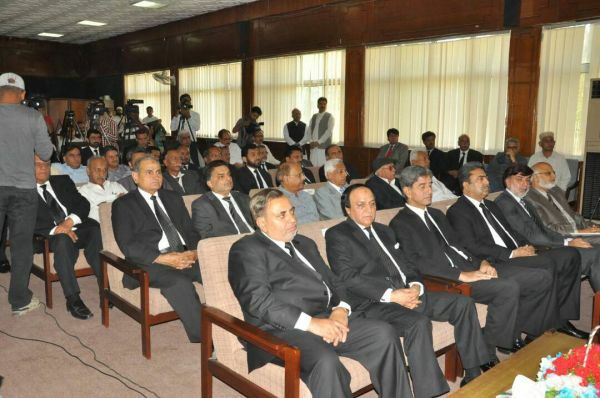 Inauguration ceremony of Supreme Court. 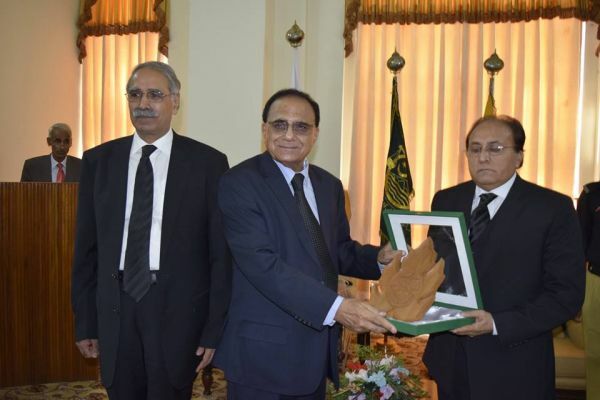 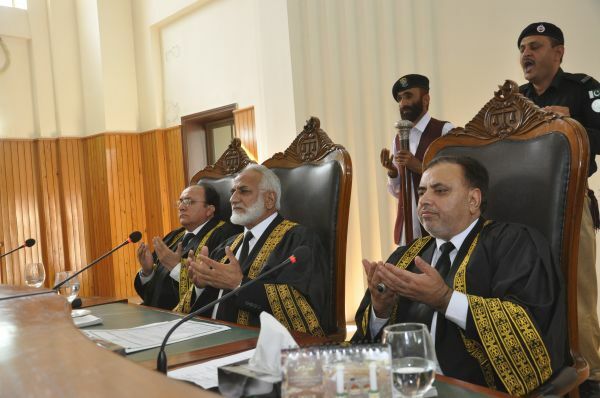 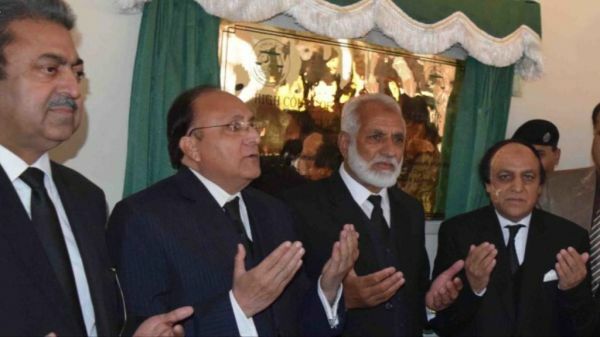 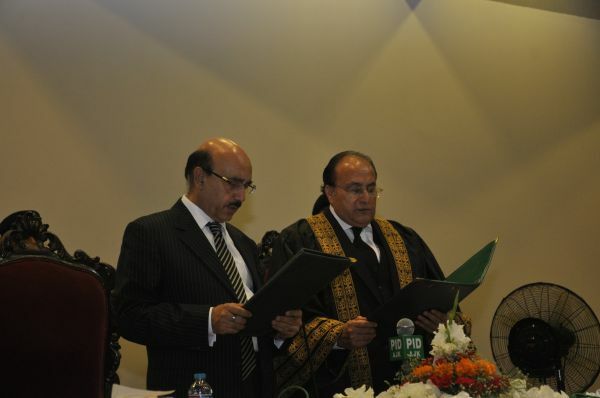 Hon’ble Mr. Justice Muhammad Azam Khan, Chief Justice of Azad Jammu & Kashmir administered oath to Mr. Justice Ghulam Mustafa Mughal Hon’ble Chief Justice High Court of AJ&K in addition to his duties as Chief Election Commissioner of Azad Jammu & Kashmir on 19th February, 2016 at Supreme Court of AJ&K. 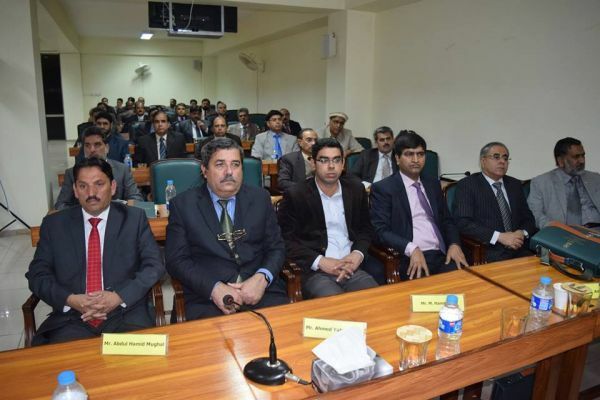 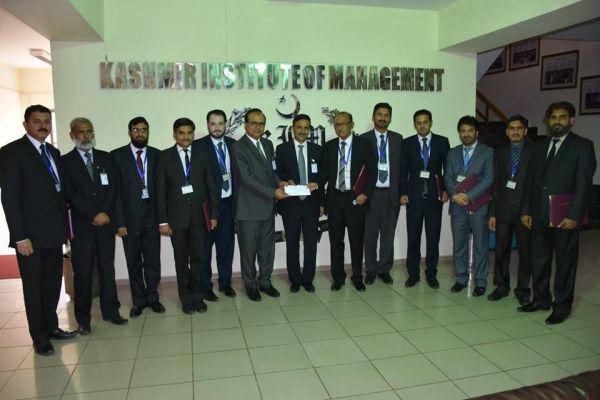 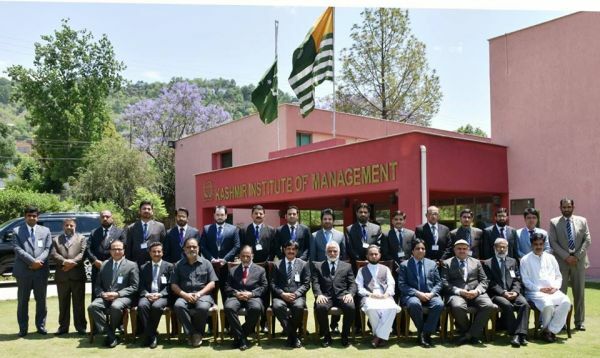 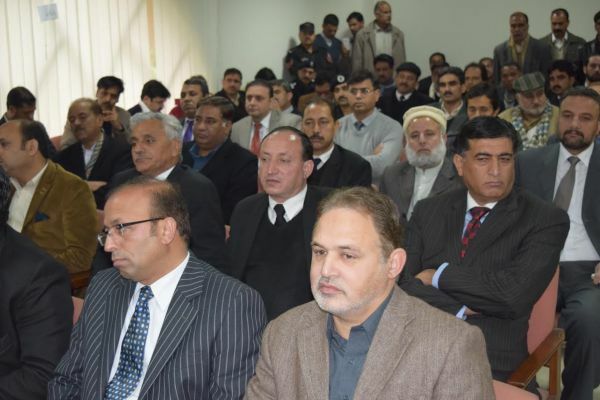 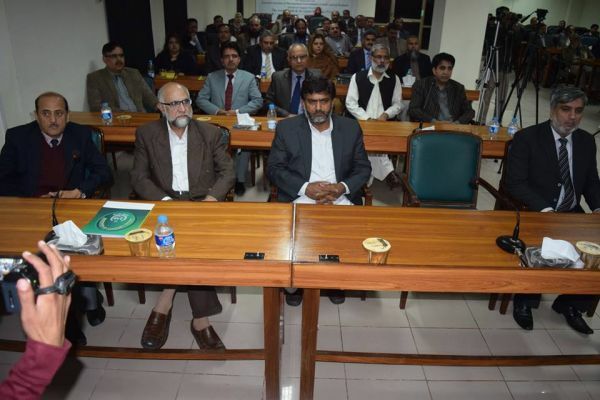 Honorable Mr. Justice Raja Saeed Akram Khan justice of Azad Jammu & Kashmir Supreme Court chaired and addressed the “Result Based Management” at Kashmir Institute of Managment Muzaffarabad at 05-11-2015. 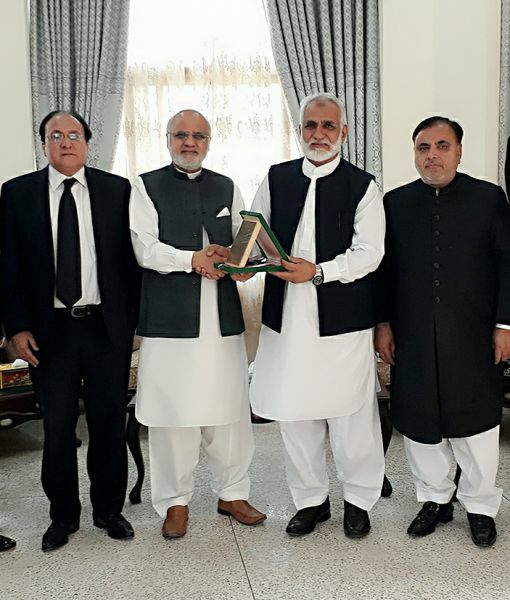 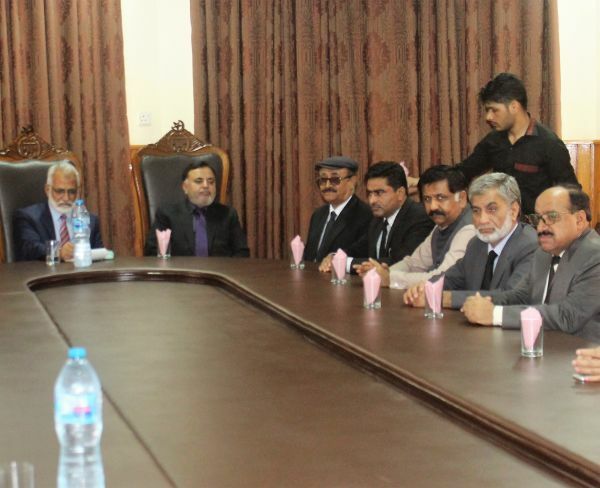 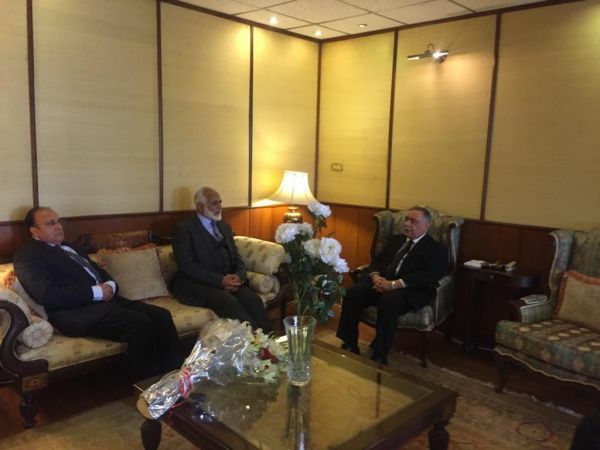 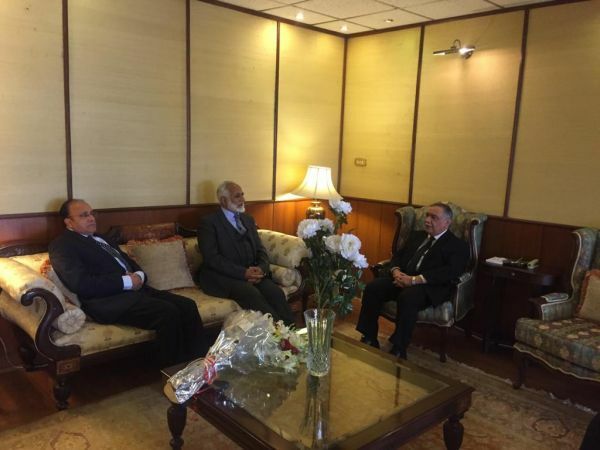 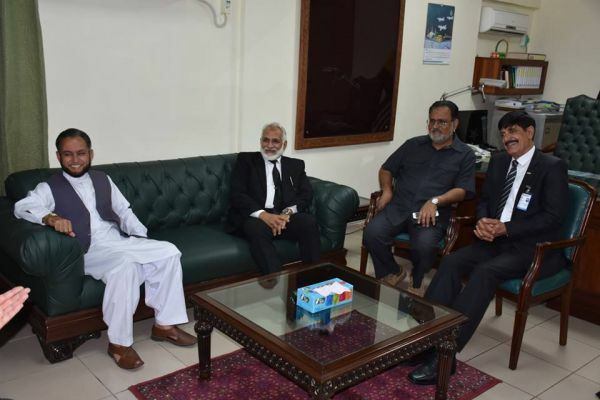 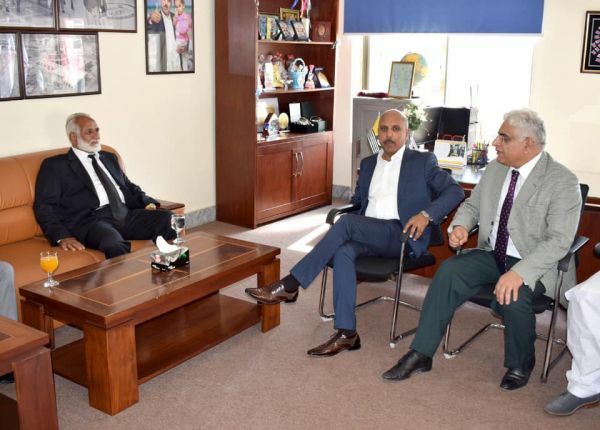 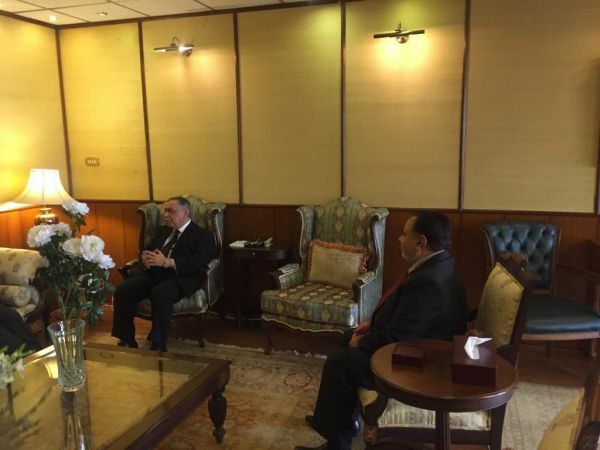 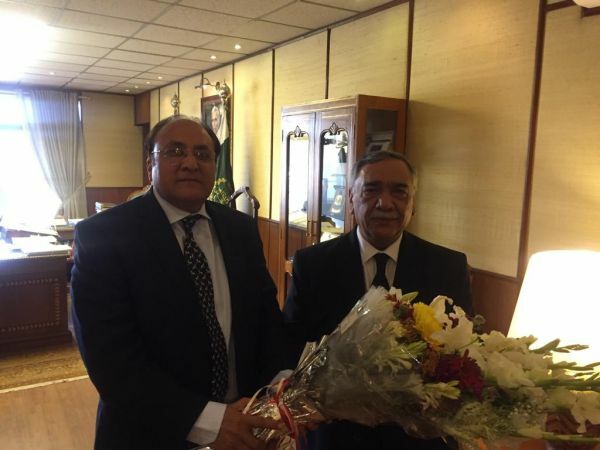 Prof. Dr. Justice (Rtd) Qazi Khalid Ali called on the Hon’ble Chief Justice of AJ&K, Mr Justice Mohammad Azam Khan & Hon’ble Judges of Supreme Court of AJ&K on 30.10.2015 at Supreme Court Branch Registry Mirpur..